I am so far behind in posting, that this one will be brief! 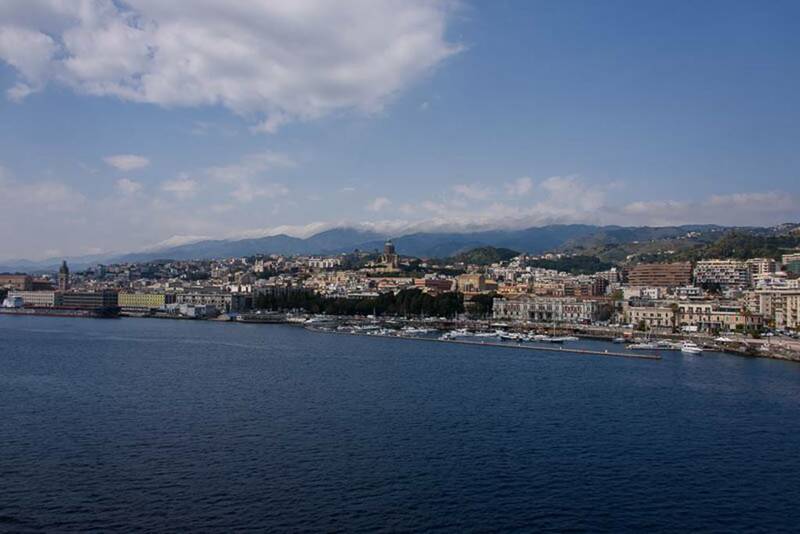 We arrived in Messina, Italy on the island of Sicily, Italy Monday morning. 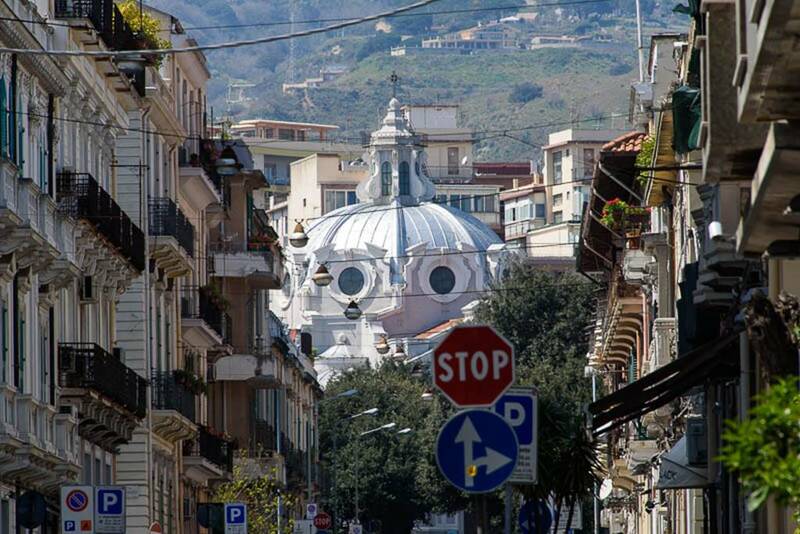 Messina is the third largest city of Sicily and lies on the northeast corner of the island. 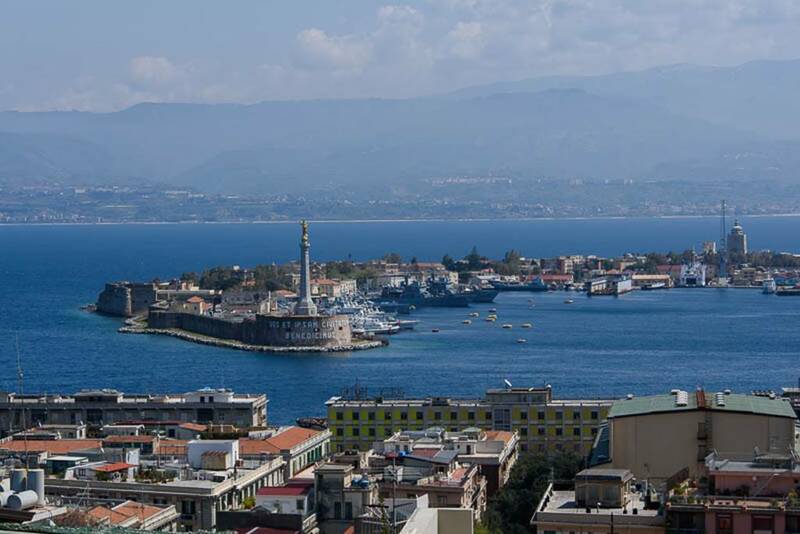 With a bustling port serving as both a military and commercial port. 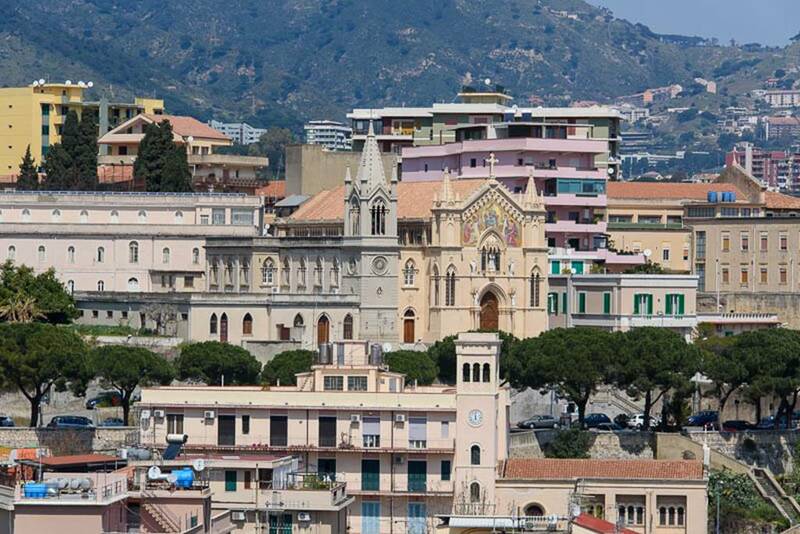 Messina was originally founded by the Greeks in 8th century BC. With a rich history filled with ferocious battles devastating earthquakes, and debilitating disease, the island has a lot to offer tourists. 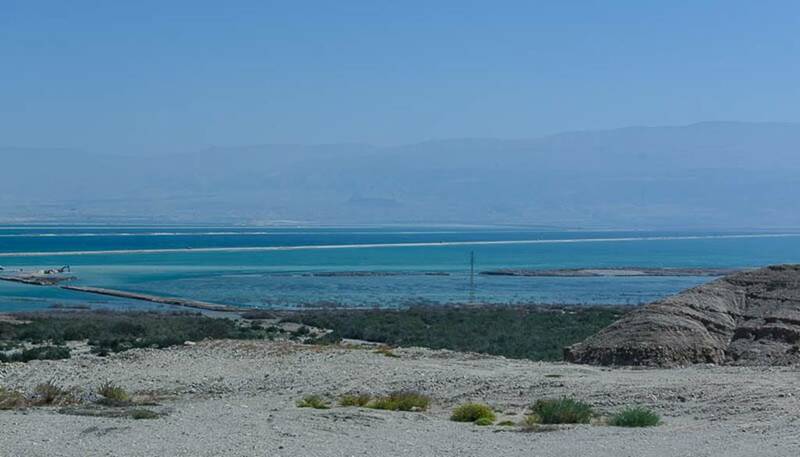 This is a port which was added due to the elimination of the Egyptian ports. We had booked a HAL tour to Mt. Etna, but after realizing the full days we had in Turkey and Greece leading up to this stop, we decided to cancel the Etna trip. It would have taken over 4 hour of bus riding with only a short time at the site. Instead we just walked around on our own. We stopping at a very local small shop in a mostly residential section for lunch. Kay had a calzone and I had a slice of a “pie” stuffed with vegetables. 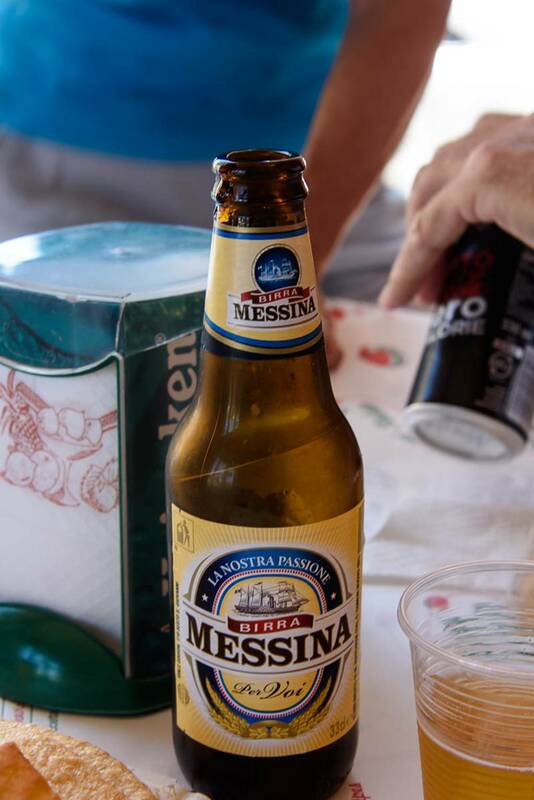 I also had a local beer, a Messina, the total was less than $5.00 US. Anyway, enjoy the photos. 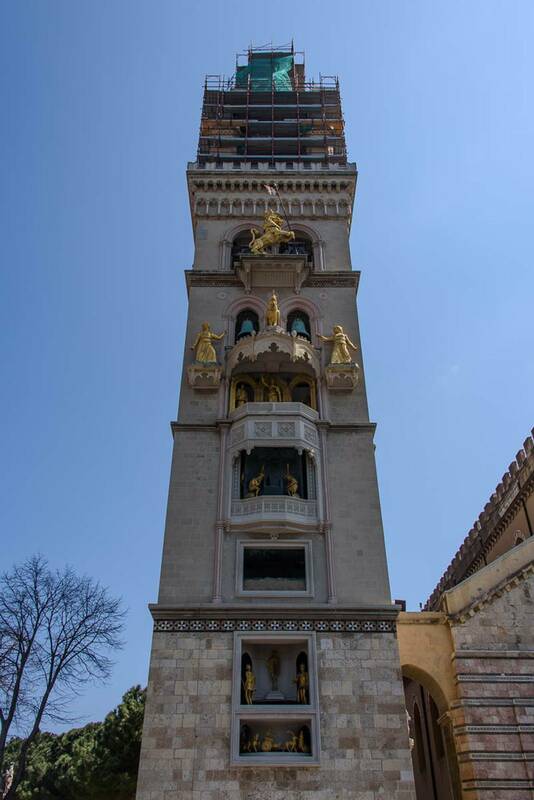 The famous mechanical clock tower. We were fortunate to be there at noon and got to see the “show”. Tomorrow is a sea day, followed by a day in Naples and then Rome. 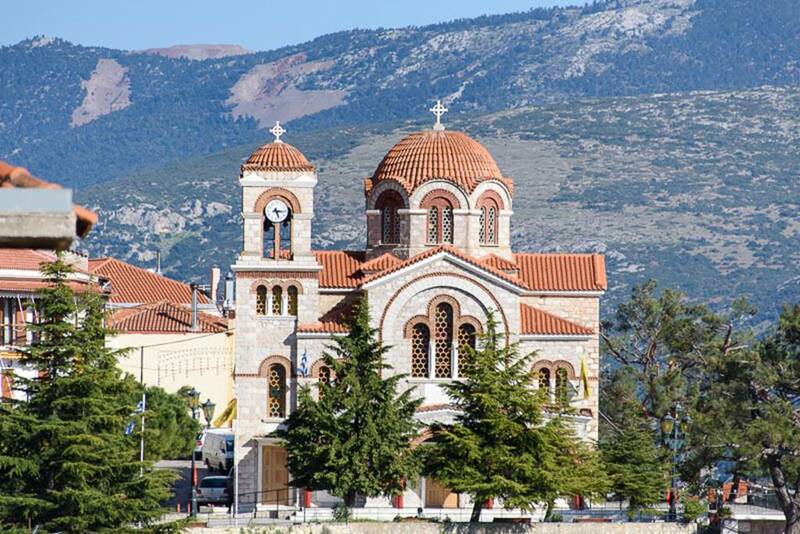 We were again up early for breakfast and on the bus by 8:00 for our travel along the southern Greek coastline on our way to Olympia for the Easter Festival Feast. The first thing I noticed this morning when I looked out was all the smoke. 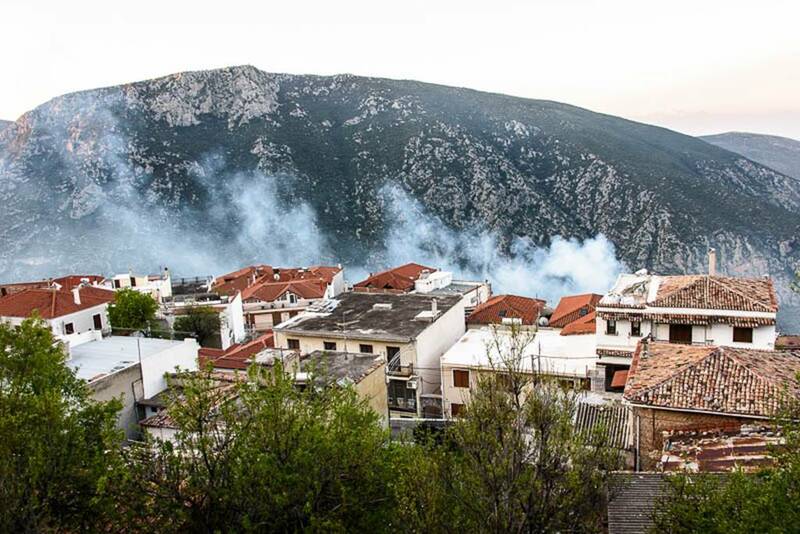 It actually looked like village was burning down! 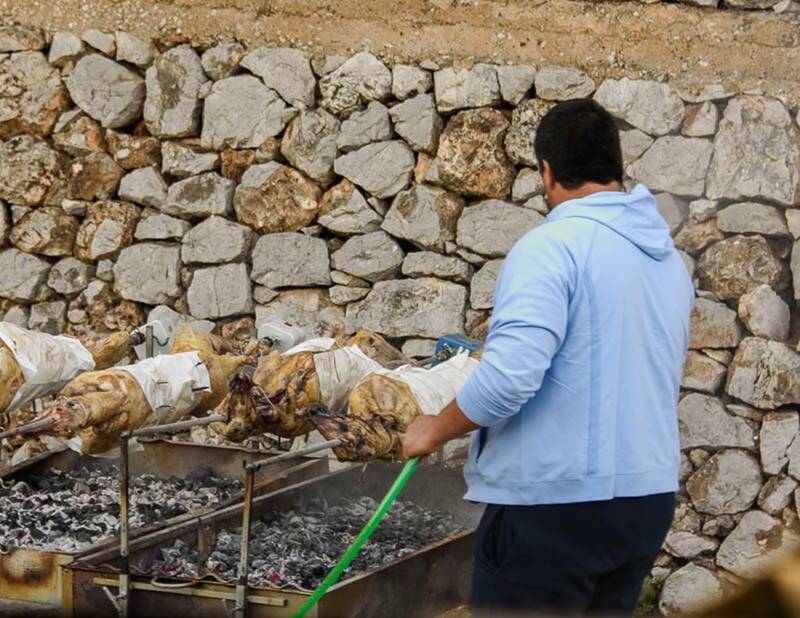 It was simply all the charcoal spits being fired up to grill the traditional lamb for Easter Sunday. The view from the hotel balcony. It looks like everyone has a spit fired up. 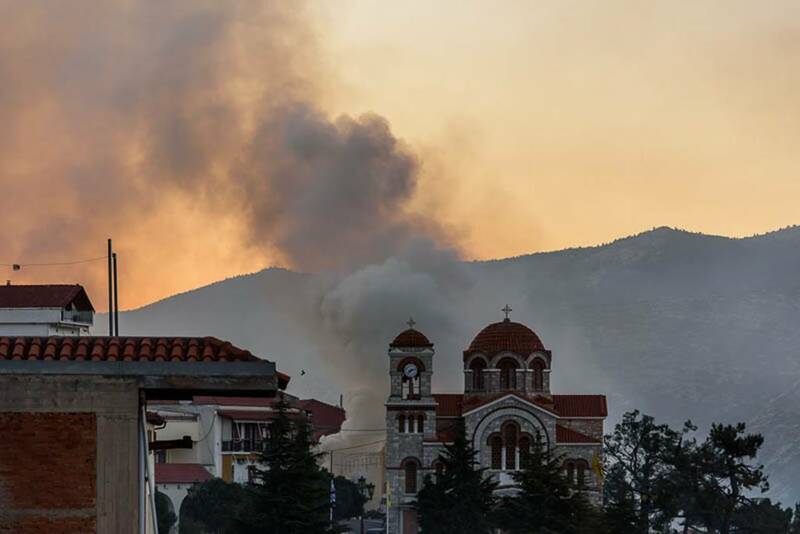 Looking back toward the church, the smoke is even heavier. 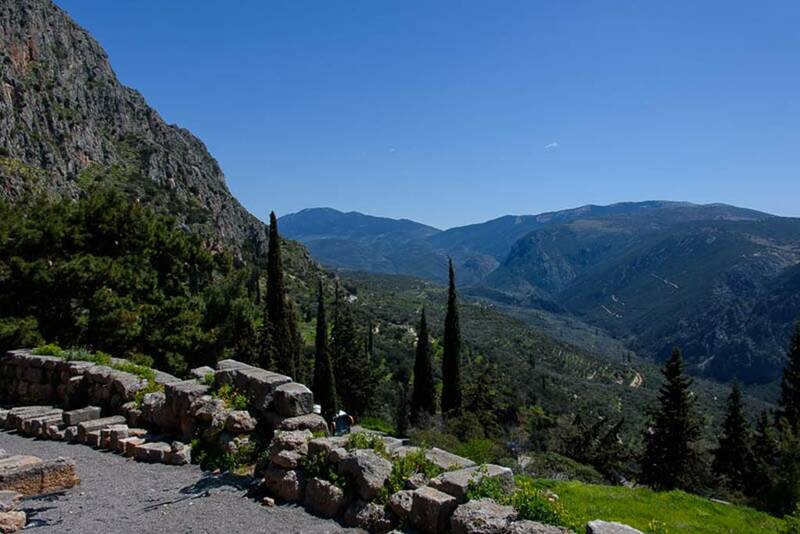 This was at a hotel just down from ours, I took this as we were leaving Delphi. 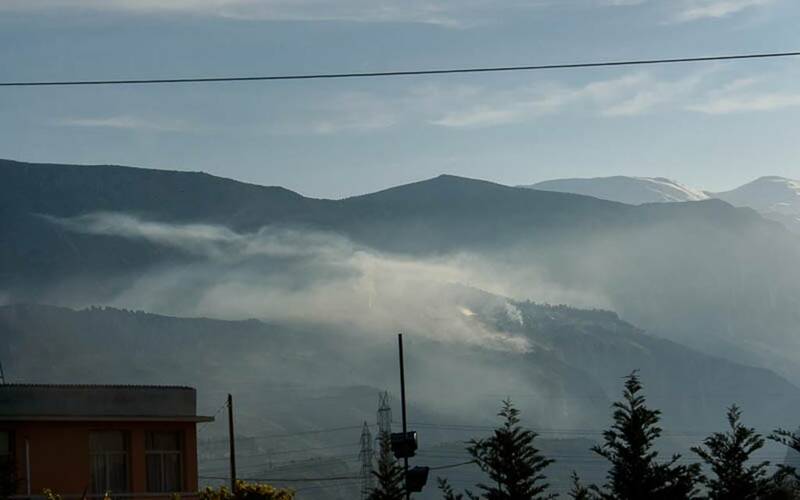 A smoky haze lies over the valley. 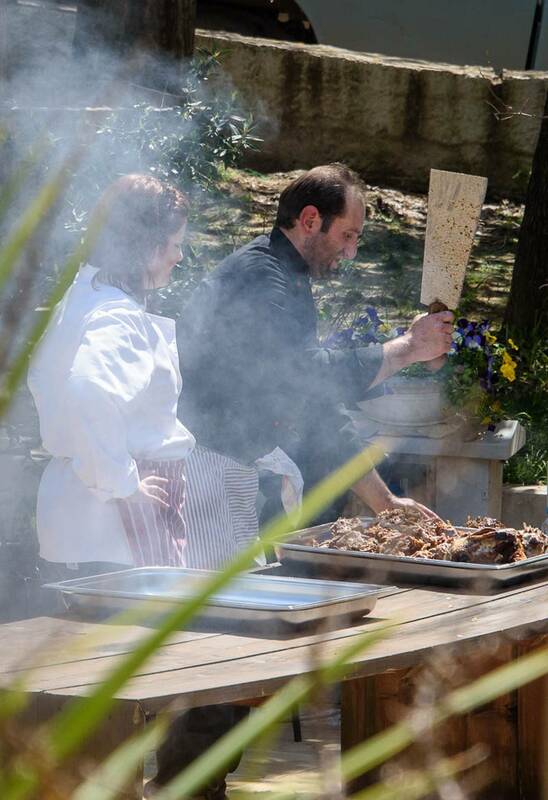 The smoke from the grills was unbelievable! 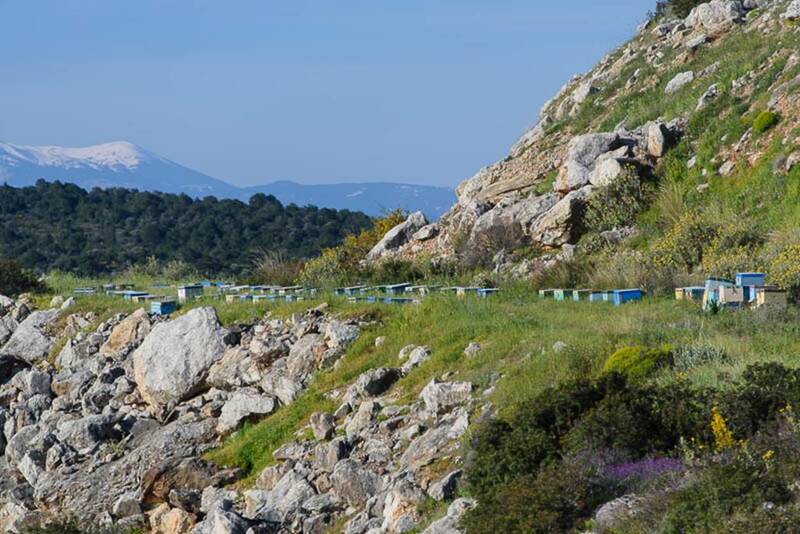 Honey is a major staple in Greece, as are bee keepers. 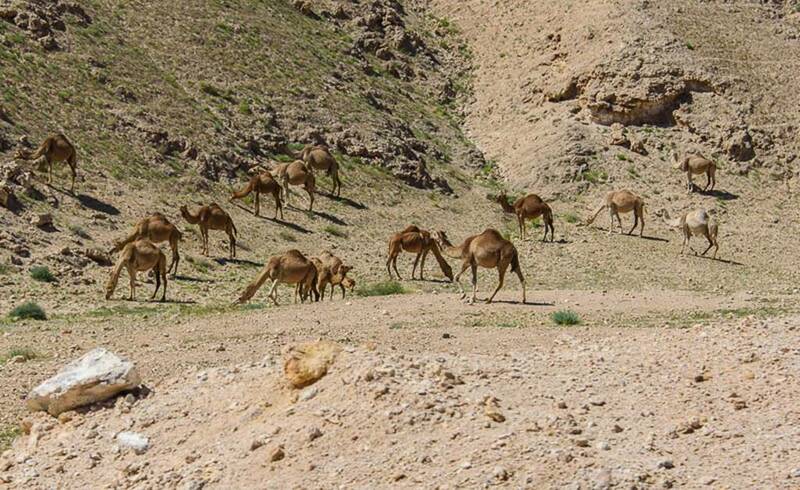 This was a common sight along the road, often not near any houses. 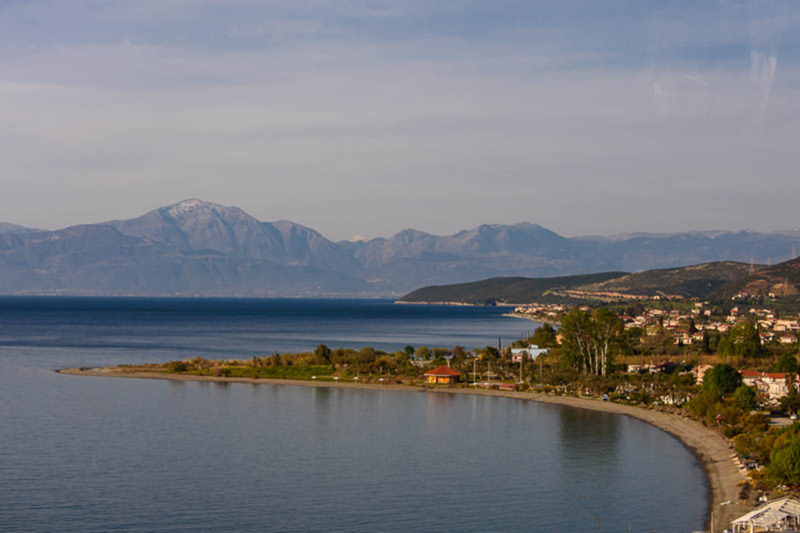 The coastal ride from Delphi was beautiful. 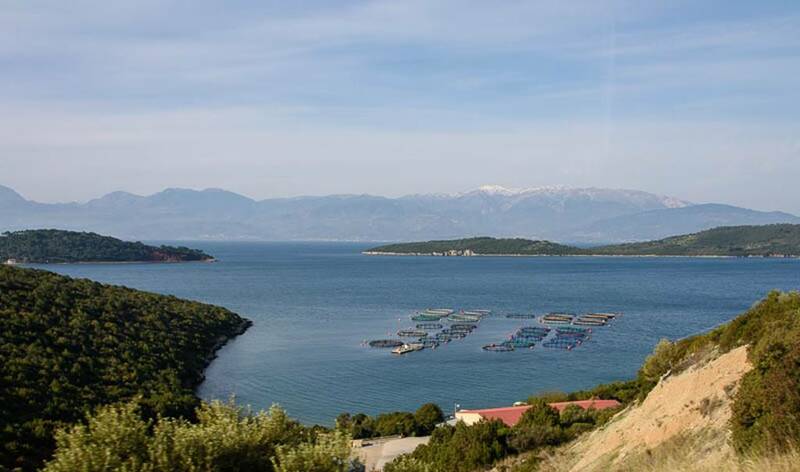 Fish farms are a growing industry in Greece with the majority of exports going to Italy. We arrived in Olympia at about 12:00 noon. 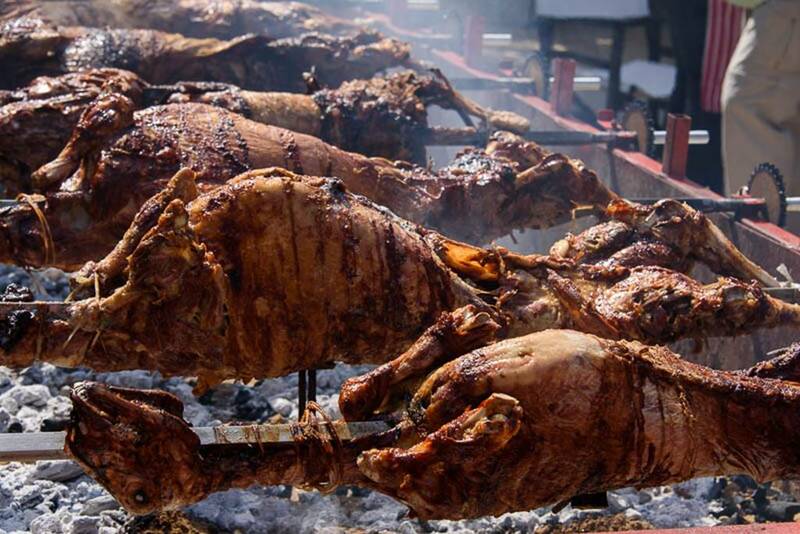 There were eight lambs on the spit, almost ready for the feast to begin. 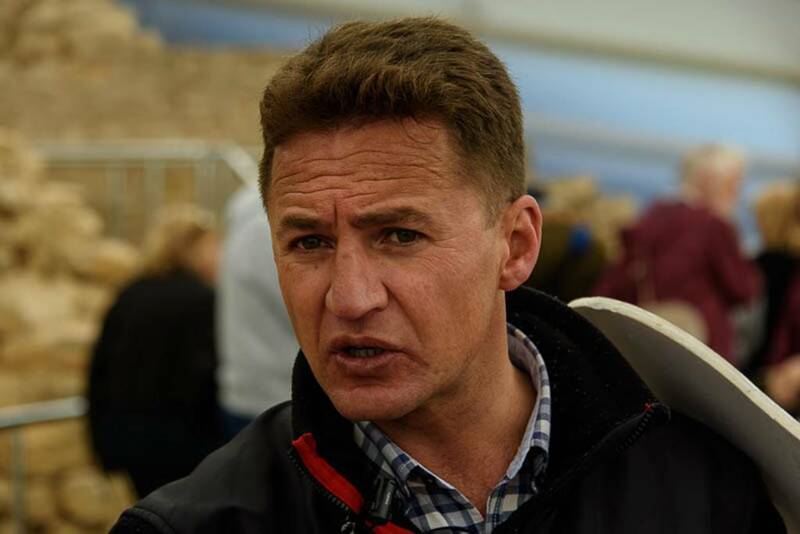 It takes a big cleaver and a strong arm to cut up eight lambs! After eating we walked the streets of Olympia. 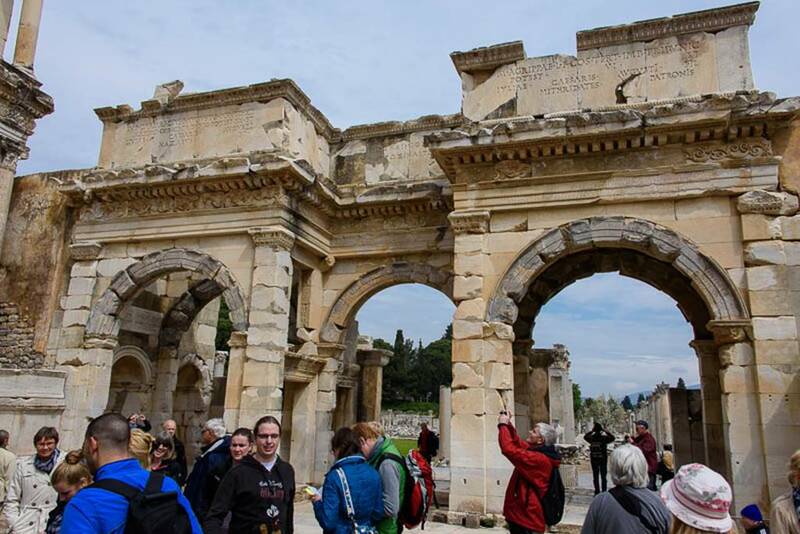 Due to the holiday the Olympia ruins were closed for the day, a disappointment for us but we did enjoy our sightseeing. One shopping stop I did make was at the Pharmacy. Kay once again had a defective bottle of latanoprost, or Xylatan, her glaucoma medication. It is not noticeable and would not be a problem as long as the bottle is kept upright but the tiny dropper had a crack which allowed the medication to drain when on its side or upside down. Since this bottle had been traveling with us for three months it has been tumbled in every direction. Fortunately I was able to communicate with the pharmacist and obtained a bottle to finish our trip with. The amazing thing is that here in Greece as it was in Budapest last summer when I had a similar situation is they do not have the generic, only the brand. What’s even more amazing is the brand cost less than the generic does in the States. 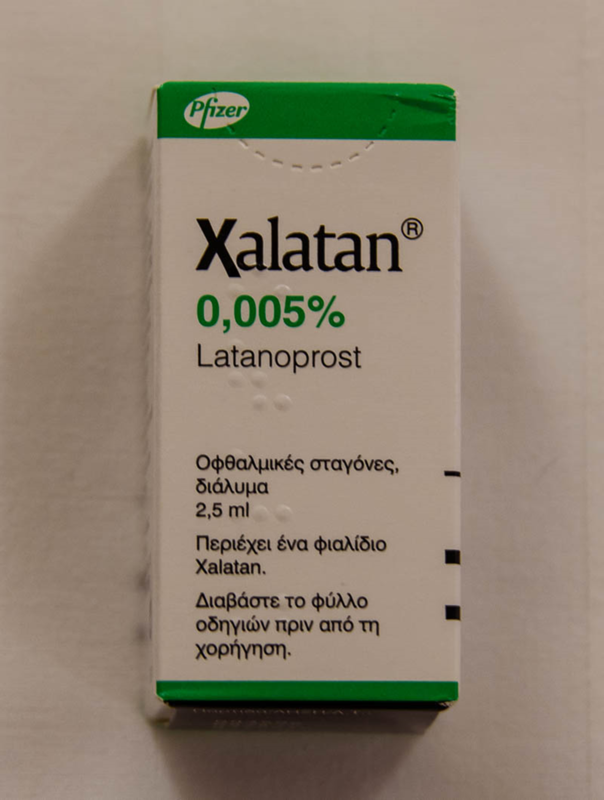 I paid 8.26 Euro or about $8.80 USD for this bottle and did not need a prescription. On the way back to the ship we saw this scene repeatedly. 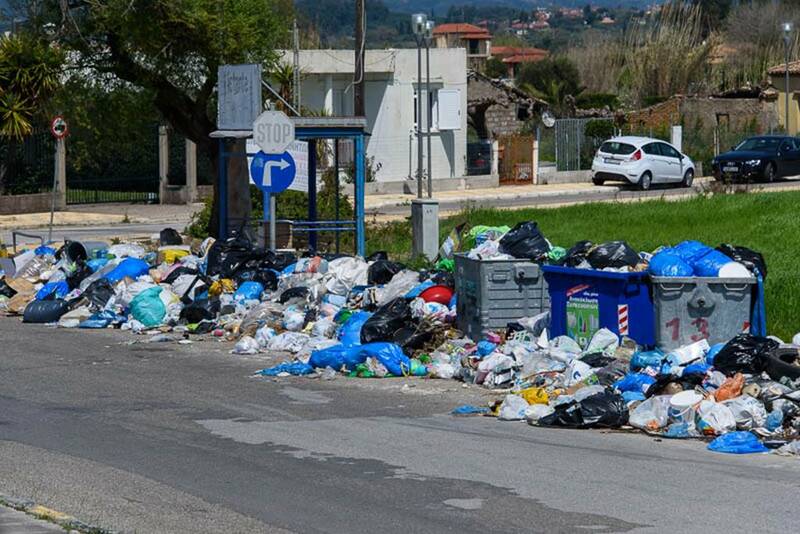 The sanitation workers are on strike. 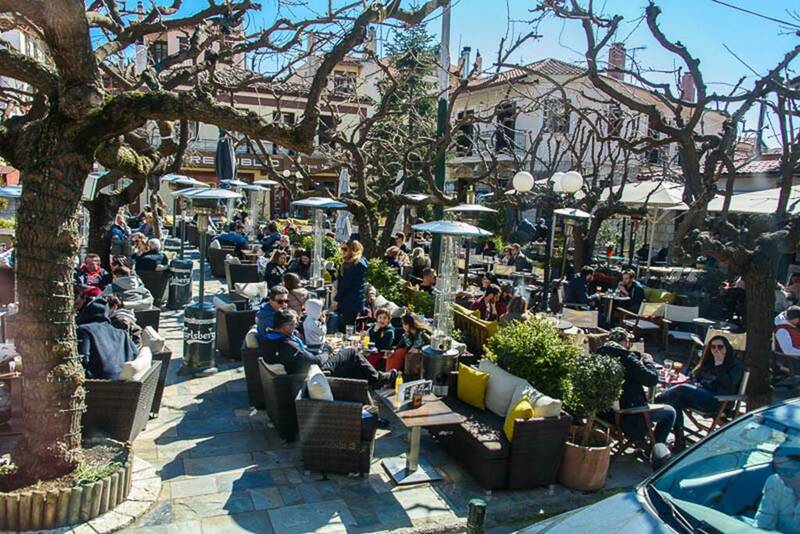 Greece has so many economic and political problems… It is a shame because the people are so nice and the country is so beautiful. When we arrive back, the ship was patiently waiting for us. We had a little time left so Kay and I walked around the small town of Katakolon. The beach was a rocky, not sandy but it was beautiful. 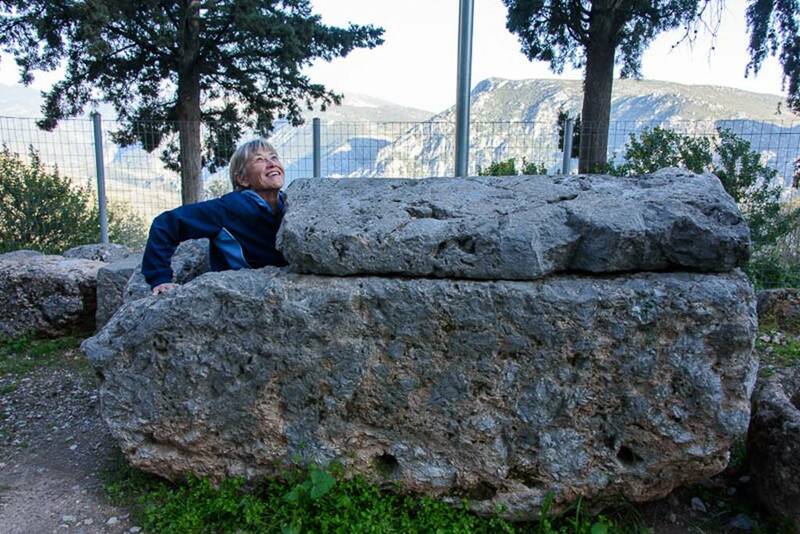 We arose early, ate breakfast and were on our way south toward Delphi by 8:00 AM. It was another long bus ride, but again with beautiful scenery. 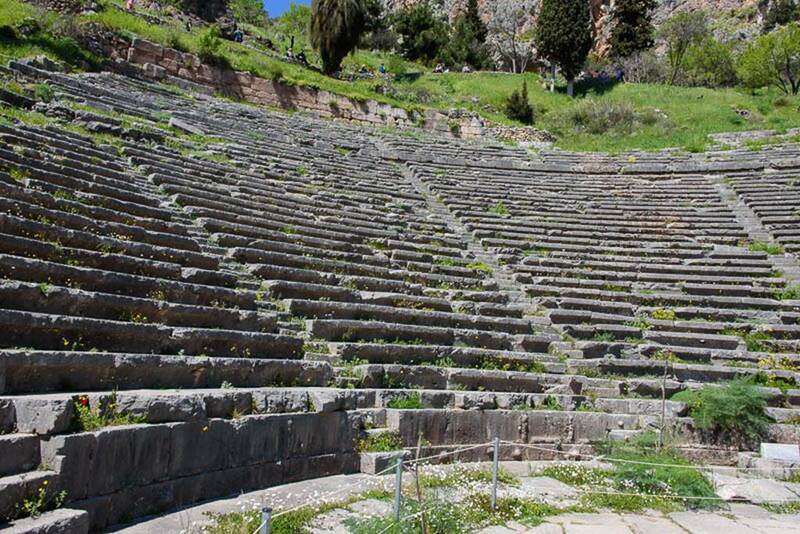 Due to the Easter Holiday, we had to arrive in Delphi as soon as possible because the park closes at 2:30 PM. Therefore we went directly to the park before lunch. 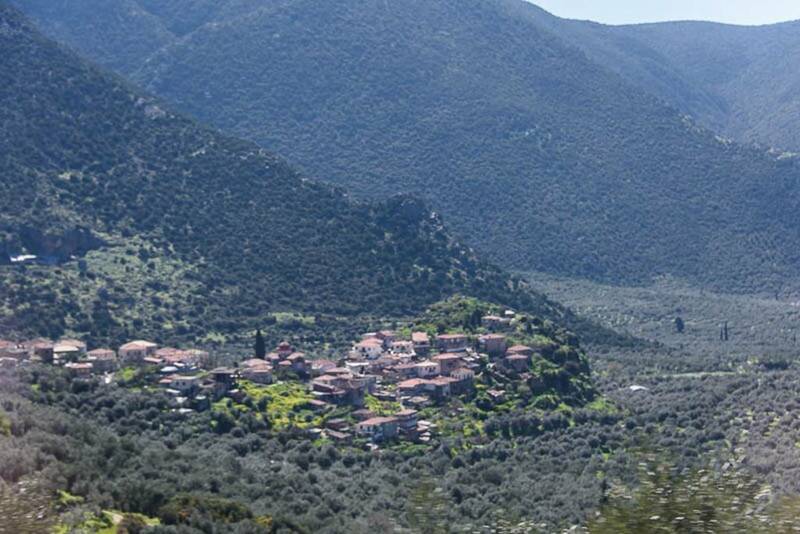 One of the numberless small villages and towns nestled in the mountain valleys. Occasionally we would see a Gypsy camp alongside the road. Some of these were quite large and as in all other countries where we have found this ethnic group, they are a problem for the locals to deal with. 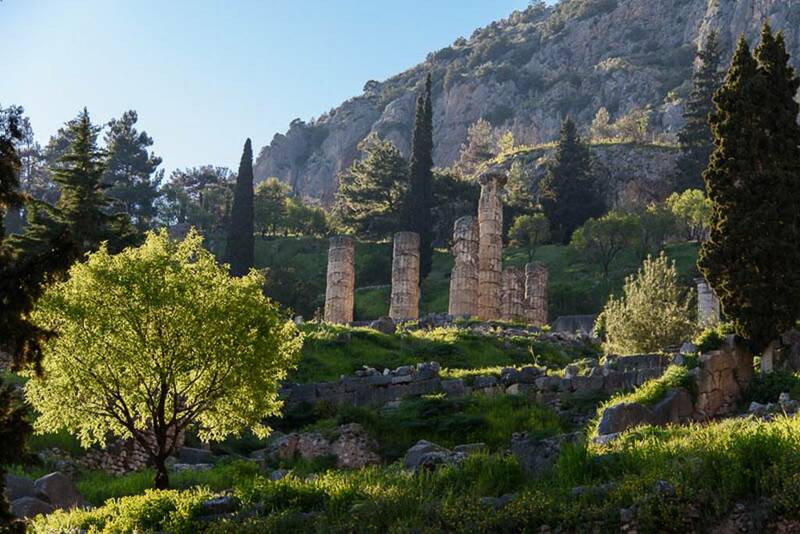 Delphi is situated in Sterea Hellas. 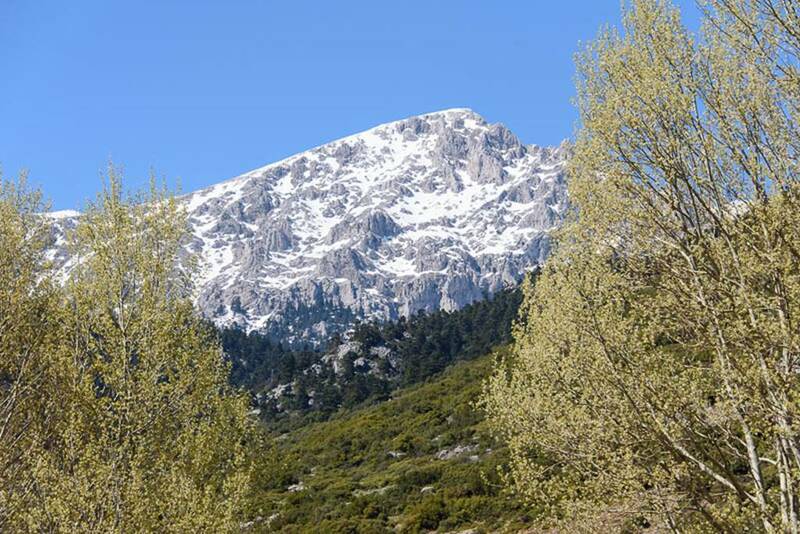 It is a mountainous area covered by the Parnassus range and the western branches of mount Helicon. 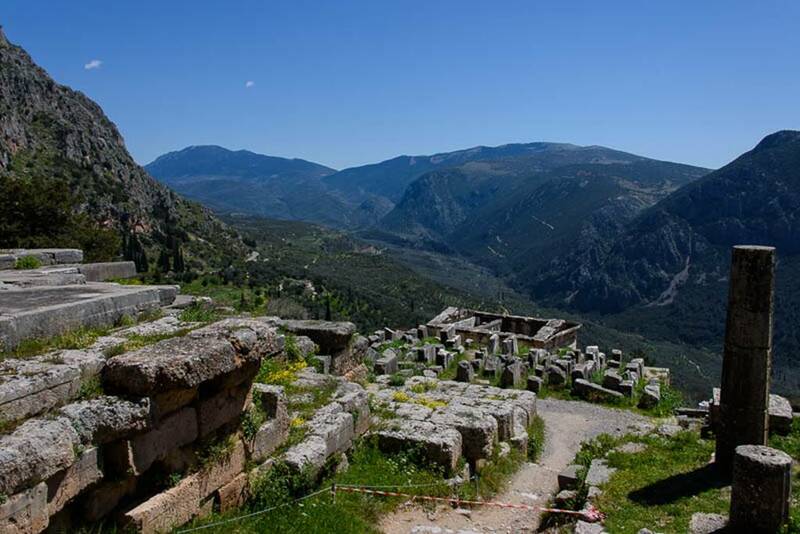 The town of Delphi and the Sanctuary were built on the southern slopes of Parnassus at an altitude between 1500 to 2400 feet. 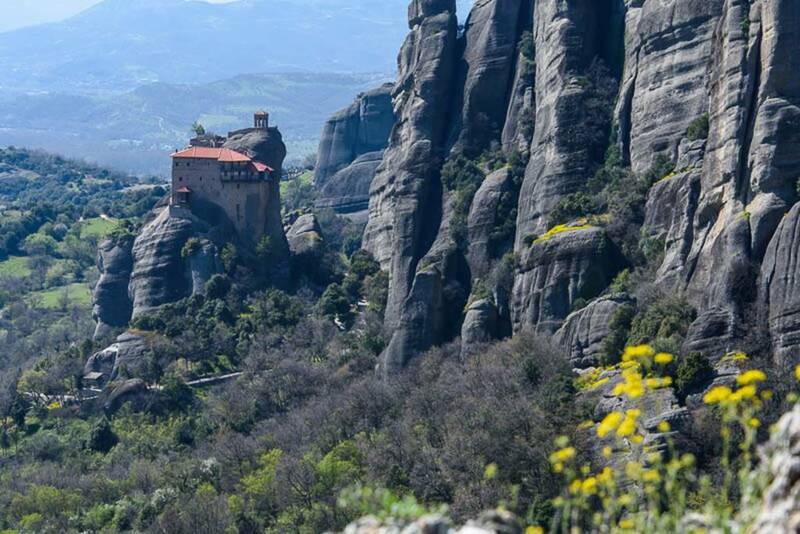 The landscape is of spectacular natural beauty, full of sharp contrasts and is one of the most impressive and fascinating parts of Greece. 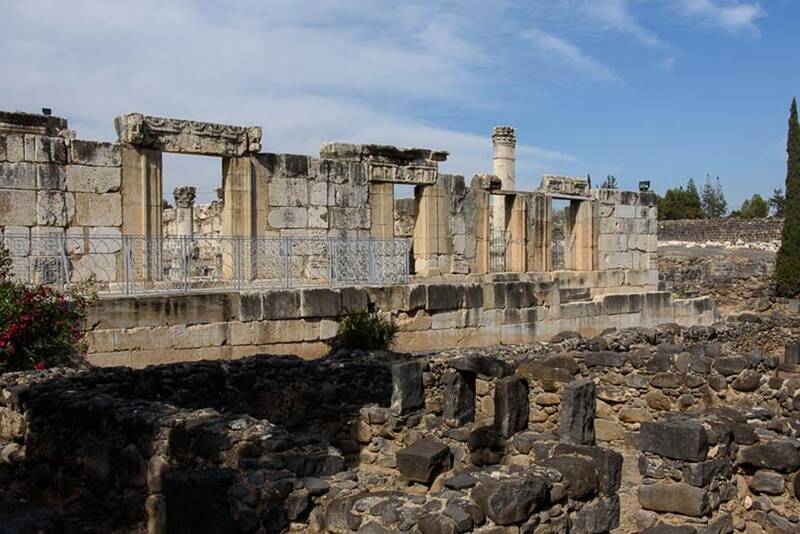 For many centuries this was a religious and spiritual center of the ancient Greek world. 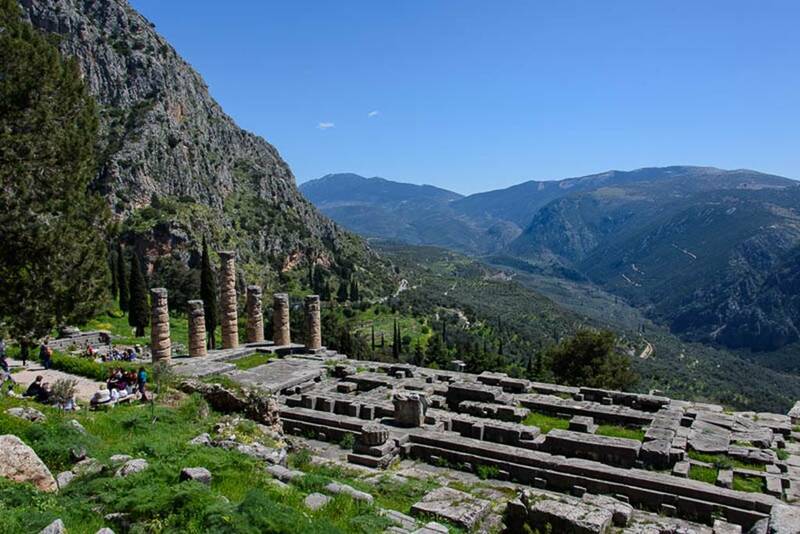 According to tradition, Delphi was the geographical center of the world, the meeting point of two eagles dispatched by Zeus from the ends of the universe to find the center of the world. 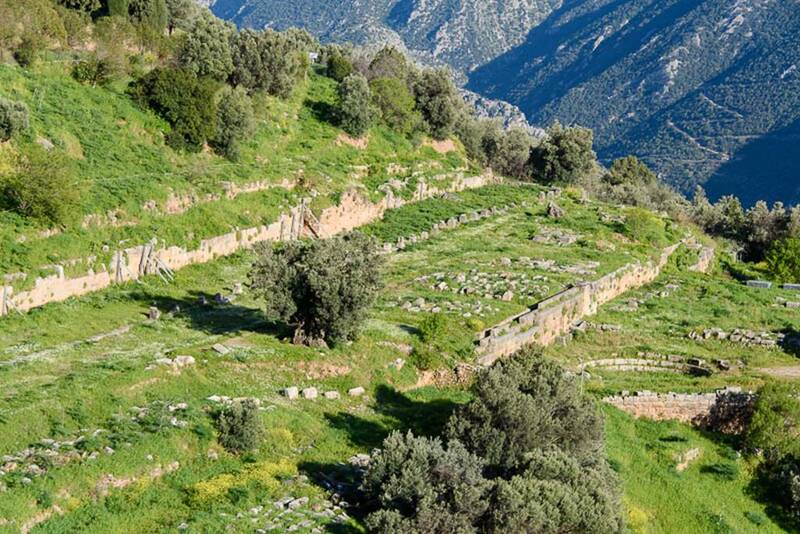 The first traces of inhabitation in the region of Delphi go back to Mycenaean times (14th-11th century BC). 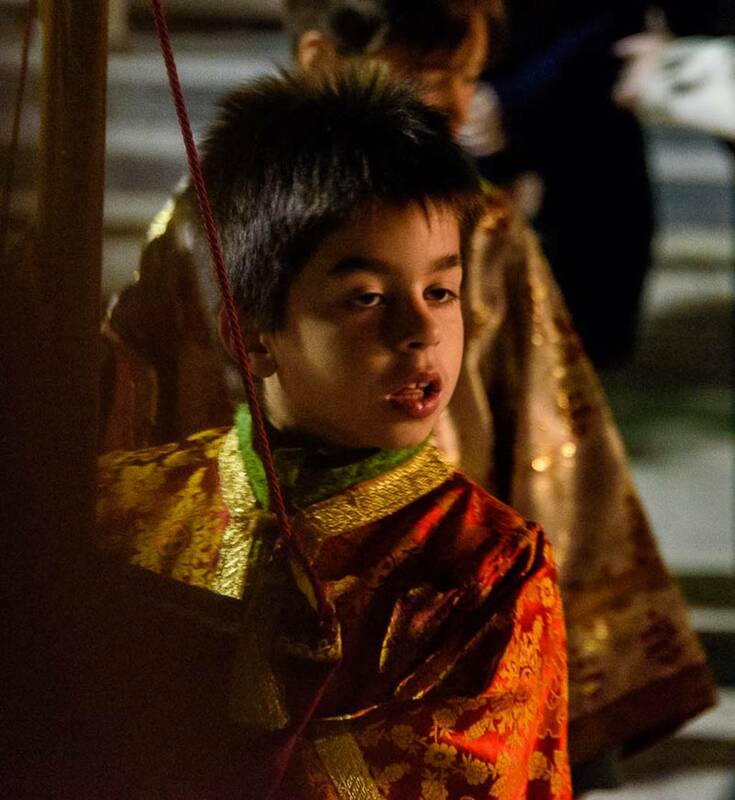 Since this time a number of different cults and religions have occupied the area. 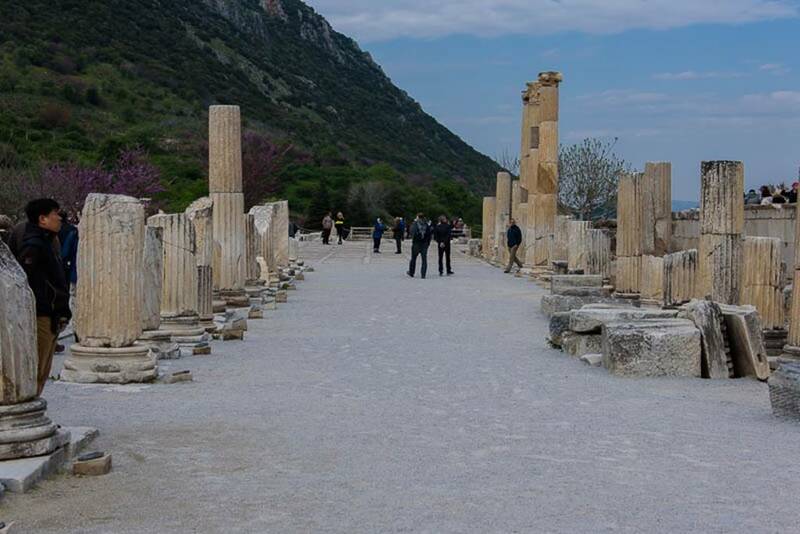 When we arrived at the Historical Site of Delphi, we first visited the museum. 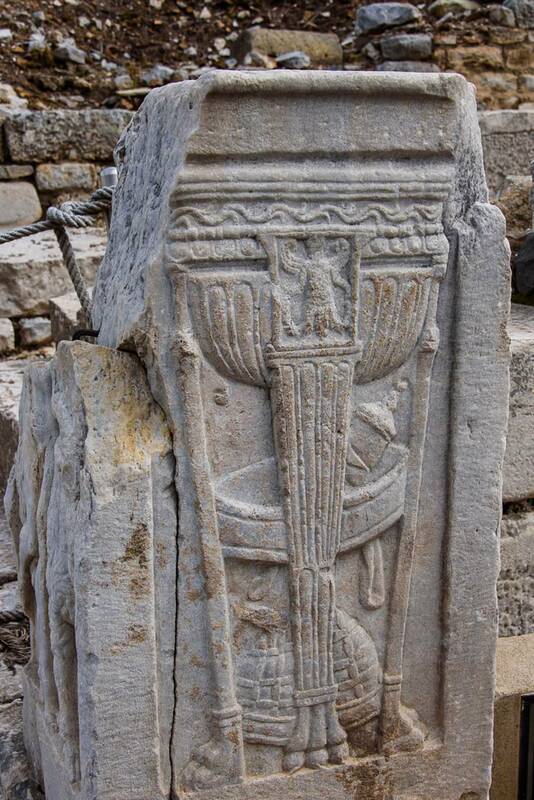 Here are a number of very important pieces which have been excavated over the years. 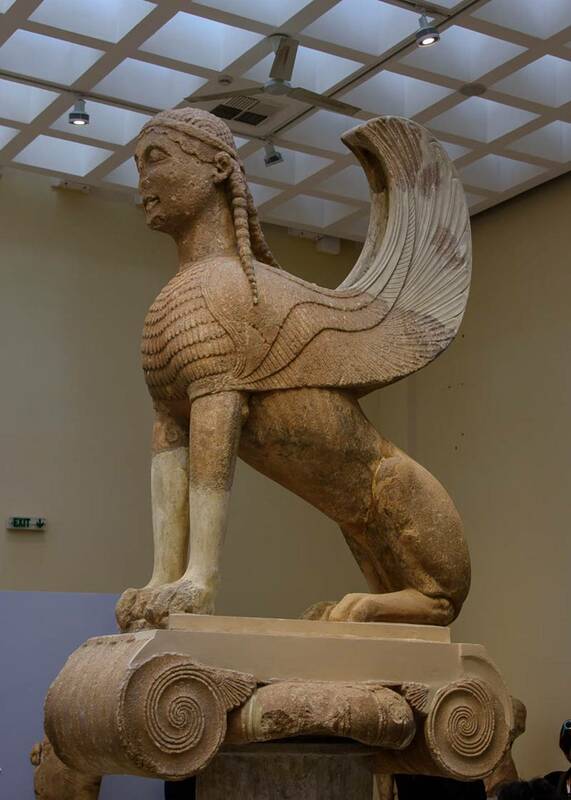 In about 560 BC, preceding the construction of the Siphnian treasury, another rich island of the Cyclades, Naxos sent a grandiose offering to Apollo of Delphi; the statue of the mythical sphinx, a female face with the mysterious smile, the body of a lion and the wings of a bird were placed on an Ionic column at the sanctuary of Gaia in order to protect her oracle. 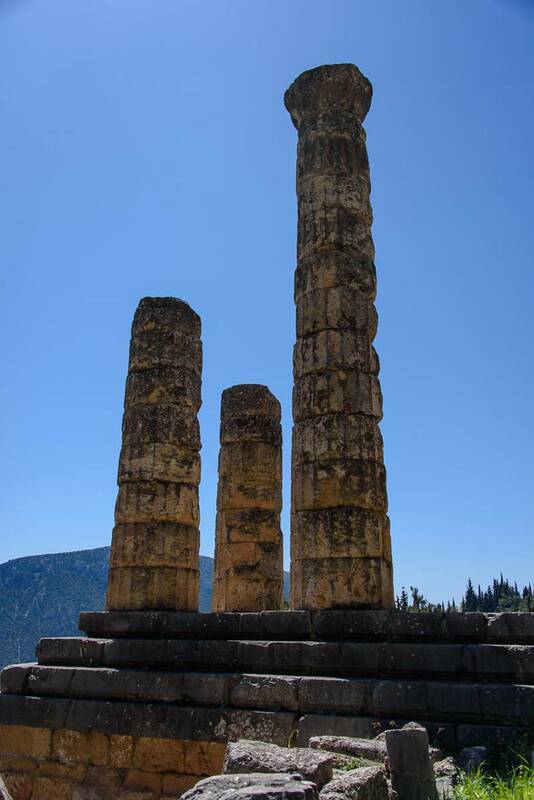 It is regarded as the oldest element in the Ionic order at Delphi. The Sphinx including the column stood almost 40 feet tall. 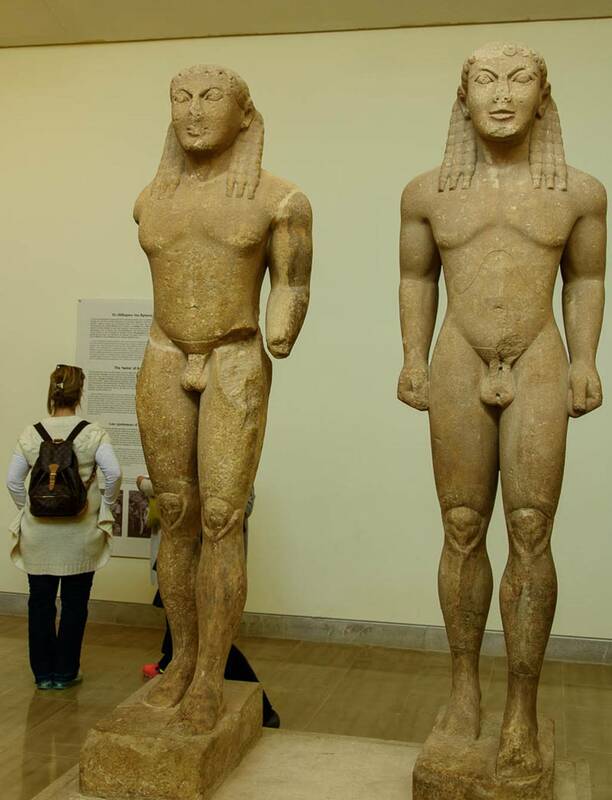 Statues of the identical twins, Kleovis and Byton who were immortalized as having been “the best of men”. After their mother prayed to the statue of the goddess Hereon to give the twins “whatsoever is best for a man to receive”, they went to sleep and never awoke. 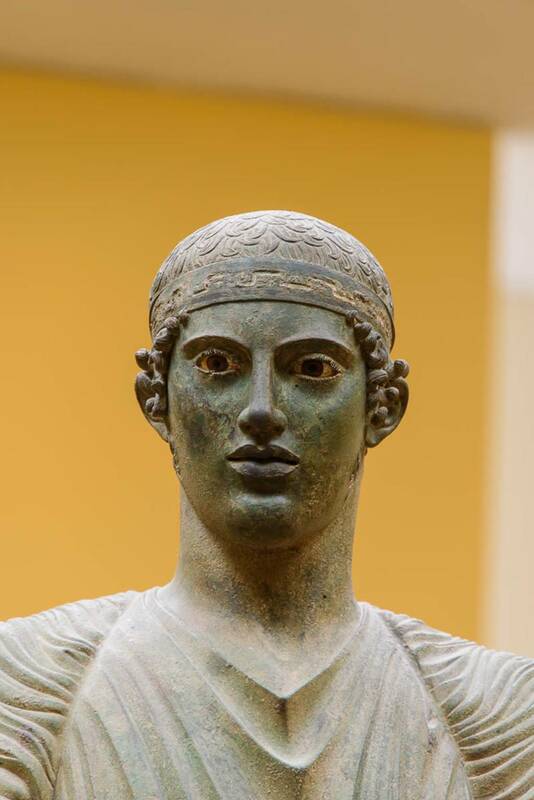 The gods took them with them and they were immortalized with these statues and dedicated to Apollo as eternal symbols of virtue (around 600 BC). 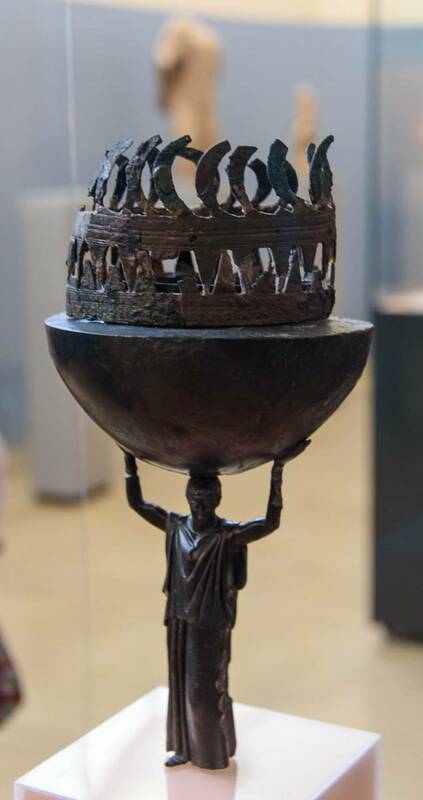 A small bronze incensory circa 490-460 BC. 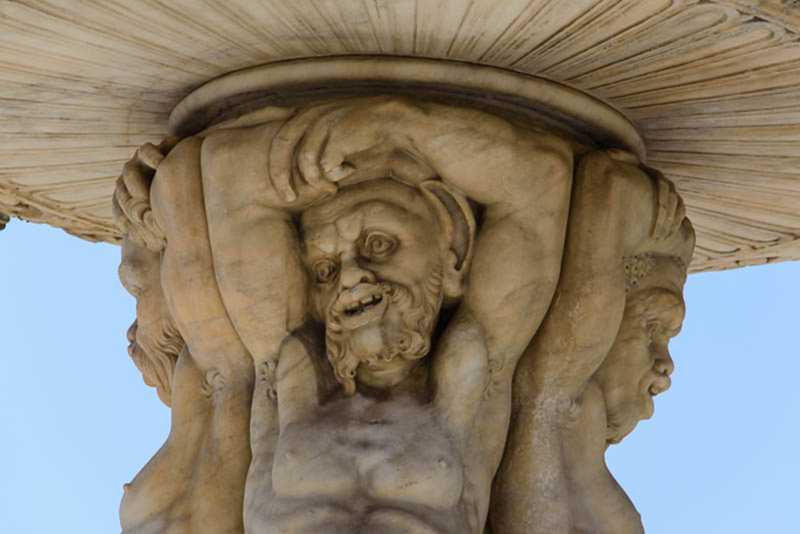 Dionysus, one of a “family of philosophers” statues created around 270 BC. The Charioteer, an exquisite piece of the beginning of the 5th century BC The Charioteer was part of a bronze complex which according to the prevailing view, was dedicated to Apollo By Polyzalos, tyrant of Gela in Sicily, in commemoration of his victory in the chariot race in the Pythian Games in 478 or 474 BC. 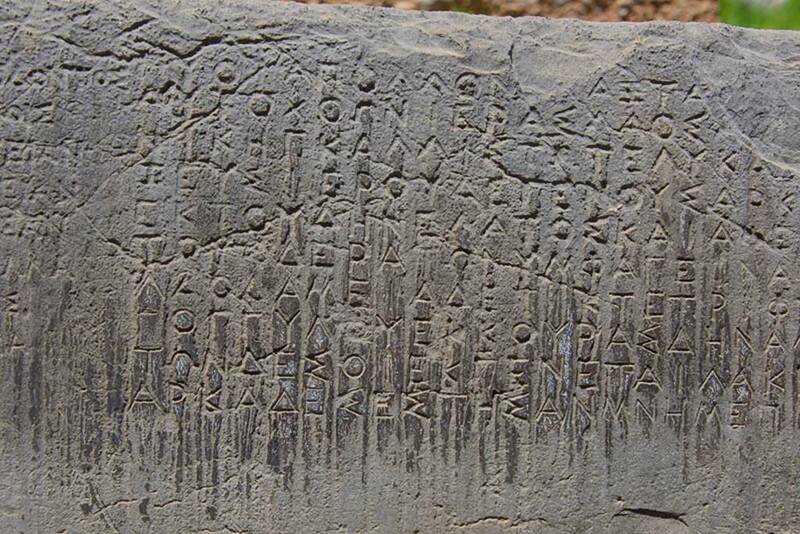 One of many stone tablets which can be seen in Delphi. 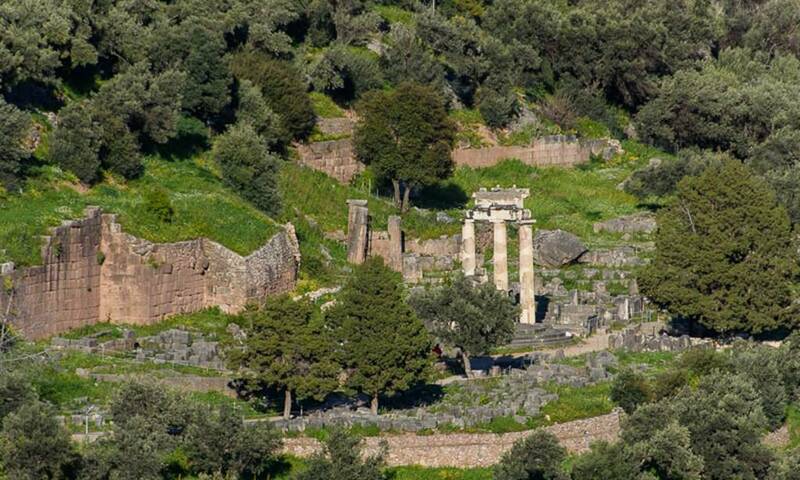 The Iconic treasury built by the Siphnians near the end of the 6th century BC. 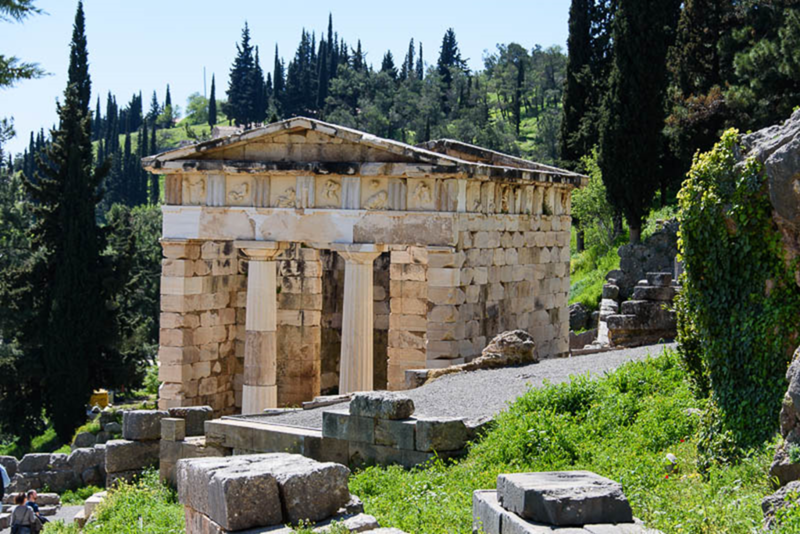 The treasuries are small, elegant temple-shaped buildings erected by the Greek cities in commemoration of an historical event in order to house precious offerings. There were many treasuries. 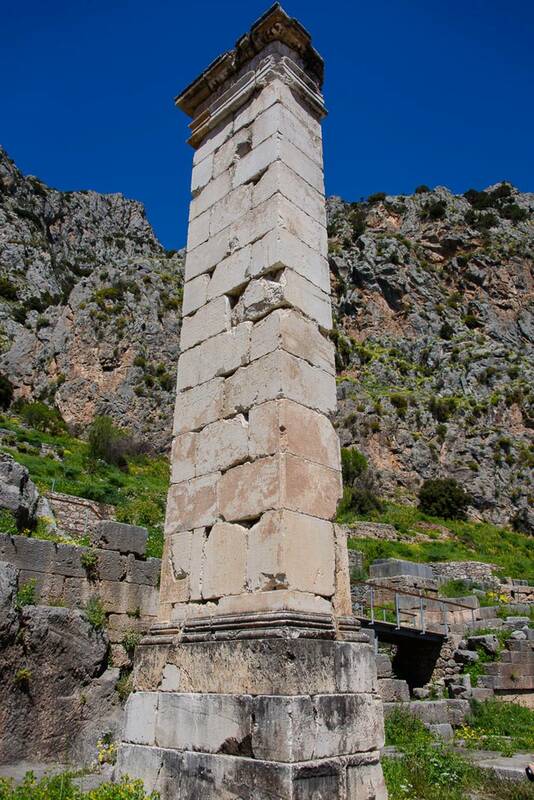 Remains of the Temple of Apollo. The Theater. 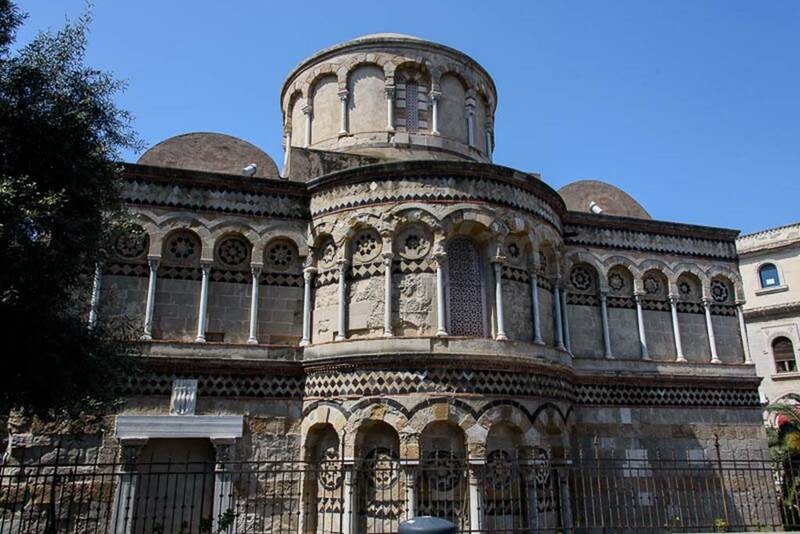 Built in the 4th century BC, reconstructed in the 2th century BC and took its final form in Roman times. 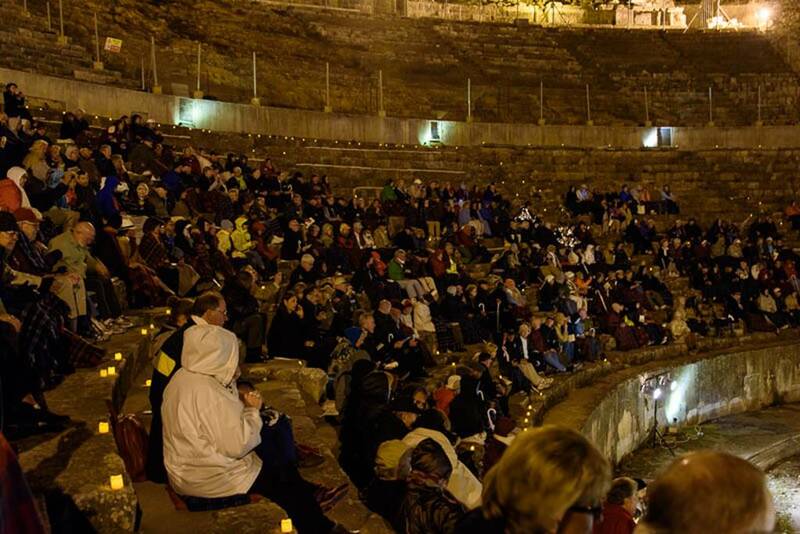 The Stadium which dates back to the 5th century BC took its present form in the 2nd century BC when Herod Atticus restored it and built the stone seats which could accommodate an audience of 7,000. 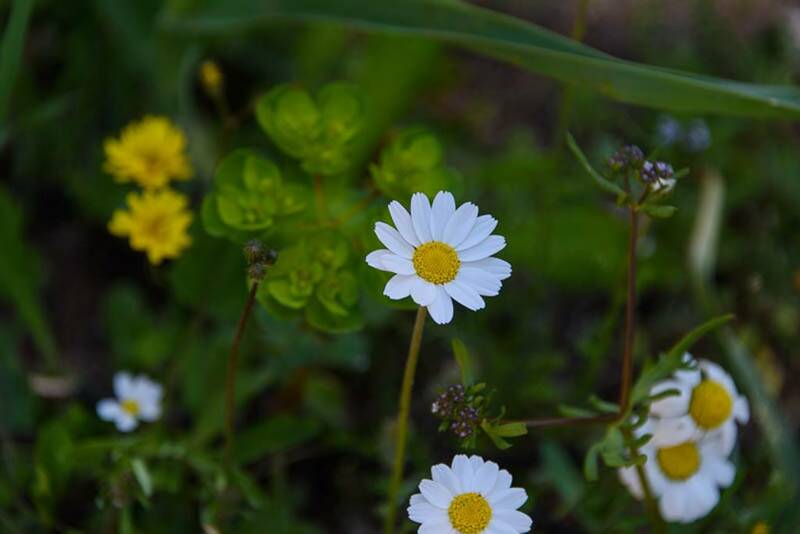 Beautiful wild flowers grow everywhere! The grounds closed promptly at 2:30 and we left for a much needed lunch! The setting was rustic, but the food was good. The view from the front of the restaurant. 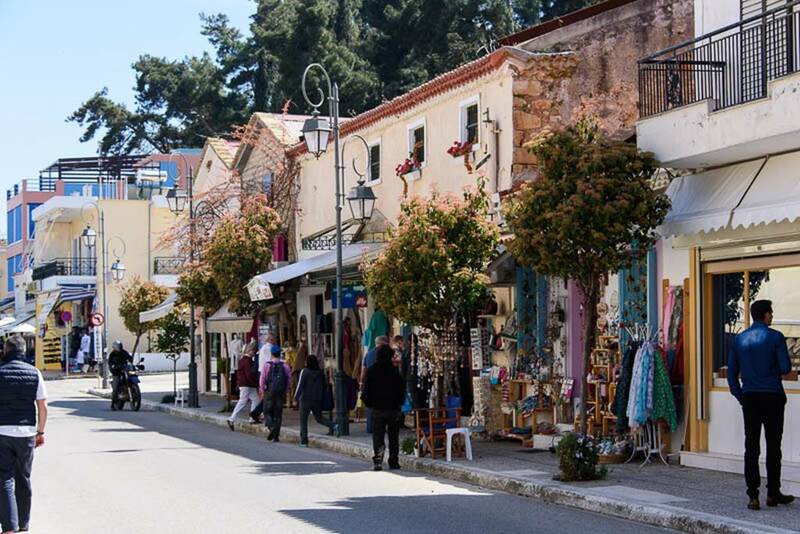 On our way back to the town of Delphi, where we were to spend the night, we passed through another slightly larger city which has a very narrow two-way main street. 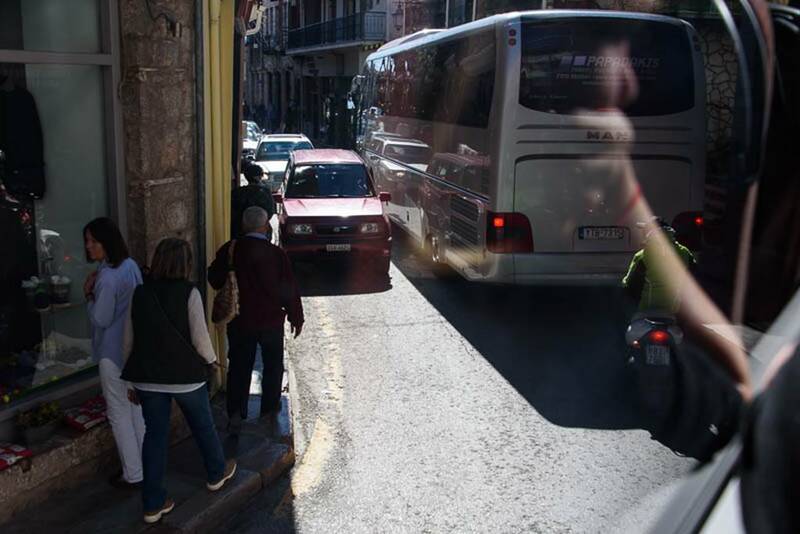 Meeting another vehicle was difficult and when we meet two other tour buses, it took 15 minutes for us to negotiate our passage. 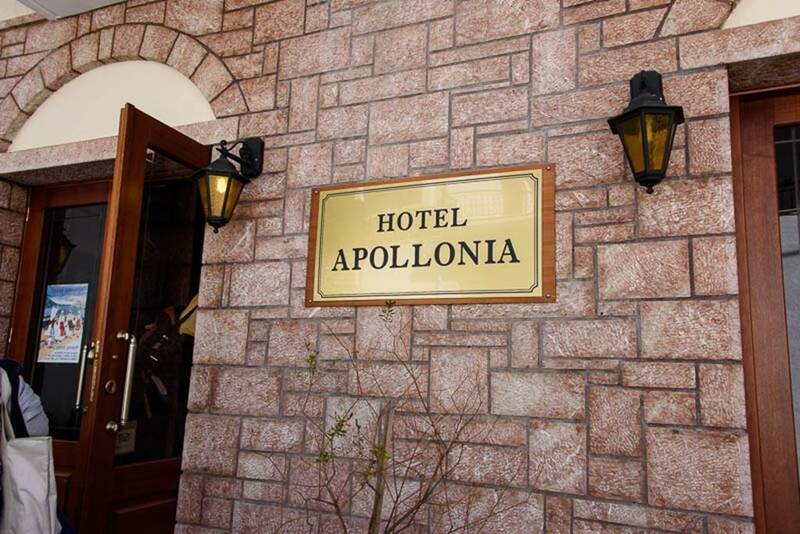 We finally arrived at our hotel, the Hotel Apollonia. Mark, our HAL tour “helper”, passed out our room keys. Ours was next to the last one passed out and it was explained that the entrance was on floor 3 and the restaurant was on floor 2. Our room was marked 414, so we took the stairs up one flight. Sure enough the 400 rooms were on this level but they only went up to 412. Tired and frustrated, I left Kay with the luggage an went back to the front desk. I had to wait several minutes because there was only one person at the desk. I what was probably not a really nice tone, I asked where this room was located. “No problem” she said, “follow me”. We got on the elevator, went up one floor to where Kay was waiting. 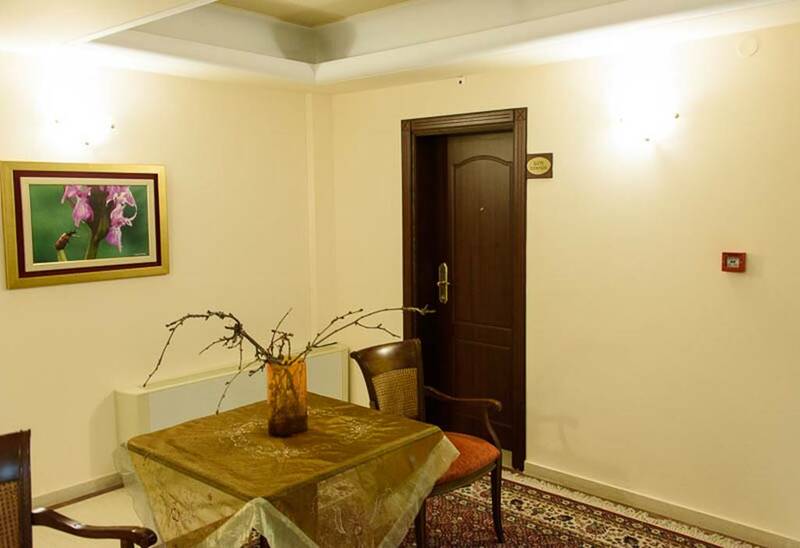 She crossed the small lobby and opened the door to a suite which did not even have a number. It looked like we lucked out! 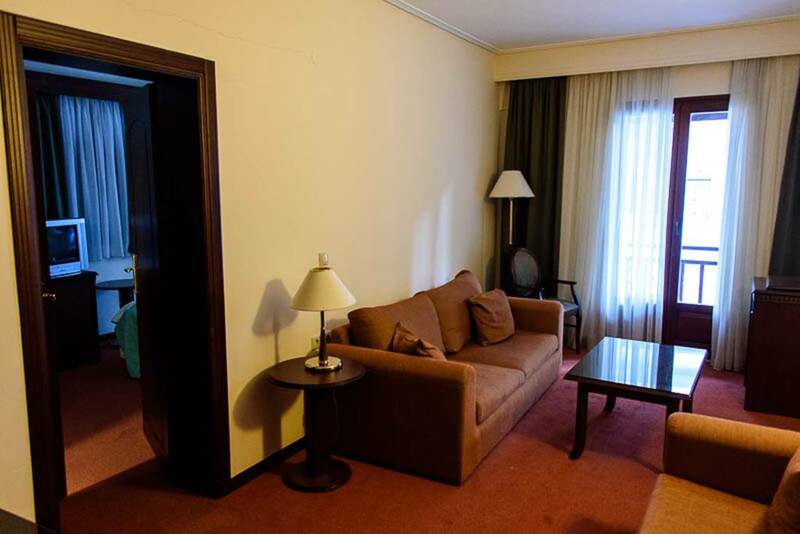 We had a nice two room suite with dual balconies. The entrance to our “suite”. View from the Hotel front balcony. 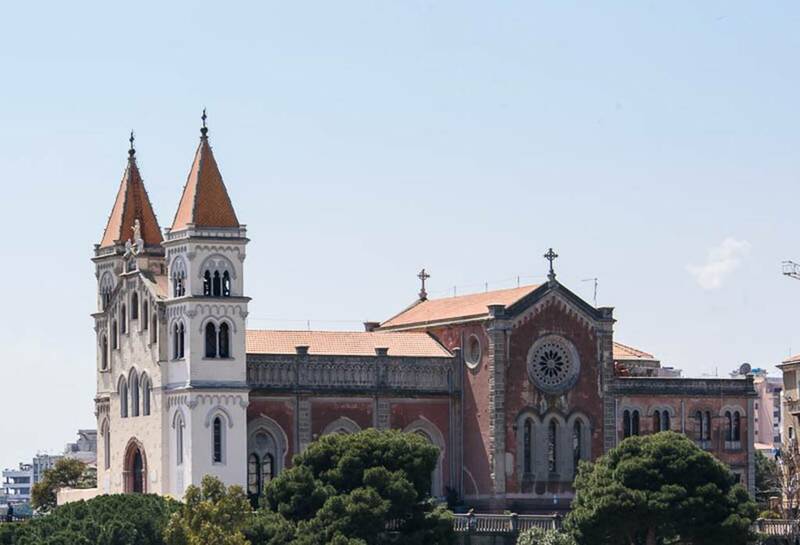 Church visible from the balcony. This is where the midnight service was held, but we did not go. On main street in Delphi. We took a break on this small wall to just enjoy the view. 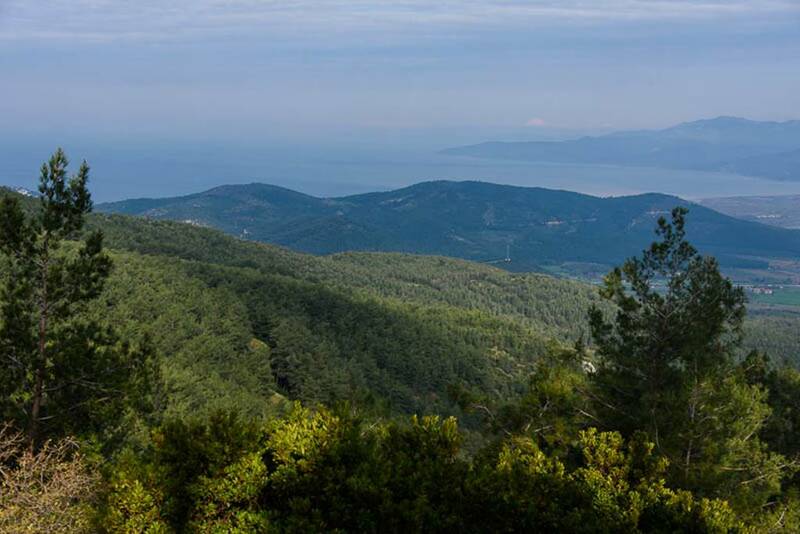 In the distance you can see the Ionian Sea (this part also called the Korinthiakos Sea). 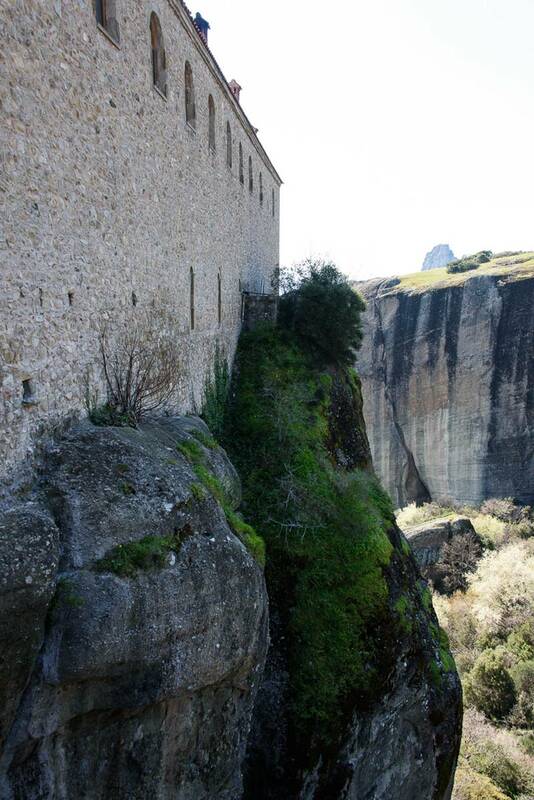 Directly behind the wall was a drop of about 100 feet to a small ledge, after that it was another 1500 plus feet to the valley floor… You can see some of the olive tree orchards in the valley. All along the roads you would see these permenate memorials to persons who died in auto accidents. 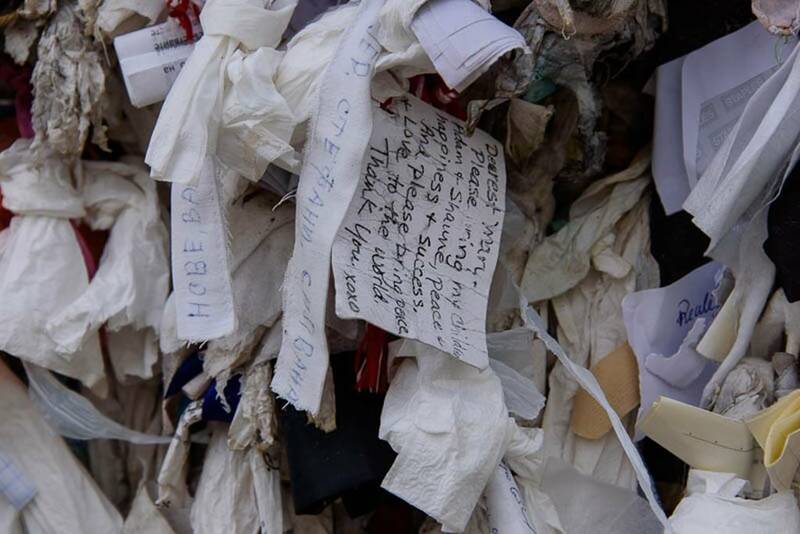 They usually contained some religious icons and perhaps a photo or flowers. 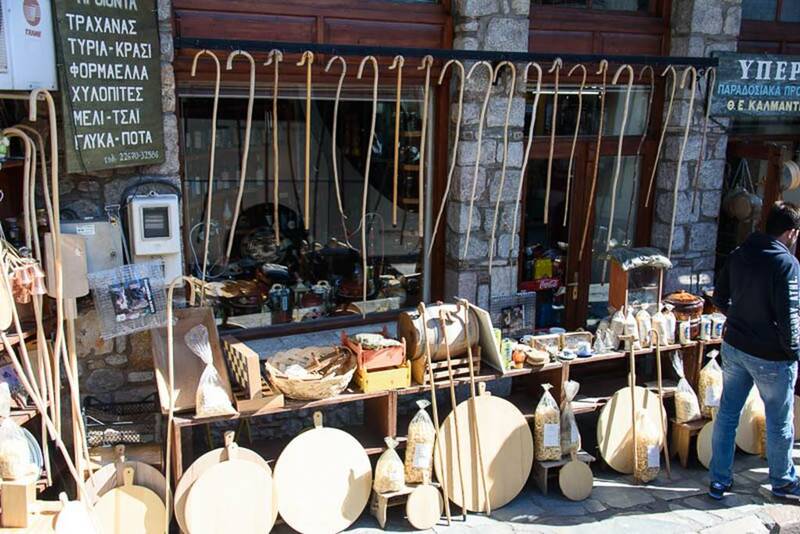 We saw several places along our travels where these could be purchased. 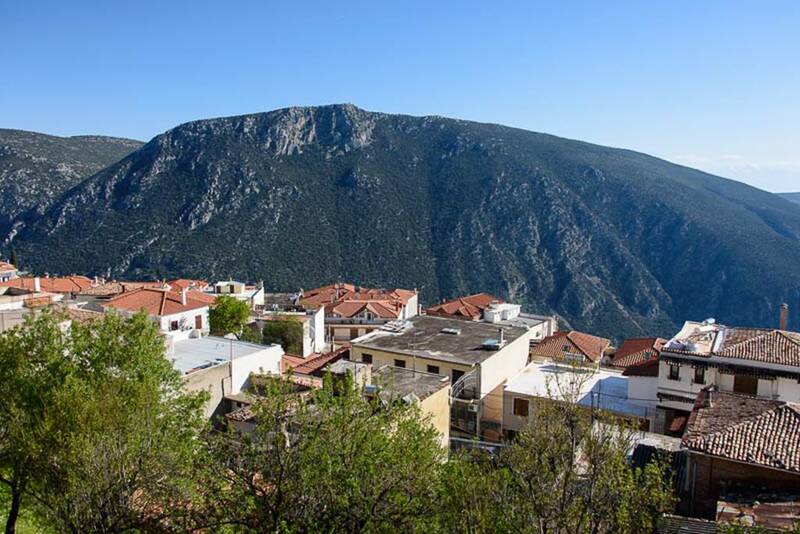 We continued walking through town and back down to the Delphi Sanctuary. 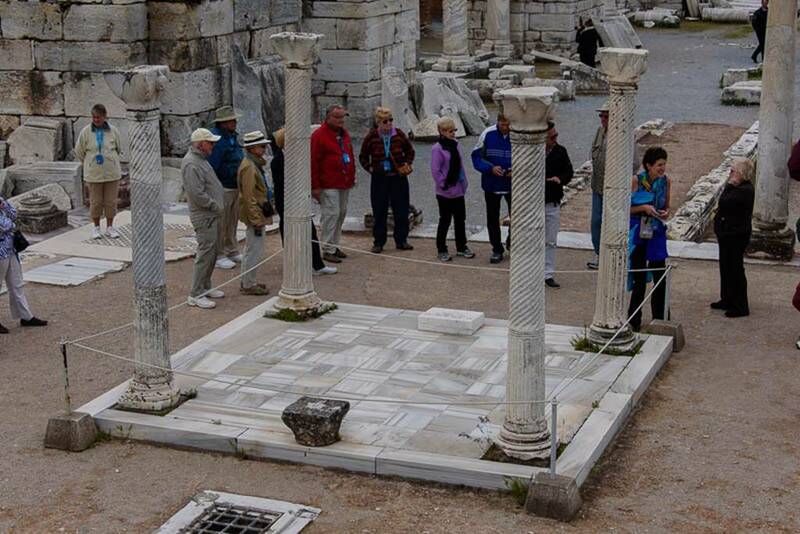 Here we viewed the “gymnasium” area which we missed earlier today. The Gymnasium is on two parallel levels. 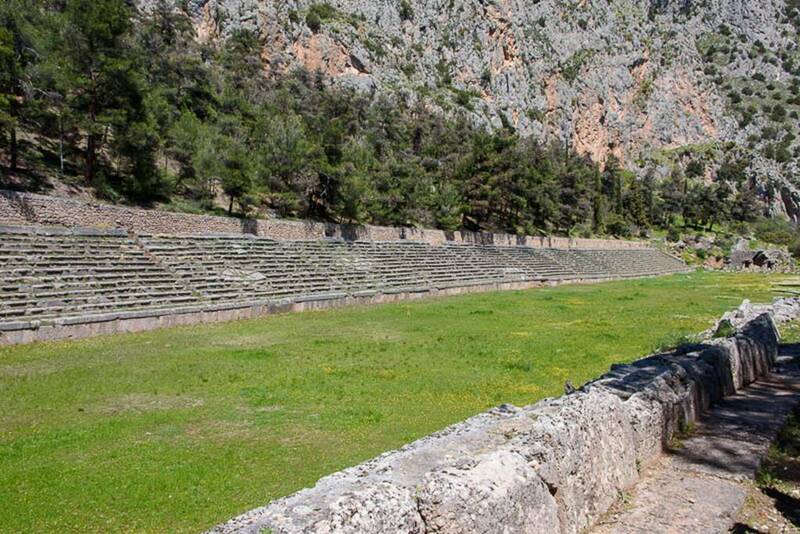 On the highest level there was a big stoa or xystos, where athletes trained in racing when the weather conditions were unfavorable. When the weather was good, they used the paradromida, which lies in front of the xystos and parallel to it. 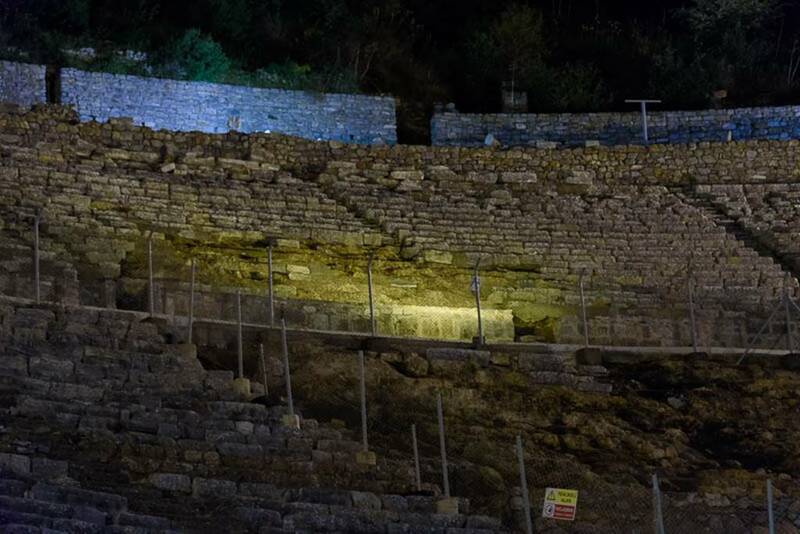 On the lower level there was the Palaestra, a square yard surrounded by a small sanctuary and chambers used for the various activities of the athletes training in wrestling and boxing. Beside the palaestra were the baths. The cold water coming from the Castalia spring ran through eleven spouts into stone basins and from there flowed into a circular tank. In Roman times baths with hot water were added westwards. Apollo’s temple as seen from the road in the evening sun. 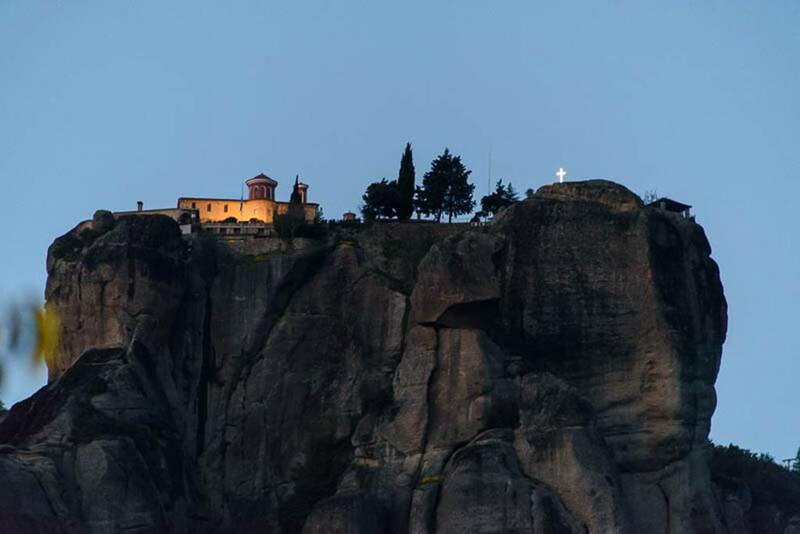 The sanctuary of Athena Pronaia or the Temple of Athena. 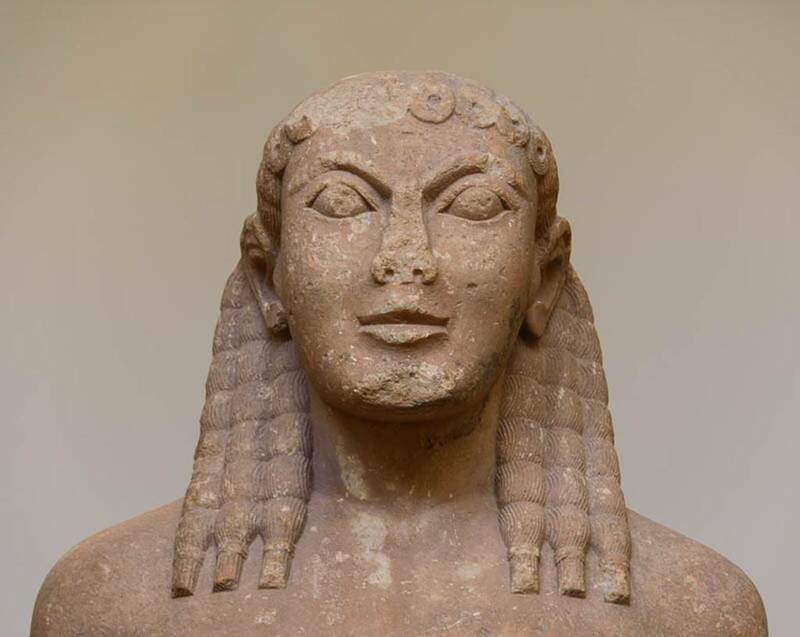 This dates from the 5th and 4th century BC. The round trip walk was about 2.5 miles – a nice walk, especially coming back up the steep hill in town. Here is a grill readied the Easter Sunday morning ritual of grilling a lamb for the Easter Feast. Tomorrow’s photos will show the incredible smoke created by the lighting of dozens of these grills. Today starts a very busy six straight port days with one sea day followed by another 3 port days! With so many port days and activities, I am not sure when or how much delay there will be between my postings. I will try to stay current, but I am sure there may be several days’ delay for which I apologize ahead of time. 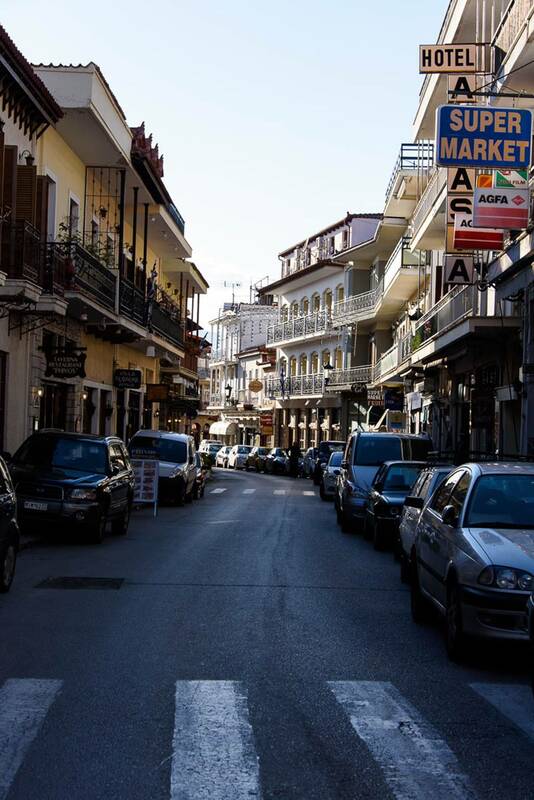 We arrived in the port of Piraeus, Greece (Athens port city) around 7:00 AM. Since we were leaving the ship for two nights for an overland tour, we had our luggage packed and ready. We debarked around 8:10 and were on the road by 8:30. 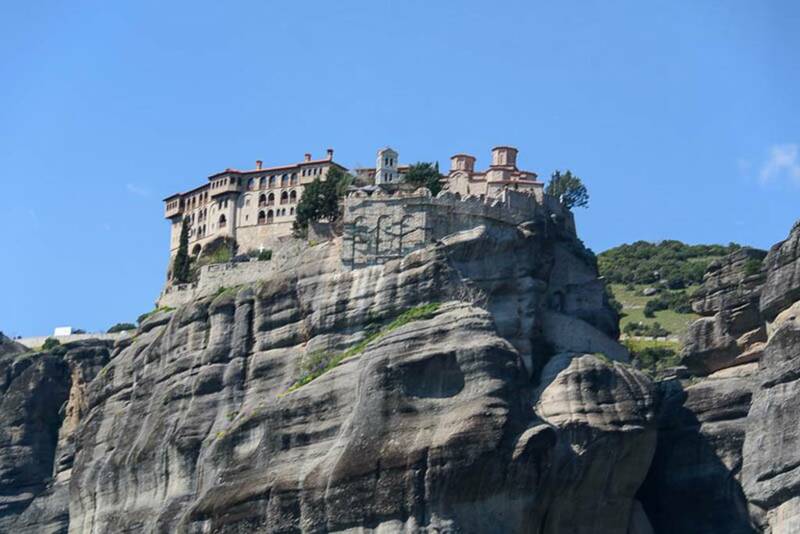 The drive to Meteora was long, but the scenery was beautiful. Greece is not exactly as I had pictured it in my mind. 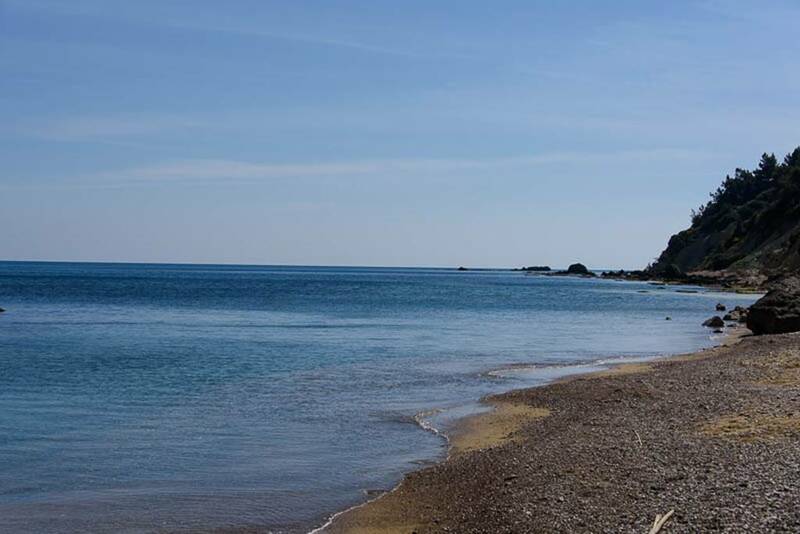 Most photos and movies concentrate on the coast and the beautiful coastal cities. I didn’t realize that the country was so mountainous. 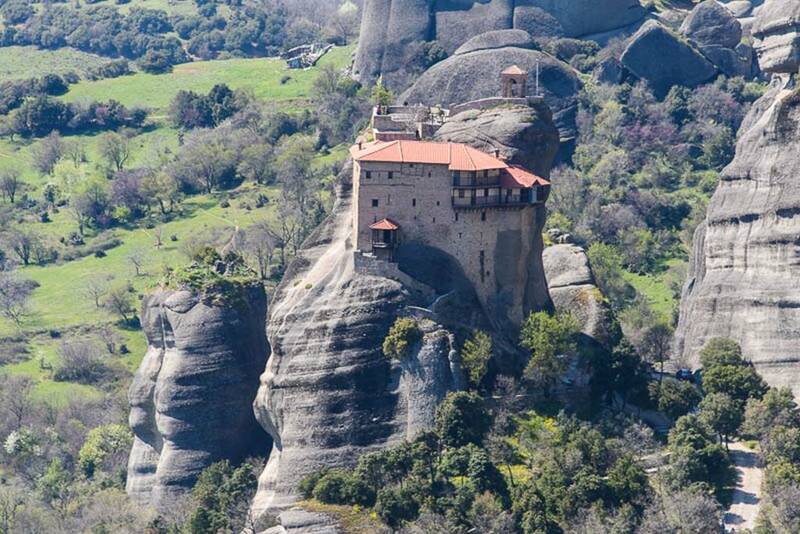 It is the 3rd most mountainous country in Europe, behind Norway and Albania. 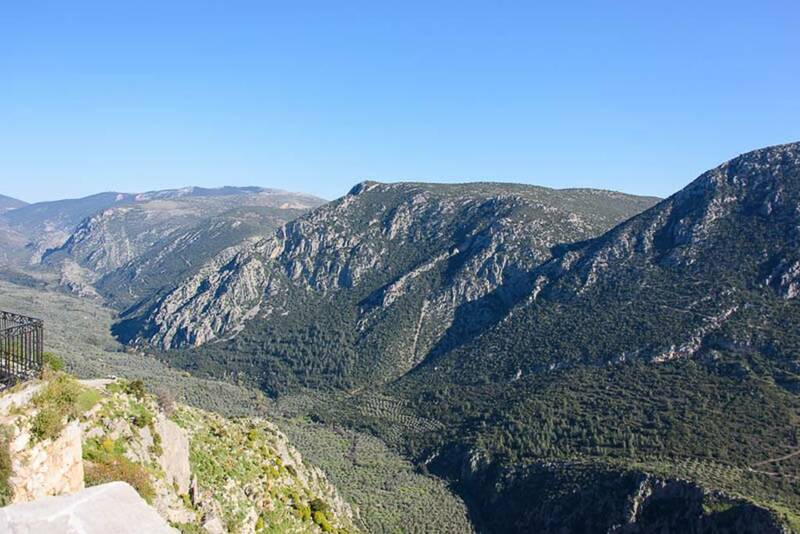 Greece is composed of 85% mountains. 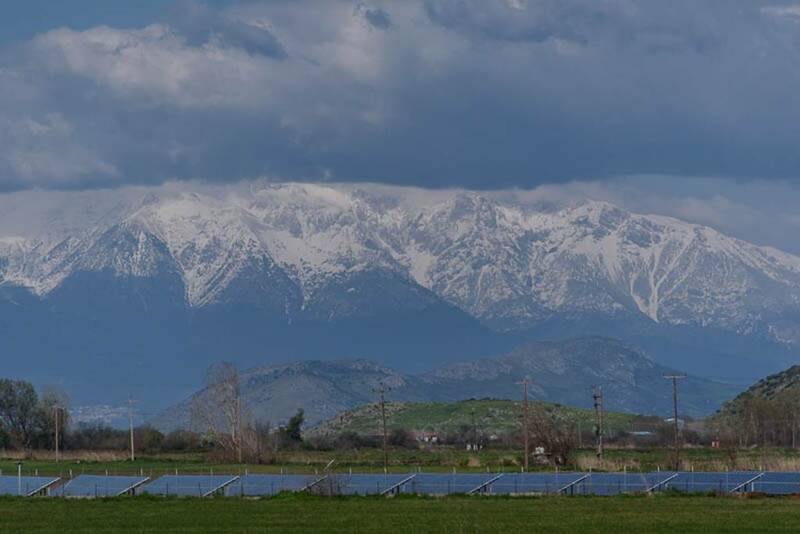 Snow covered mountains in the background, solar panels in the foreground. Sweeping valleys, between the majestic mountains. A brief glimpse of Mt. Olympus in the far distance. 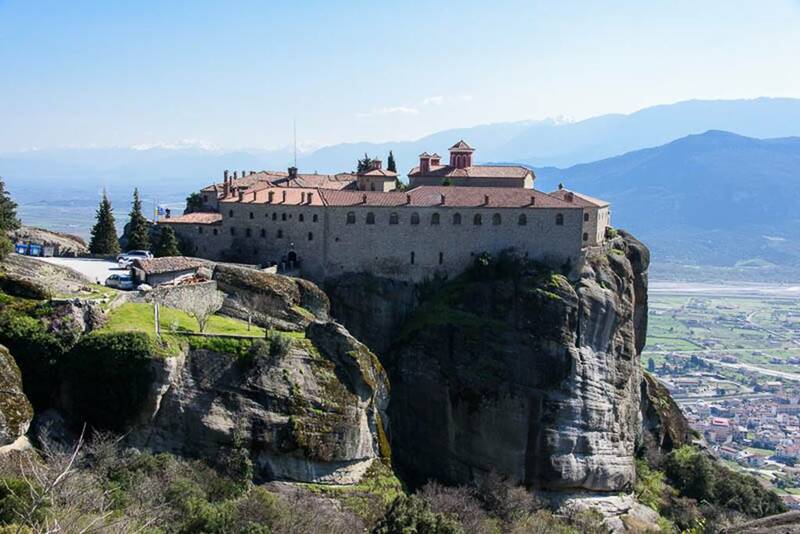 After 5 ½ hours of travel by bus we reach Meteora where we stop for delicious lunch. 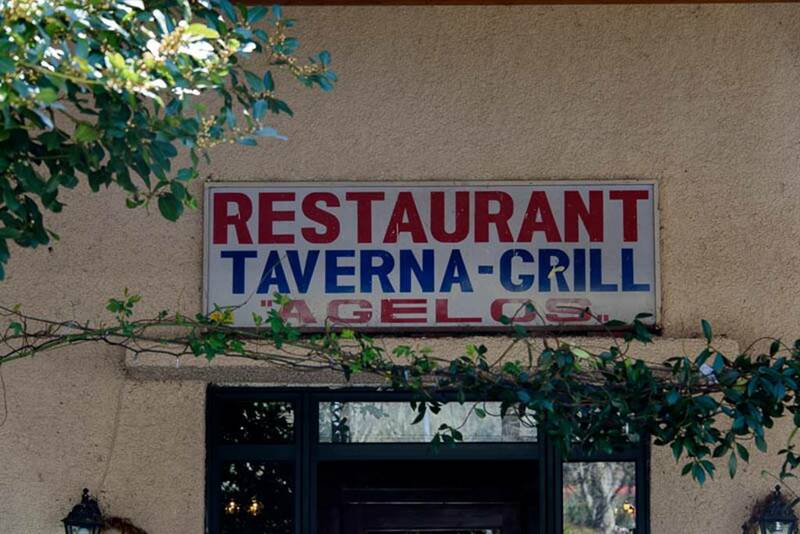 As I have found most Greek meals to be, it was huge and consisted of a large selections of appetizers (which could have been the meal itself) followed by the main and dessert. 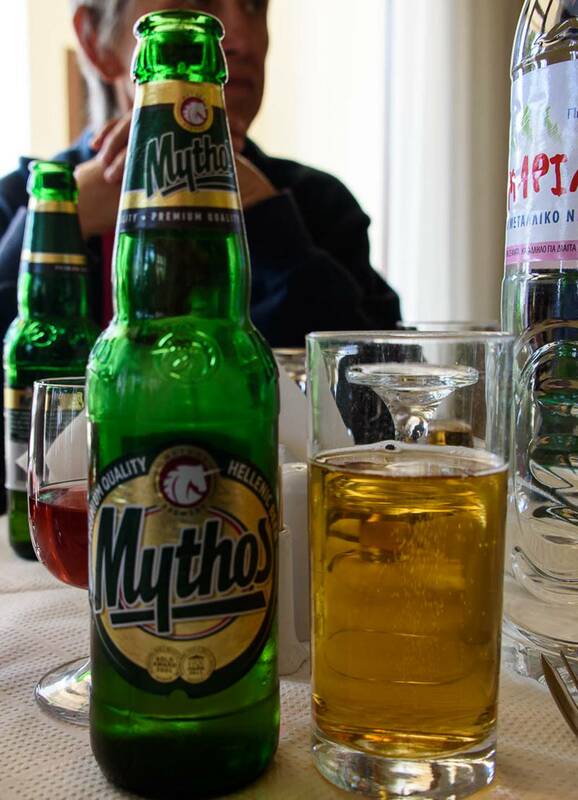 I had my first Greek beer a Mythos, which is a Hellenic style brew. It was ok, but on this trip I have yet to find a beer which rivals those of Northern Europe But in all fairness, this is wine country. 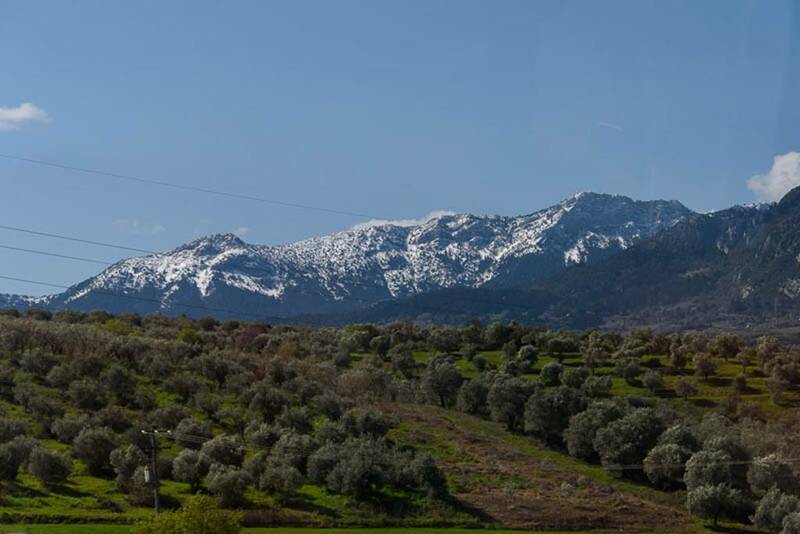 A view of the mountains from the restaurant. 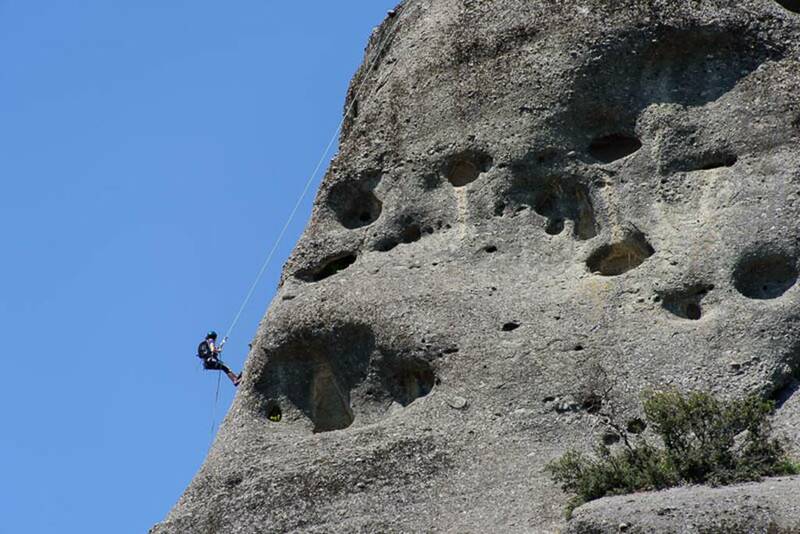 We saw many climbers. 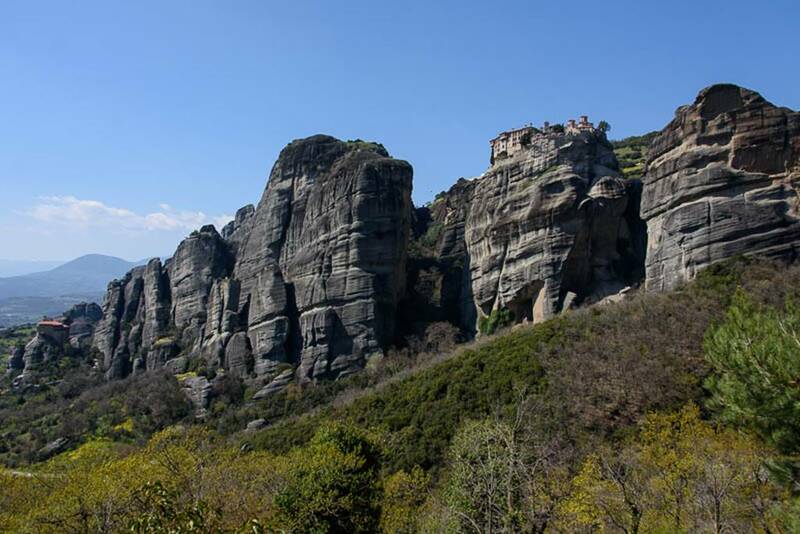 Meteora is a popular destination for hiking and rock climbing. 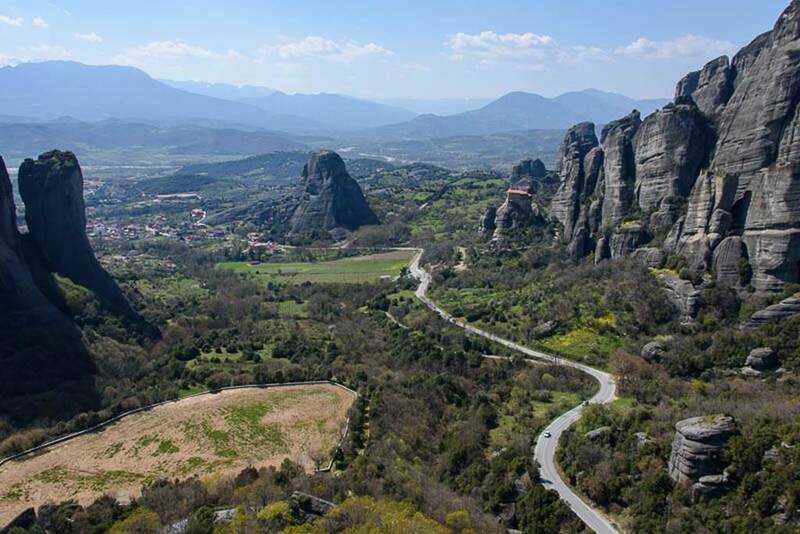 The Plain of Thessaly has been reorganized as the site of the most ancient habitation in Greece. 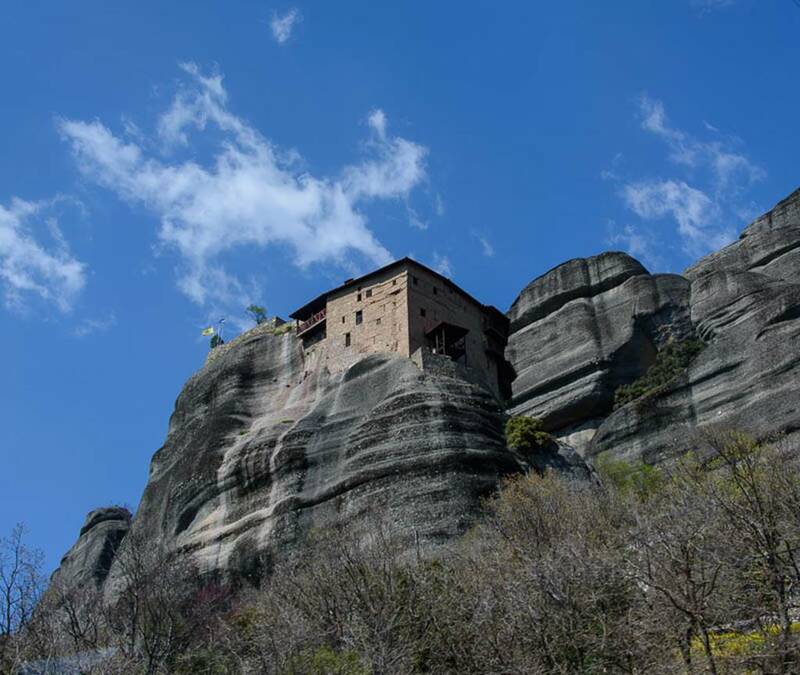 Meteora is nothing other than a group of lofty and precipitous rocks crowned with monasteries, retreats and cells, while its various caves have been turned into hermits’ cells for Orthodox monasticism since the 11th century. 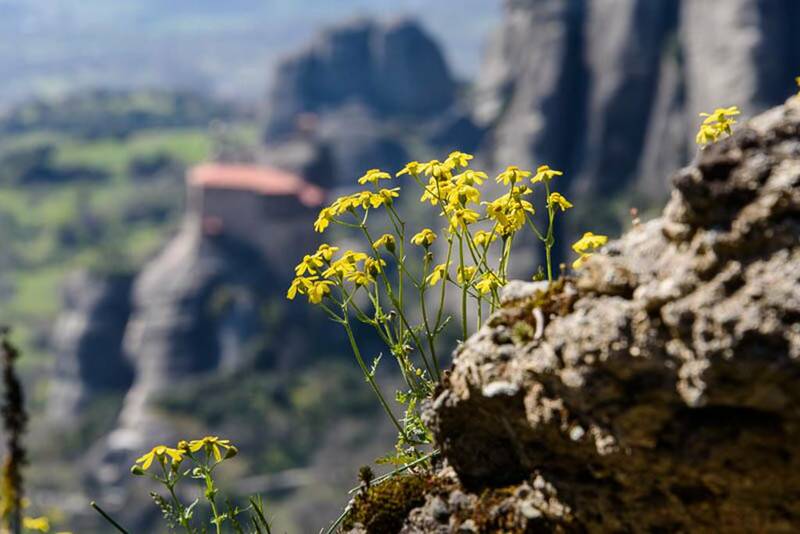 These pillows rise to over 1000 feet above the beautiful plain of Thessaly. The pillows were formed over 60,000 years ago when an ancient lake forced its way to the Aegean Sea, eroding the mountain and leaving these unique pillows. 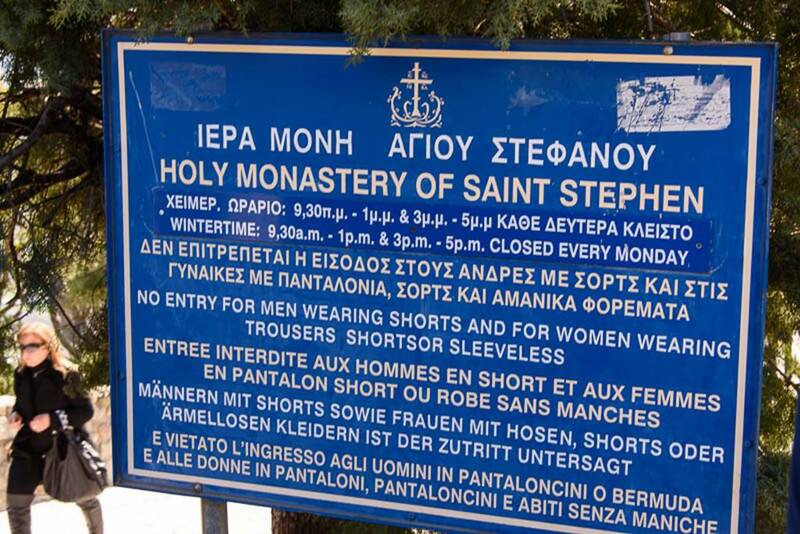 We were only able to visit two of the Monasteries which are now operated by nuns. 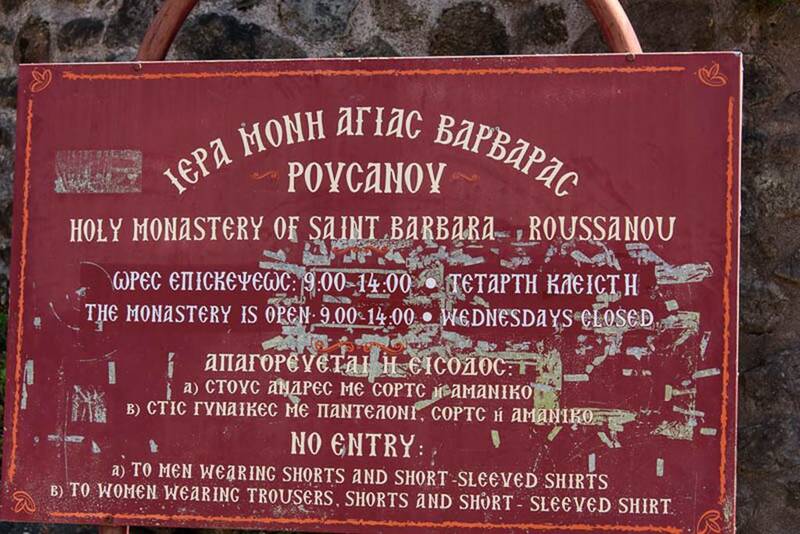 Only two Monasteries still are occupied by Monks and one only has two devotees left. 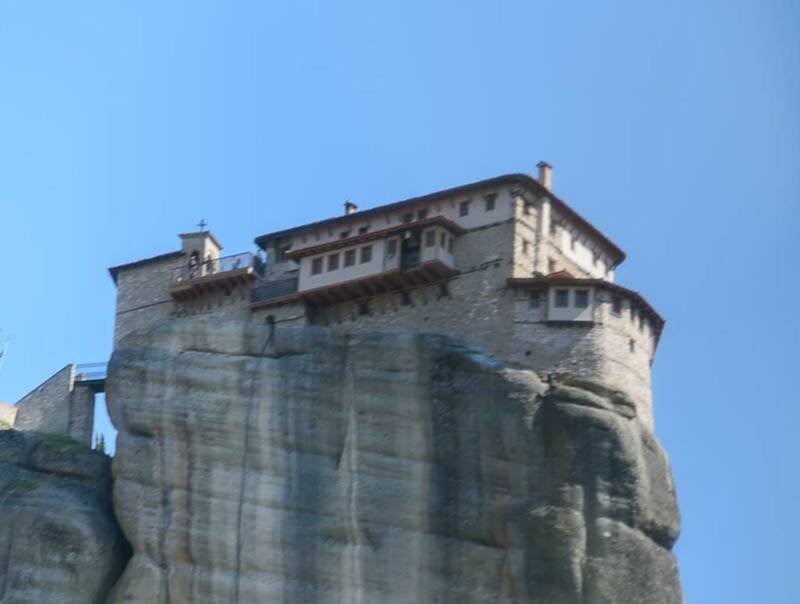 From the elevations, I was able to get photos of many of the Monasteries, but I haven’t had time to actually identify the specific ones from the book I purchased. Therefore, I will just present the photos for your viewing enjoyment. Rossanou was one of the sites we did visit. Unfortunately no photos are allowed inside any of the churches which was a shame because the fresco decorations are incredible! 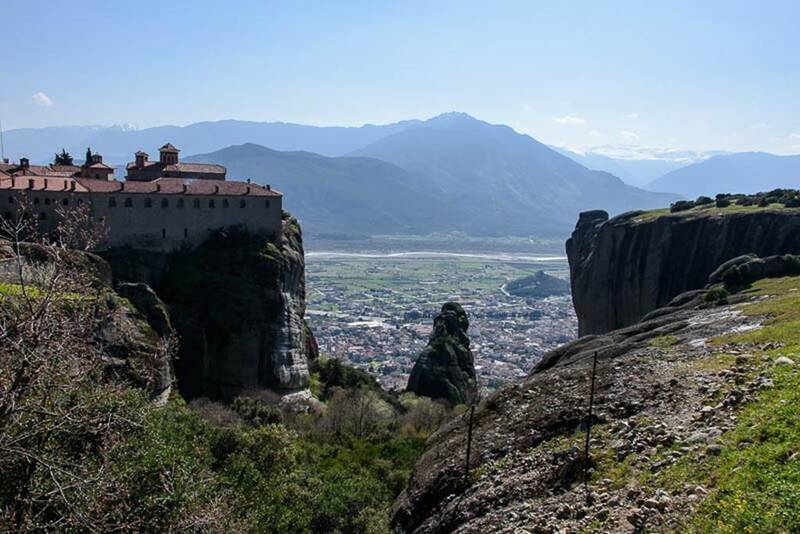 One of our fellow travelers took this photo for us, unfortunately we are out of focus but the monastery is quite beautiful! 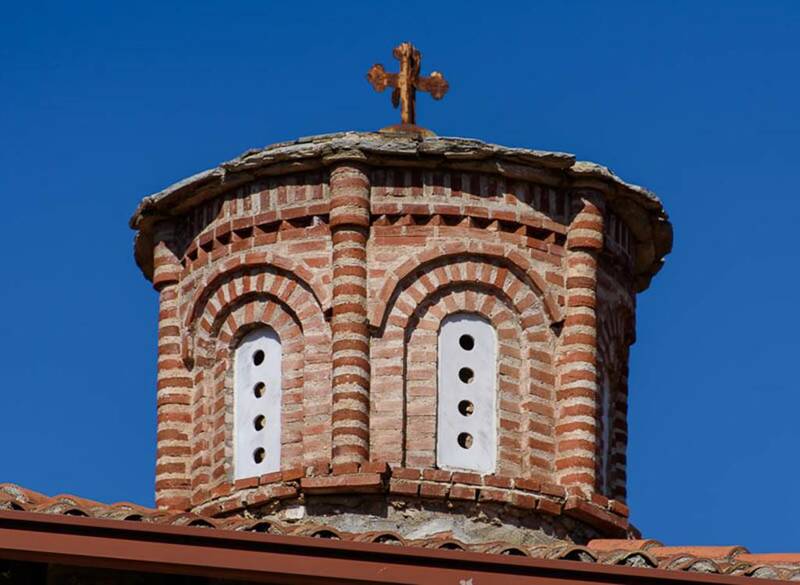 The Holy Monastery of St. Nicholas Anapausas, built in the 16th century, has a small church, decorated by the noted Cretan painter Theophanis Strelitzas, in 1527. 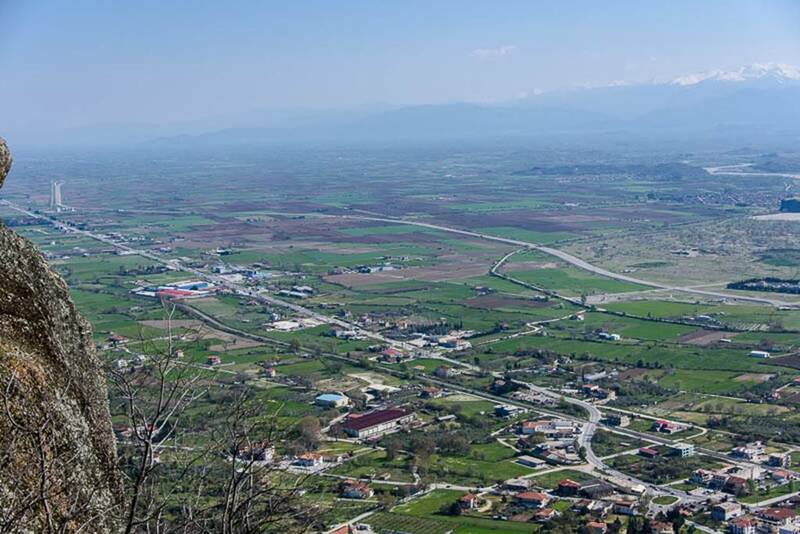 Looking down on the town of Kalambaka, where we spent the night. 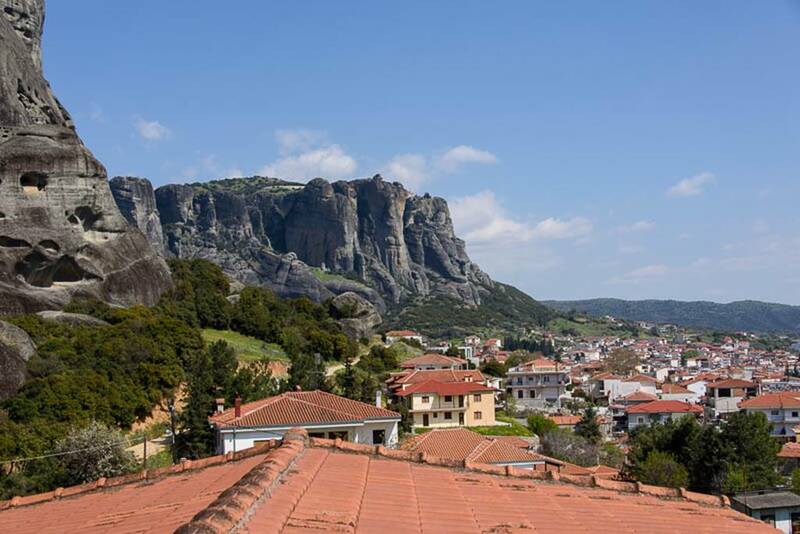 The view from our hotel balcony in Kalambaka. 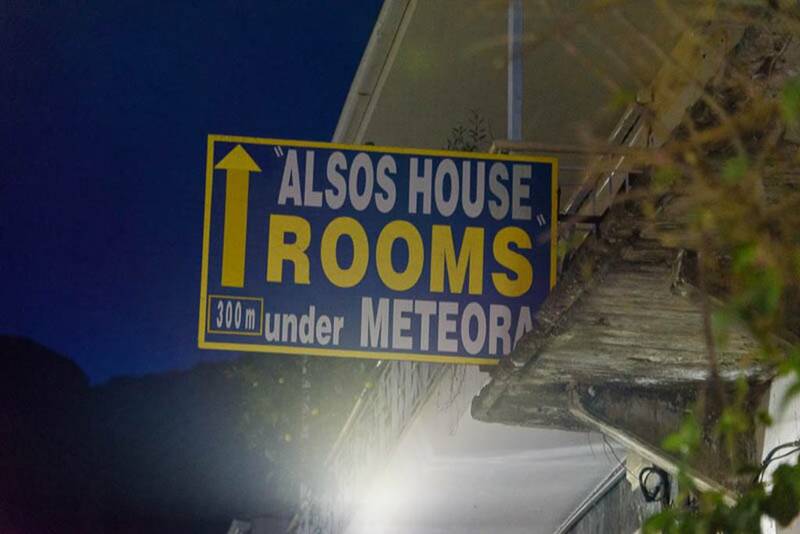 Our room is on the front of the hotel and Meteora is directly behind it. I walked around to the back of the hotel and got this photo of St. Stephens just at dusk. 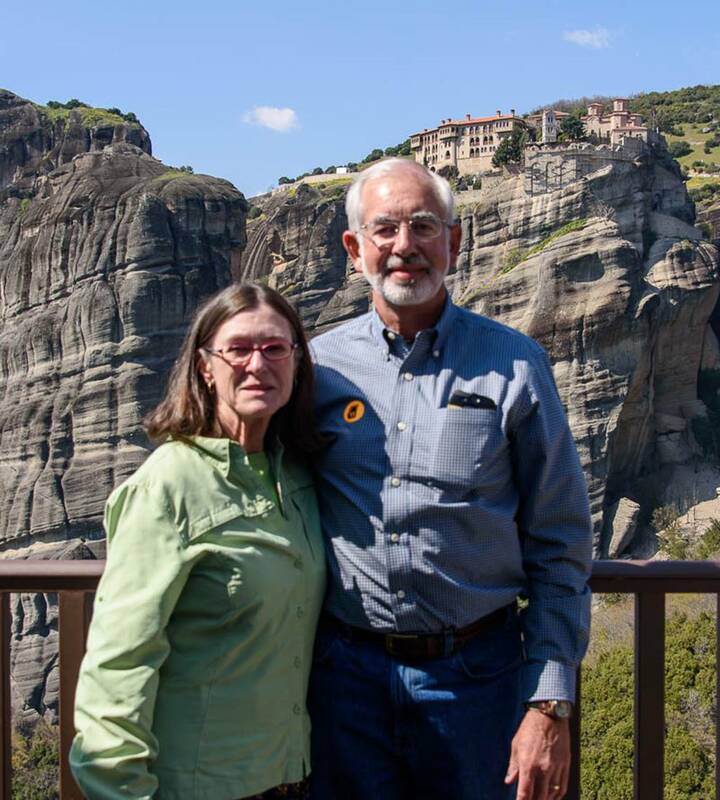 The timing of our visit to Greece was both a blessing and a curse. 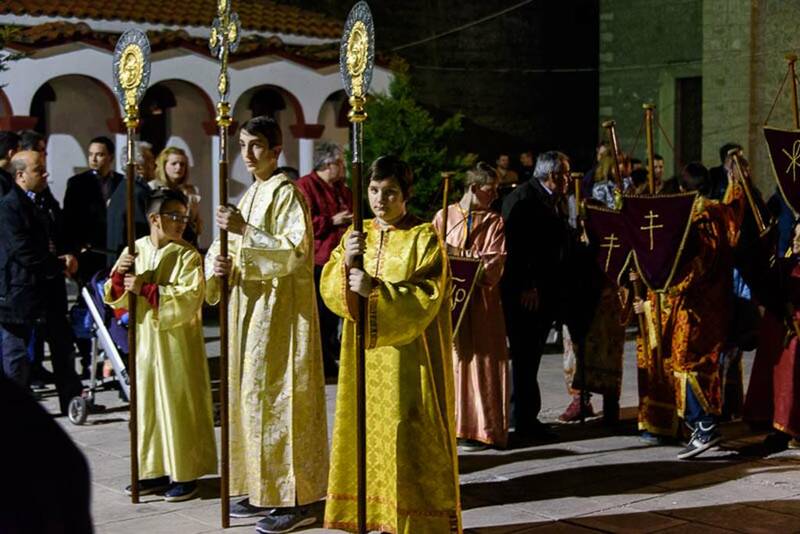 We of course celebrated Easter last Sunday. 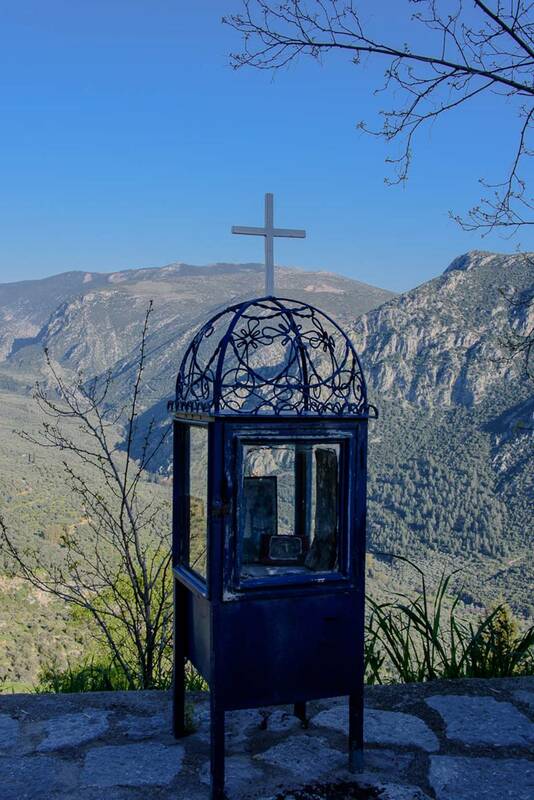 In Greece where the official religion is Christian Greek Orthodox and the vast majority of Greeks are of this religious persuasion. 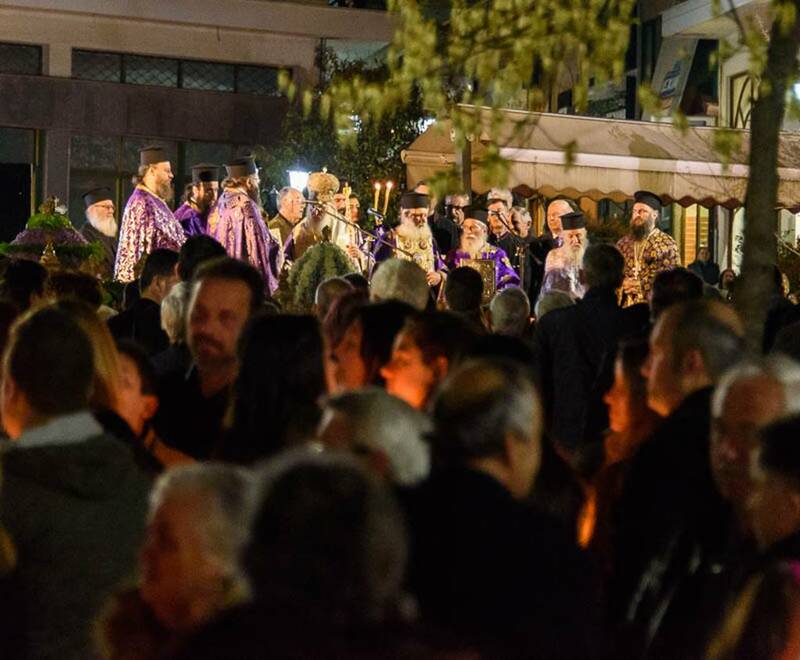 In Greece, Easter is recognized according to the Julian calendar rather than the Gregorian calendar (which is what is currently used almost worldwide). 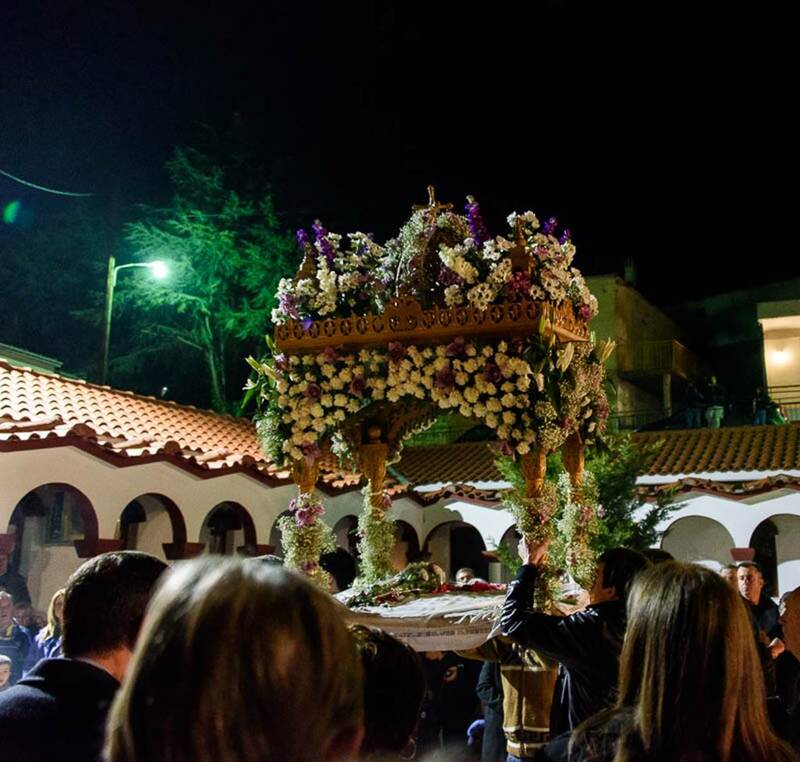 As a result the Greek Easter usually occurs after our Easter, in this case only one week later. 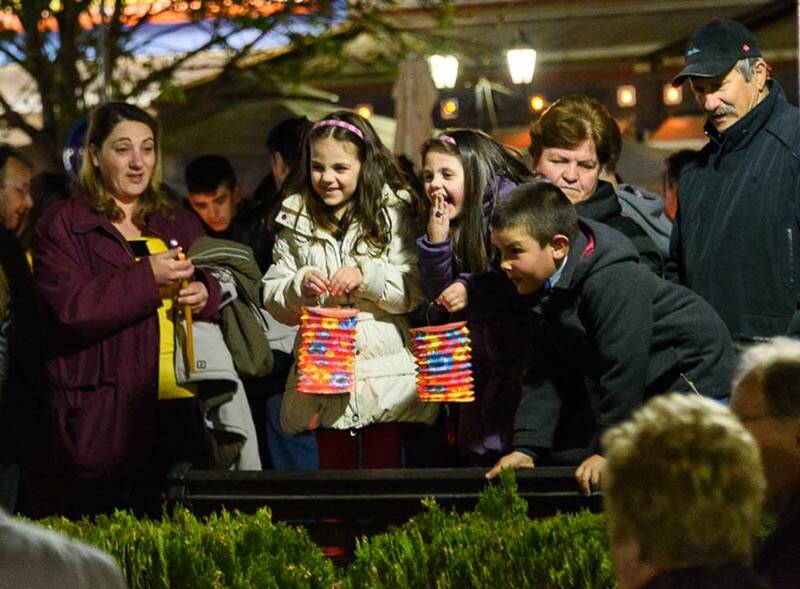 The Greeks celebrate Easter for the full Easter week with various events each day. Since this is a Religious holiday weekend, the hours of stores, museums and historical sites are changed. Almost all are closing early on Saturday and opening late on Sunday. 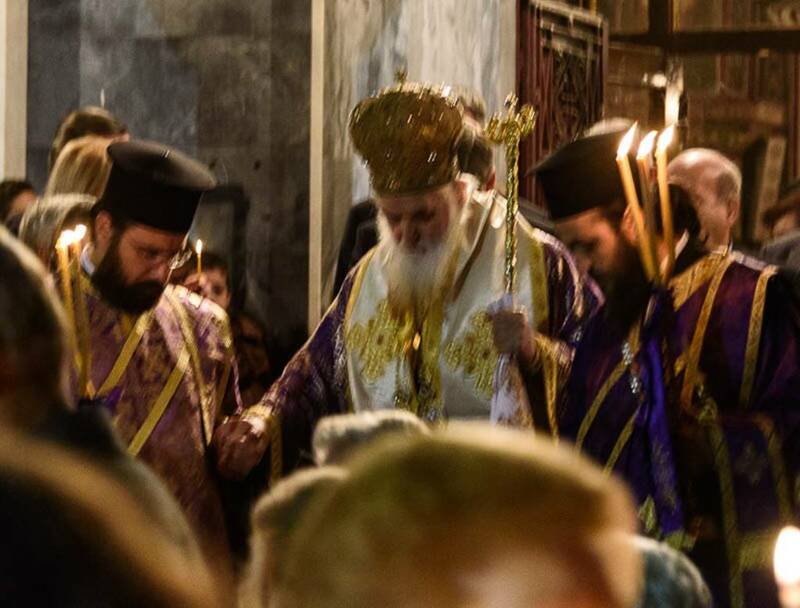 On Friday while we were in Kalambaka, we had the opportunity to participate in the Procession of the Epitaph, one of their most sacred ceremonies. 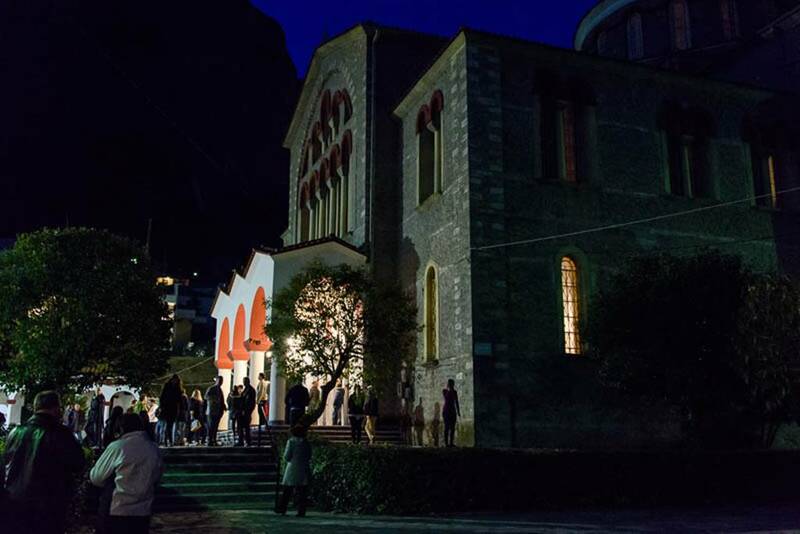 In towns all over Greece, people gather at their church for a ceremony, then make a procession from their individual churches to a central location where members of all the churches join for a joint ceremony. It was quite impressive and massive, and this was in a small town. 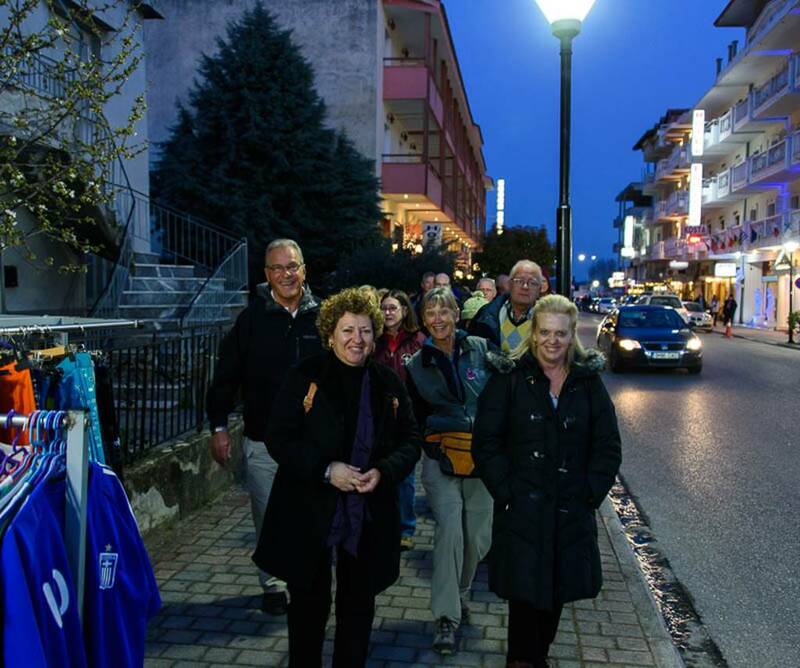 This was our group making our way to the church, about a half mile walk from the hotel. The church where we met. Alter boys getting ready to lead the procession. 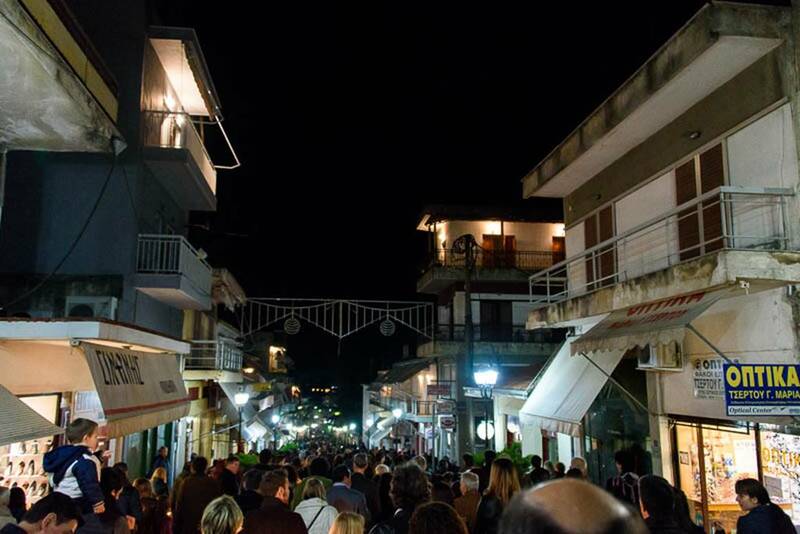 The crowd was body to body along the narrow streets, but everyone was patient and we observed absolutely no problems. There were all ages and all forms of dress, from very casual to suits & ties. 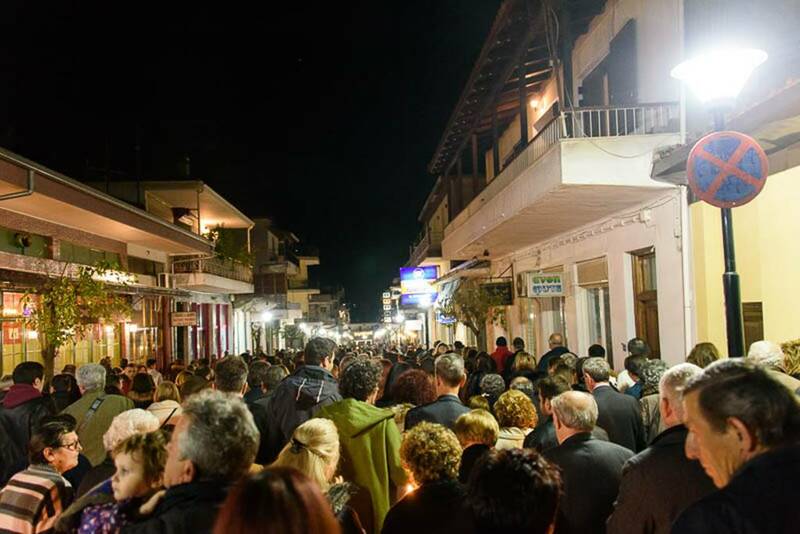 Gathering in the town square. Walking back to the hotel room, Kay and I stopped at a pastry shop. 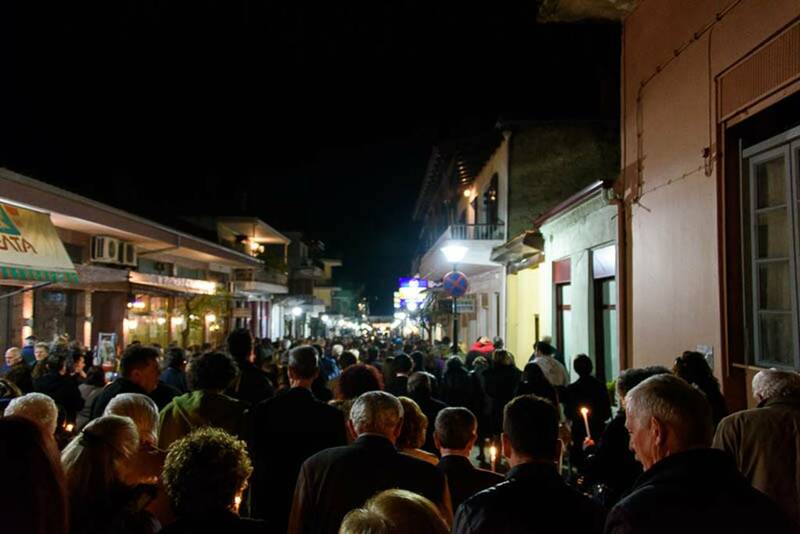 On the Procession night most businesses stay open quite late, with many people having dinner after the ceremony around 11 or 12 PM. The ship must have had 150 varities of pasteries! We selected three and had to leave the shop before we went crazy! We got back to the Hotel for a goods nights rest and an for an early start tomorrow. 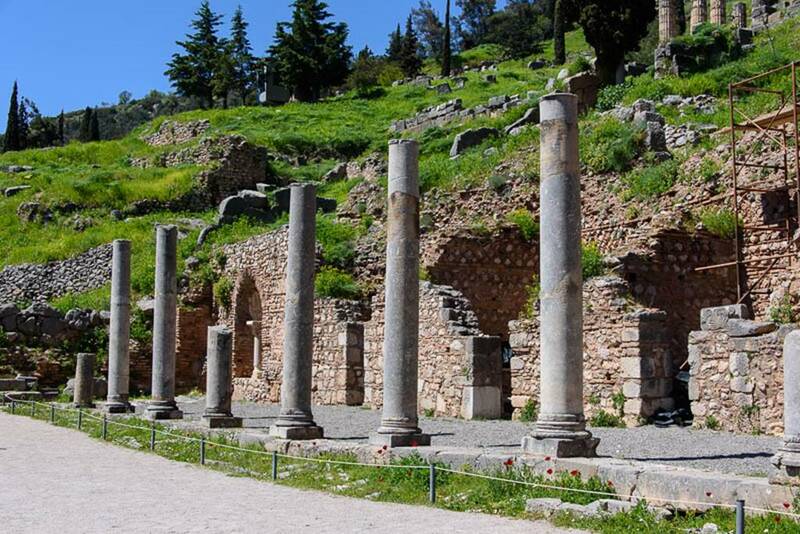 We have another several hours of bus ride to reach Delphi before it closes at 2:30 PM. Everything is closing early Saturday because this is Easter Saturday and a holiday. Most people will be attending a Midnight church service and then having a meal. Early Sunday morning the people will begin to prepare the traditional Easter Feast. 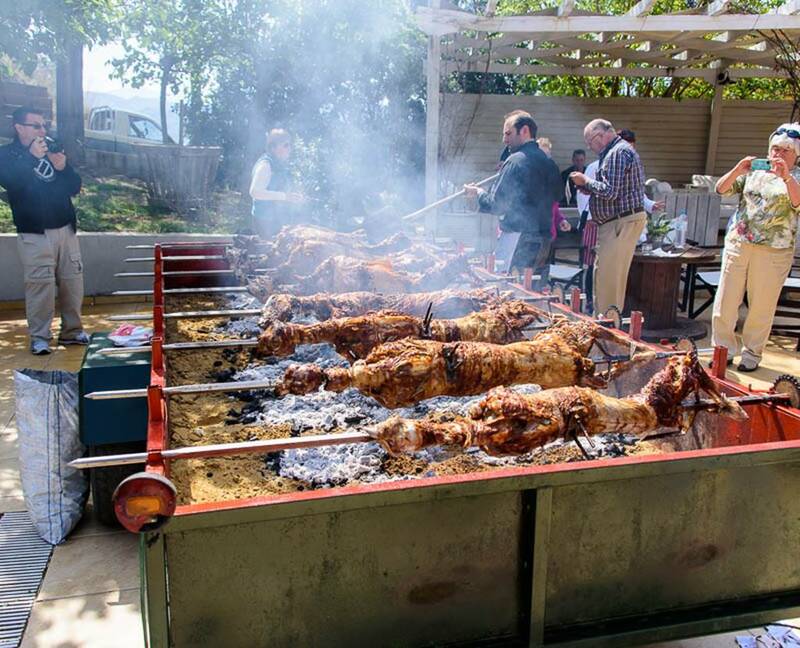 We have already seen wood and charcoal grills set up for the roasting of whole lambs which is an absolute requirement. 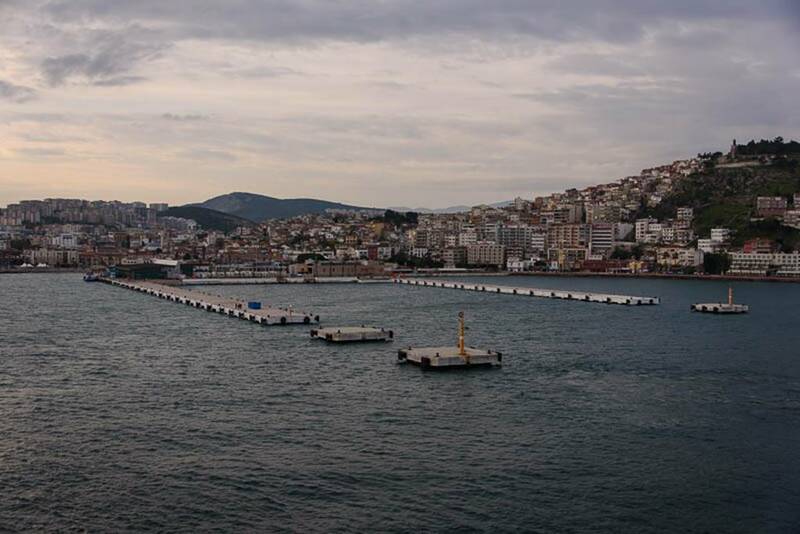 We arrived about 7:00 AM in Kusadasi, Turkey, a coastal city of about 100,000 people located on the country’s western coast. 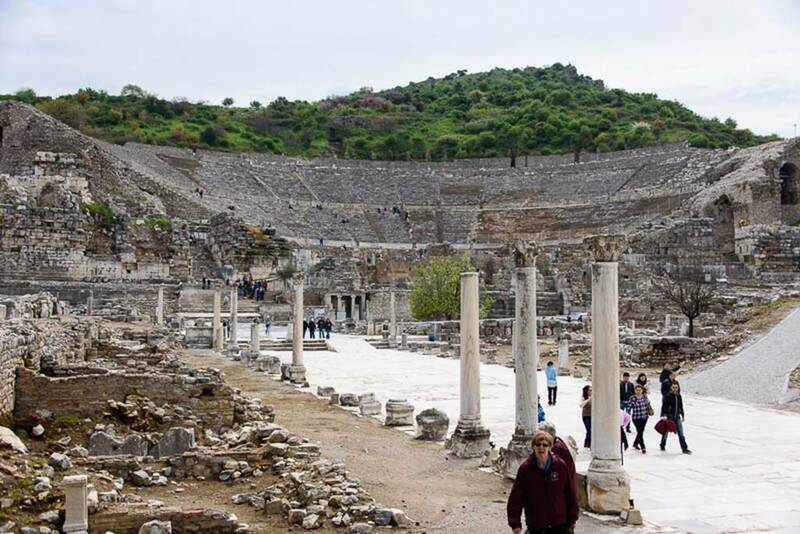 The first human settlement at Ephesus occurred during the Neolithic period, c. 6000 B.C.. 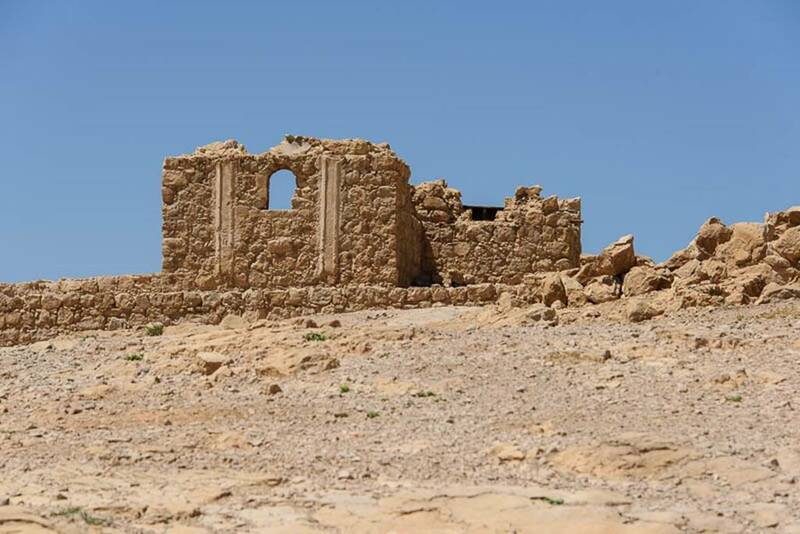 The area is famous for its art, culture, history and especially its magnificent ruins. We were fortunate as we arrived at the very beginning of the tourist season, our guide told us we were the first cruise ship this year. The weather was cool, but comfortable in the high 60’s. That is much better that the 110-114 which may be reached during the summer. Beautiful overcast morning as we sailed into port. 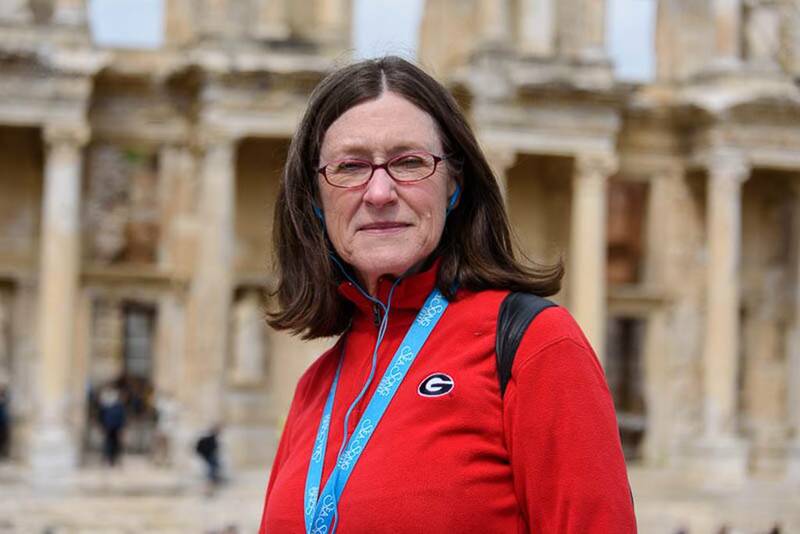 Our tour today took us to three major sights, the house where Jesus’s mother Mary is thought to have lived the last years of her life, the fabulous ruins of the ancient city of Ephesus and finally to the Basilica of St. John. A view of a peach orchard along the way to the Mary’s house. 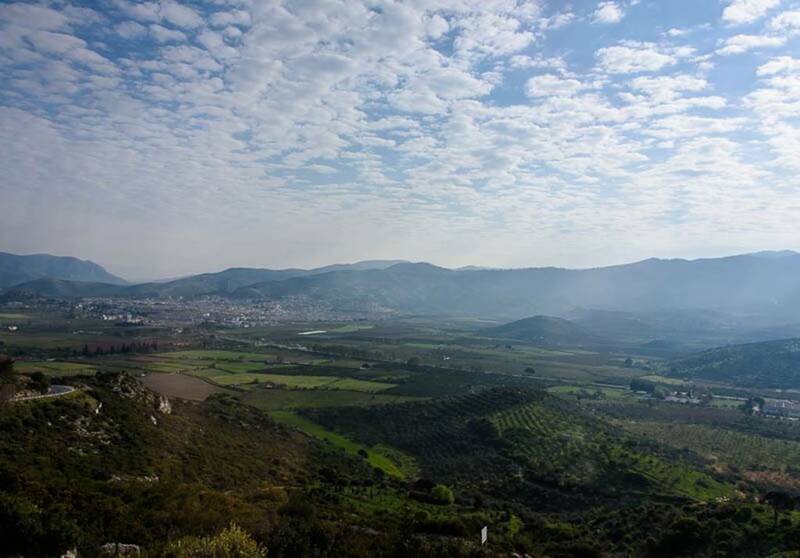 The many valleys of the area are fertile and a number of different crops are cultivated. It’s hard to believe that this scene is only about 30 minutes from the coast. The persecution of the Christians by the Romans and the conservative Jews increased during the reign of Roman Emperor Caligula (37-41 A.D.). 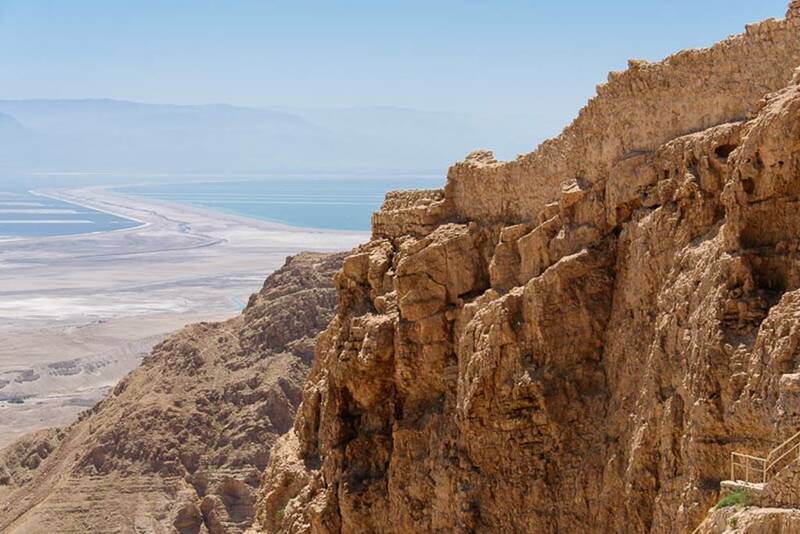 It reached the point where the Apostles could no longer remain in Jerusalem and they decided to scatter to various lands in order to save their lives and spread their beliefs. 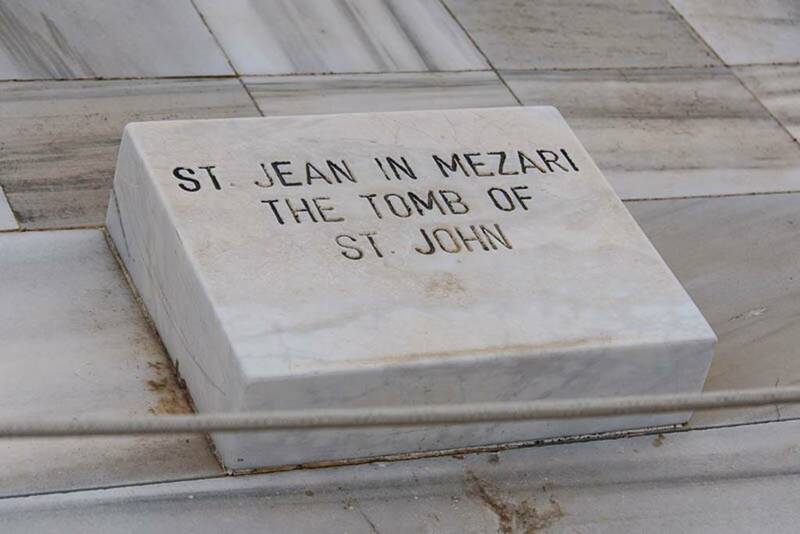 Roman Asia Minor was given to St. John. 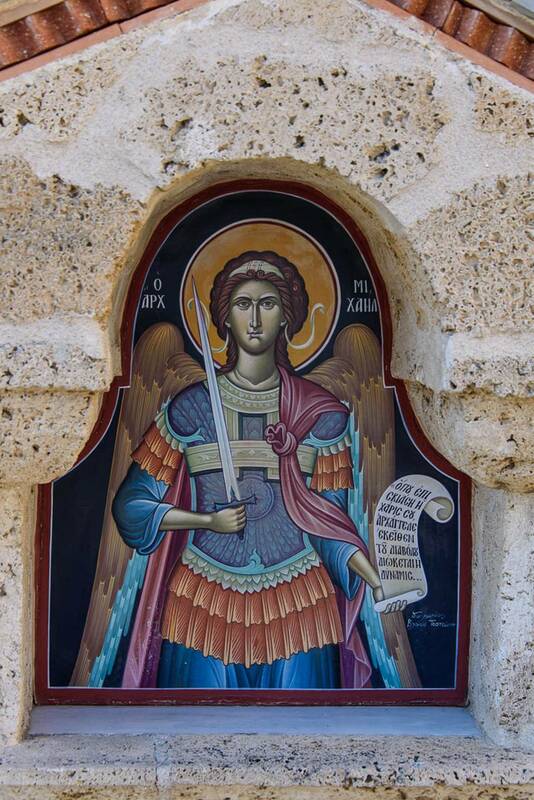 The Apostle John, took with him the Virgin Mary who had been entrusted to his care by Jesus. 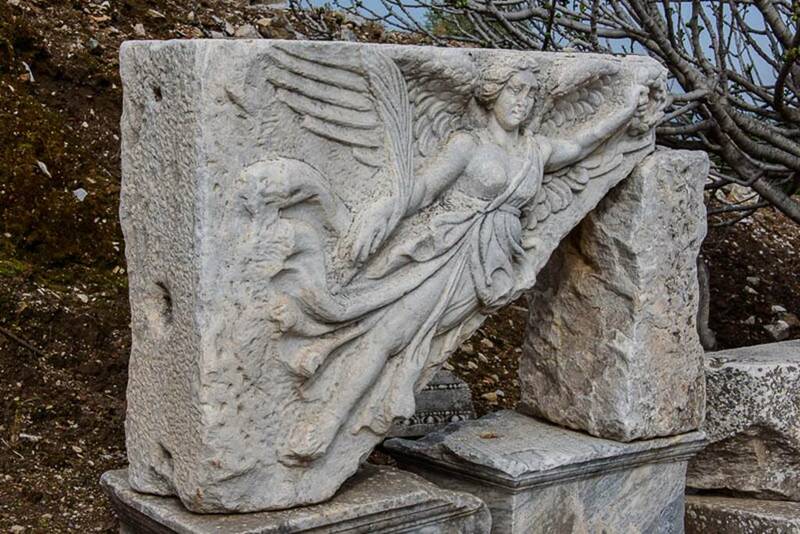 They arrived near Ephesus between 37 and 42 A.D. A number of historical documents attest to the fact that they were here during this period. 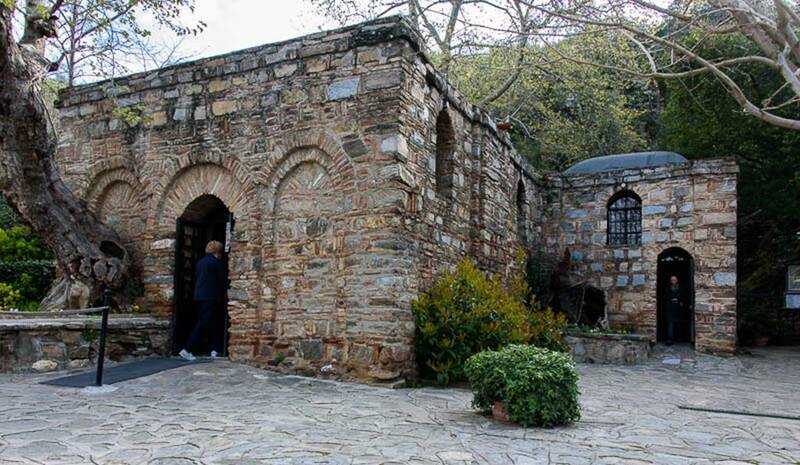 The “discovery” of the ruins of this house has a long and interesting history which I will not go into on the blog but those interested might Google “Gregory of Tours” and “Katerin Kmmerik” go find starting points of research. Mary’s house as reconstructed for the foundation which dates to the 1st century. Supplications and prayers to Mother Mary. 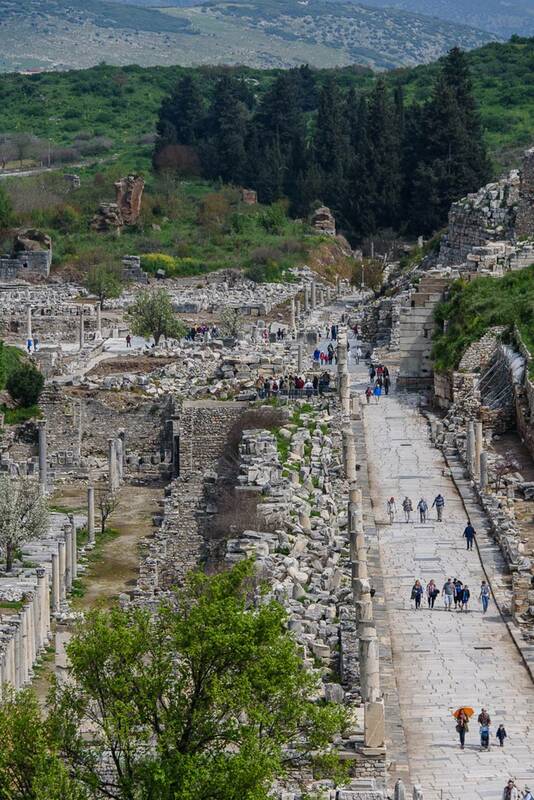 After leaving the mountain with Mary’s house we traveled into the valley between two mountains to begin our exploration of the ancient city of Ephesus. 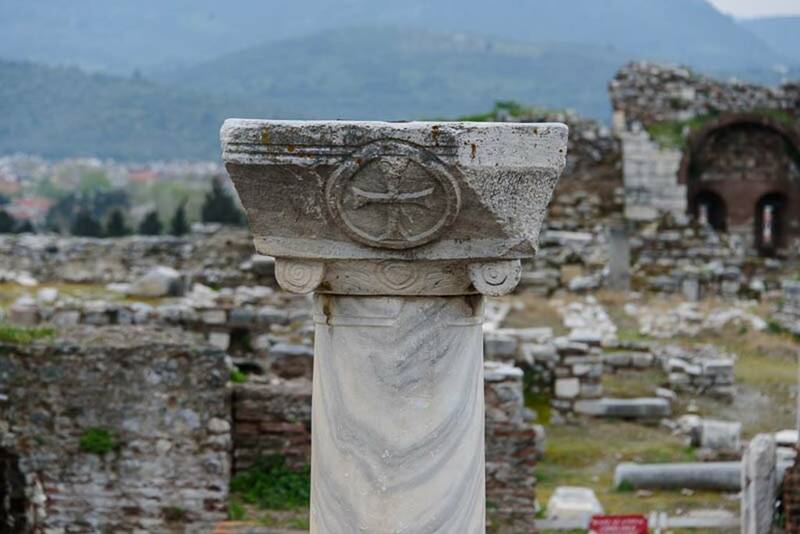 The history of Ephesus can (and does) compromise volumes of books, but I will attempt a very brief outline of its history. 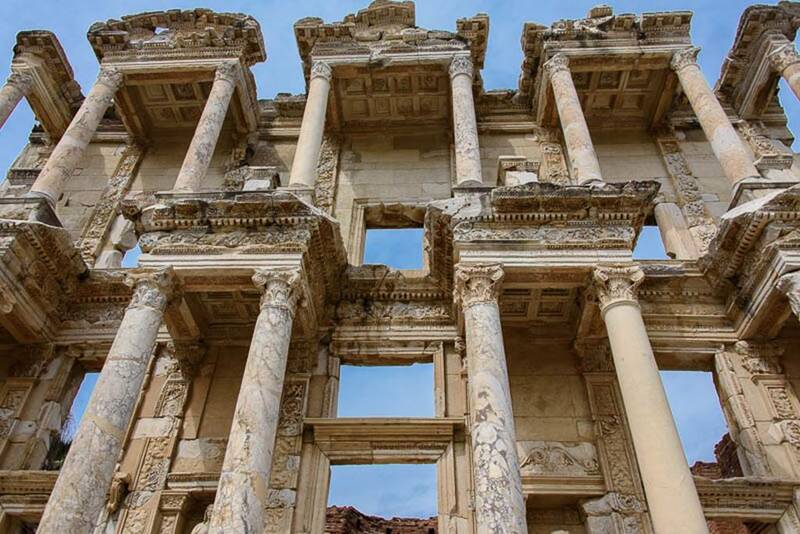 Many of you I am sure will want to skip this section and for those of you who do read it, please keep in mind that many details and great gaps of history have been omitted, but if it sparks your interest I invite you to obtain one of the many books of the history of Ephesus. 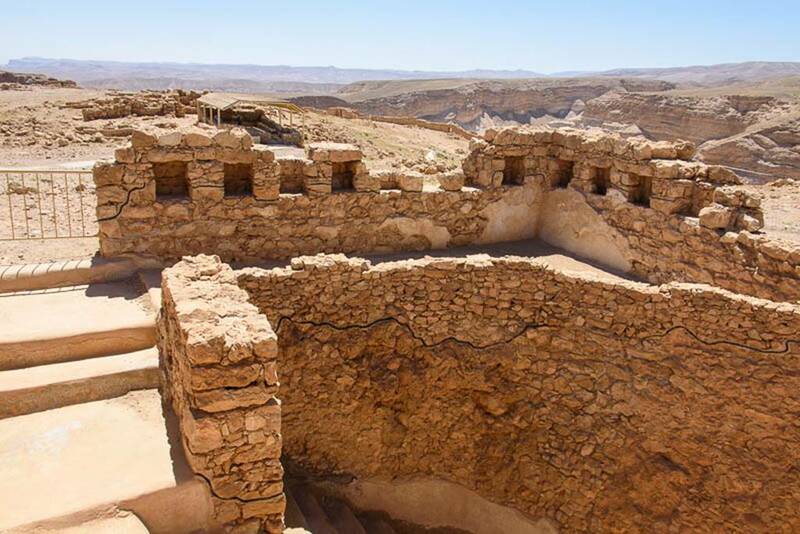 As stated previously, the earliest human occupation has been dated to about 6000 B.C. 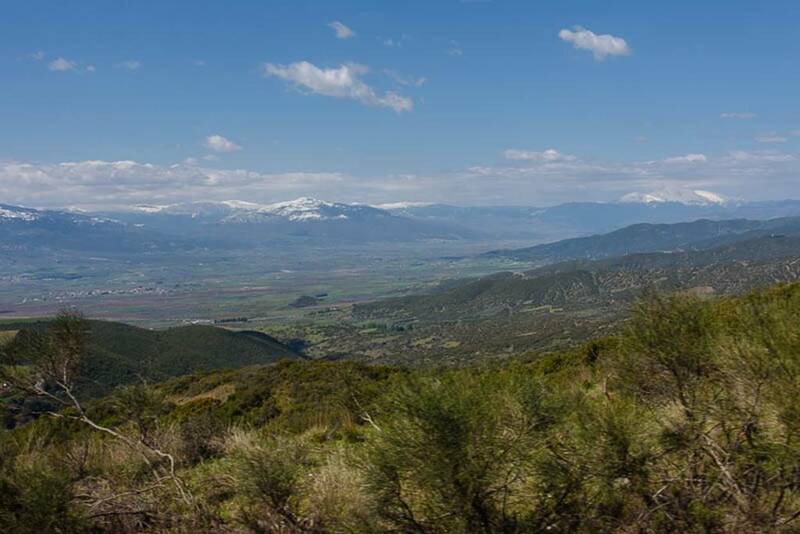 Artifacts indicate that a Mycenaean settlement was in the area during the Bronze Age and the Hittite Period. 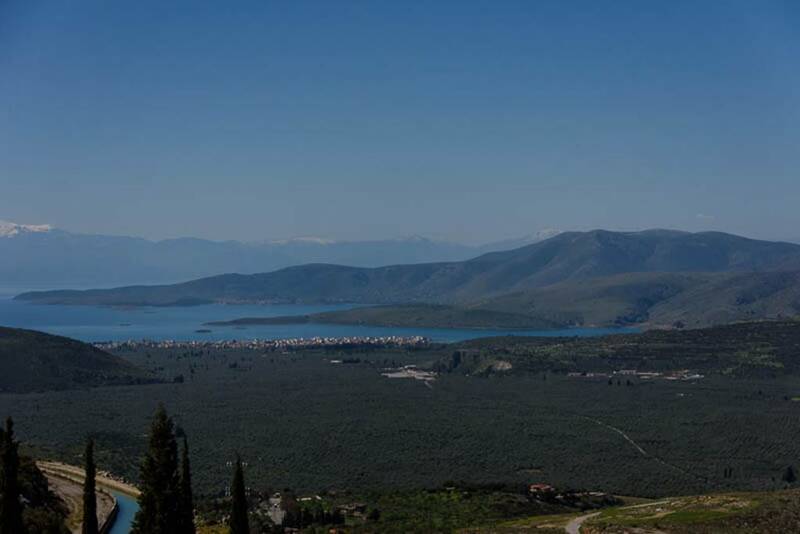 At this time the city was called Apasas. 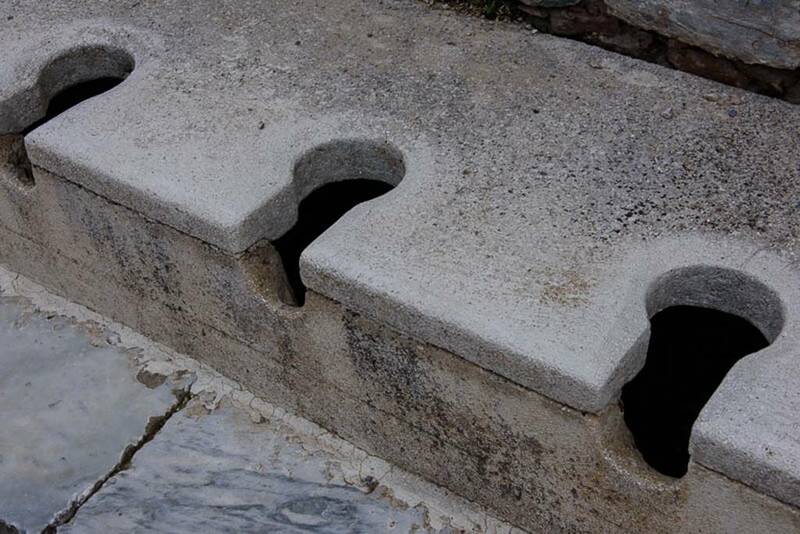 Around 1200 B.C. 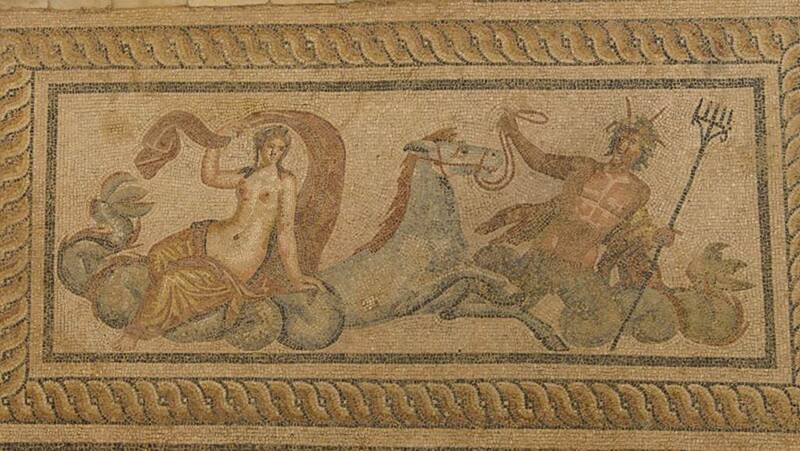 with the wave of migrations from Central Europe there were Dorians, Aeolians and Ionians passing through the area. 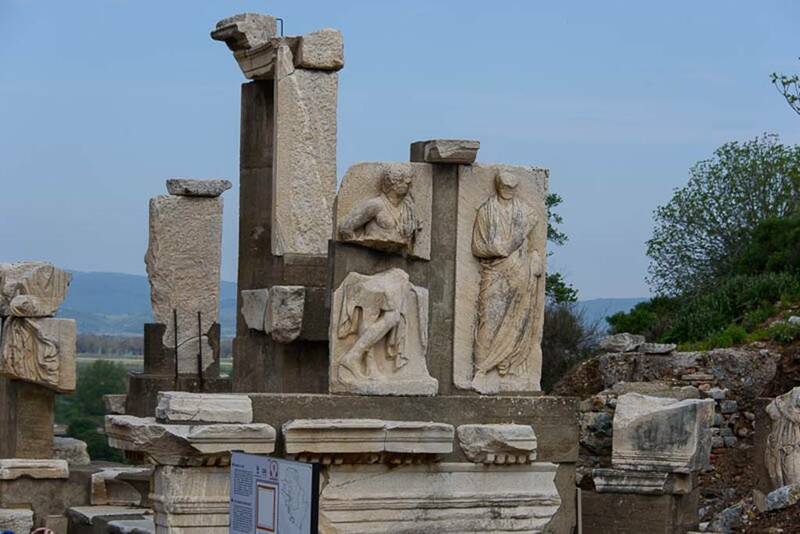 It is supposed that Andorklos established the Ioanian city of Ephesus and his rule was successively followed by rule of oligarchy and tyranny and then democracy. 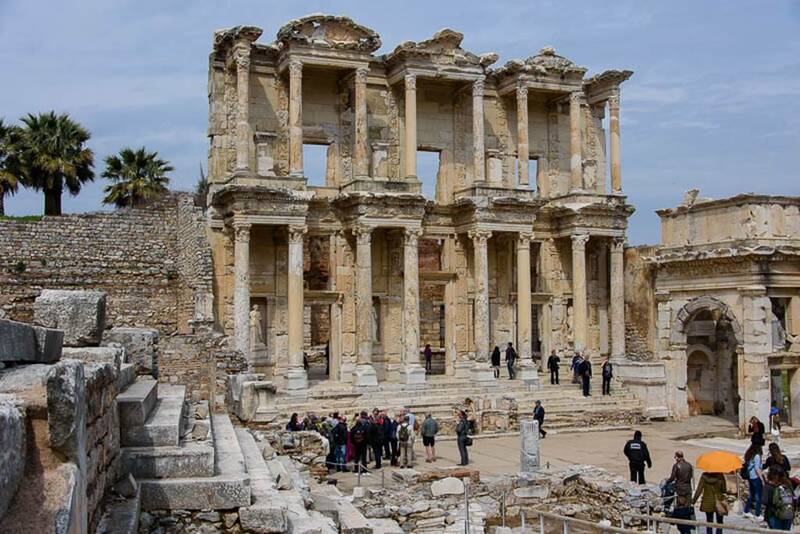 The first information about Ephesus dates from the 7th century B.C. that the city was a member of the Panionion, the Ionian League. There were a number of wars and rulers until the city was conquered in 34 B.C. by Alexander the Great and a period of prosperity for about 50 years began. 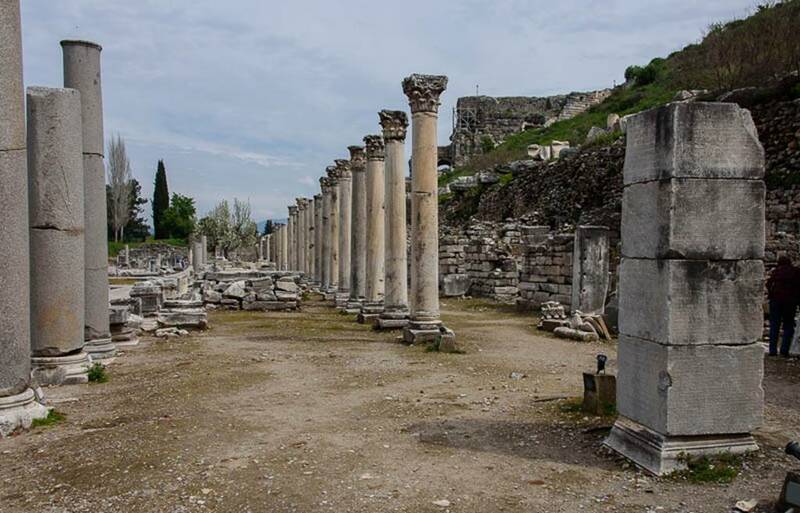 Later when the Romans defeated the Syrian King Antiochus in 189 B.C., in his last testament, Ephesus was left to Rome. 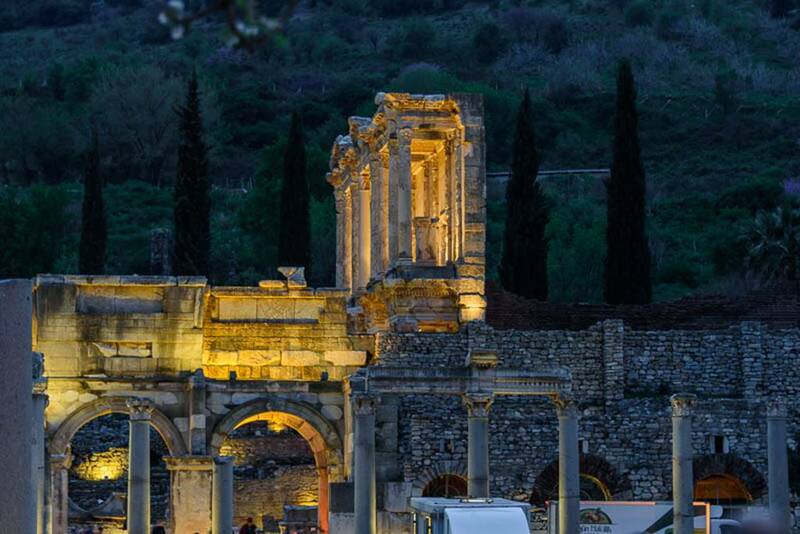 Again there were several rebellions but in the Augustan Period, Ephesus became one of the most important cities of Roman Asia. 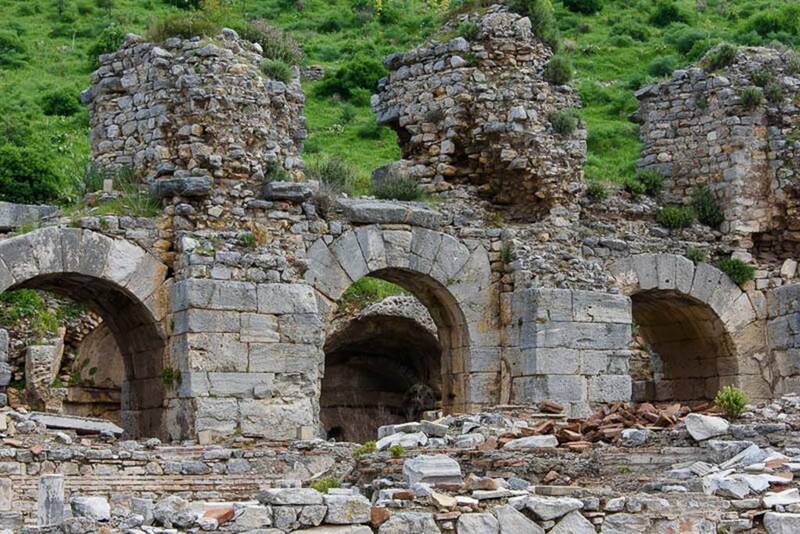 When the aqueduct was built between 4 and 14 A.D, it made the city the largest and most important city of the Roman Empire in Anatolia. 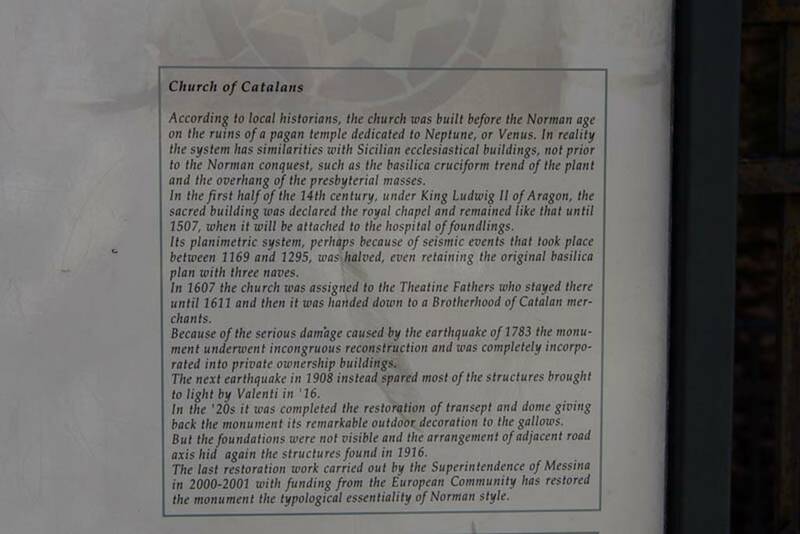 In the meantime, Christianity was rapidly spreading in the city. 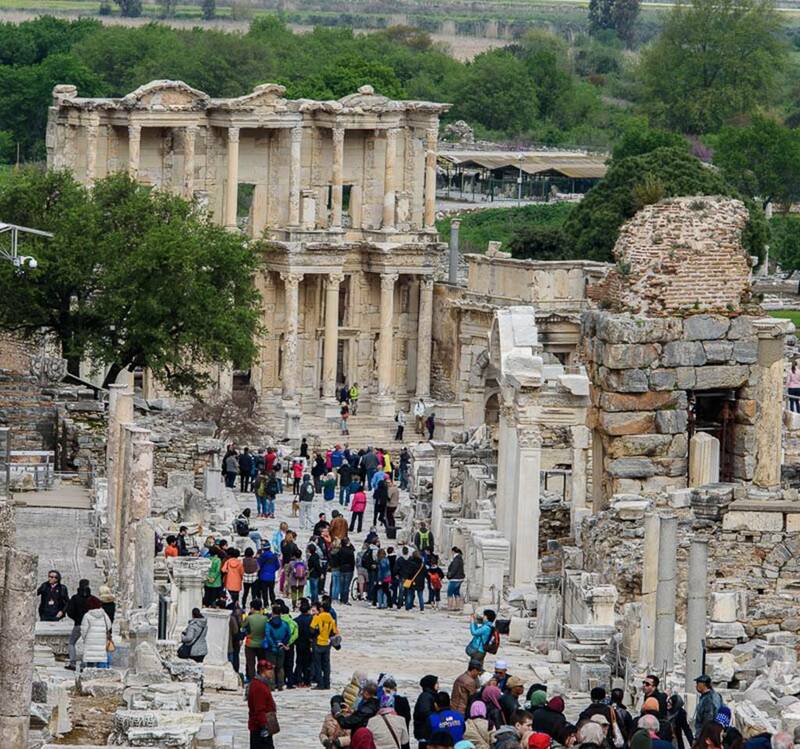 In 57 A.D., the Roman population who opposed what St. Paul taught rioted against this new religion in the theater of Ephesus. (where we heard the concert tonight!). 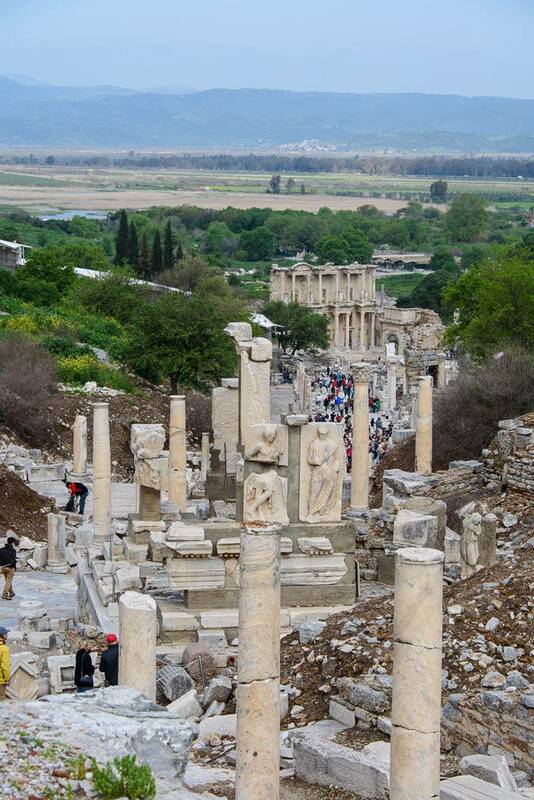 In 262 A.D. the Goths sacked both Ephesus and the Temple of Artemis and after this disaster the city was unable to return to its former prosperity and glory. However Emperor Constantine I, built a bathhouse and Emperor Arcadius constructed a street extending from the grand theater to the harbor. 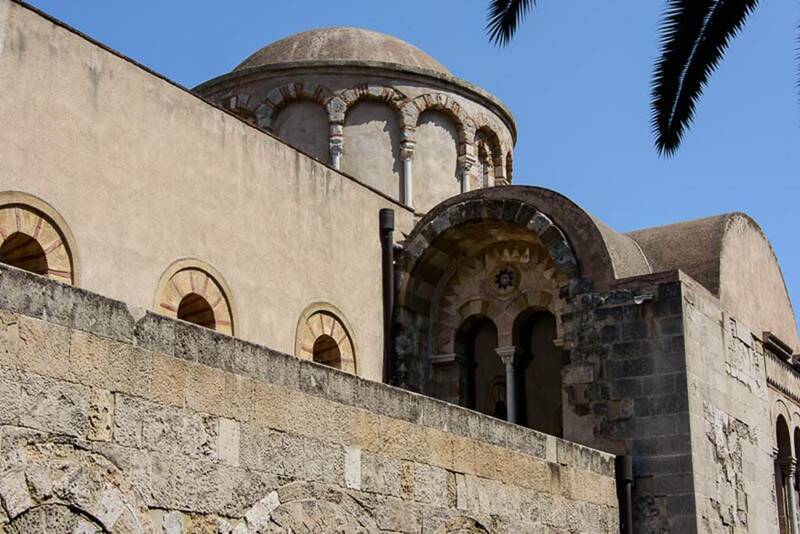 In 431 A.D. the Third Ecumenical Council gathered at the Church of Mary in Ephesus where the definition of the Virgin Mary as the Mother of God was accepted. By the beginning of the Middle Ages the port of Ephesus had silted up, with the deposits made by the River Cayster and consequently Ephesus was no longer a seaport and center of trade, thus reducing its importance When Ephesus was conquered by the Seljuks in 1090, it was only a small town and after the short lived golden days of the Aydinogullari Emirate in the 14th century, Ephesus was abandoned. The upper bath house on the northern entrance into the city. 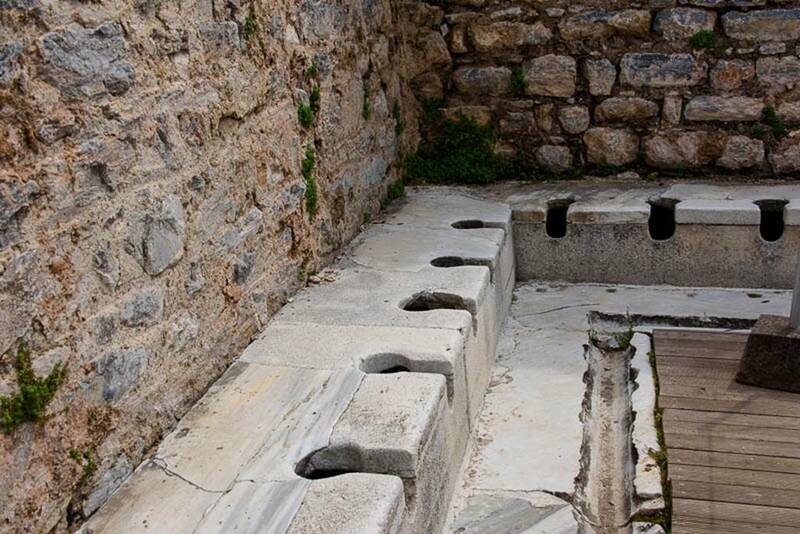 These baths were ruined many times due to seismic activity but were repeatedly repaired. 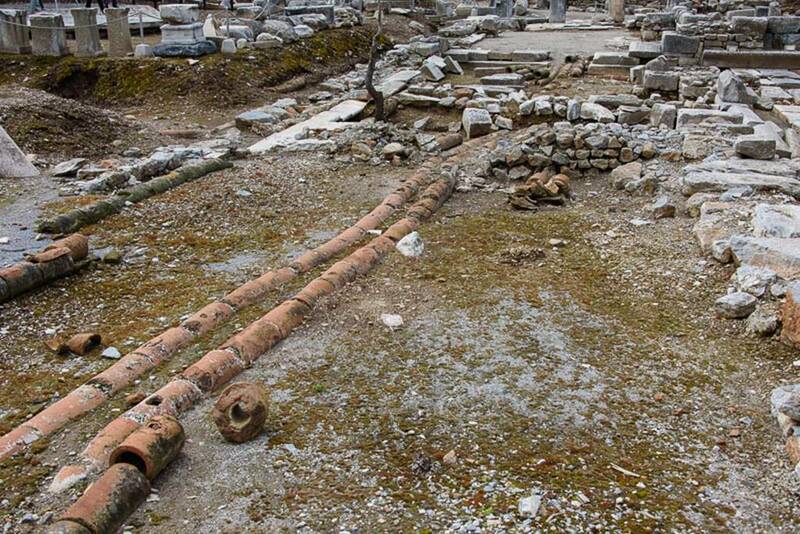 The city had an extensive water system as can be seen by some of the original pipes. A part of the “Royal Walk” which was covered, as were many of the streets for protection from the fierce summer sun. A long range view of the Library of Celsius. The monument of Memmius. 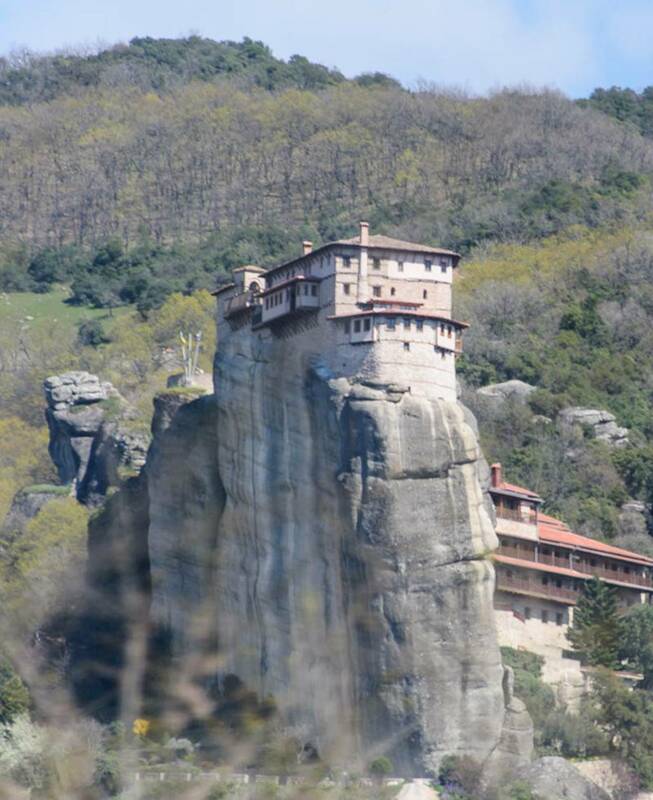 Constructed in the third quarter of the 1st century B.C. 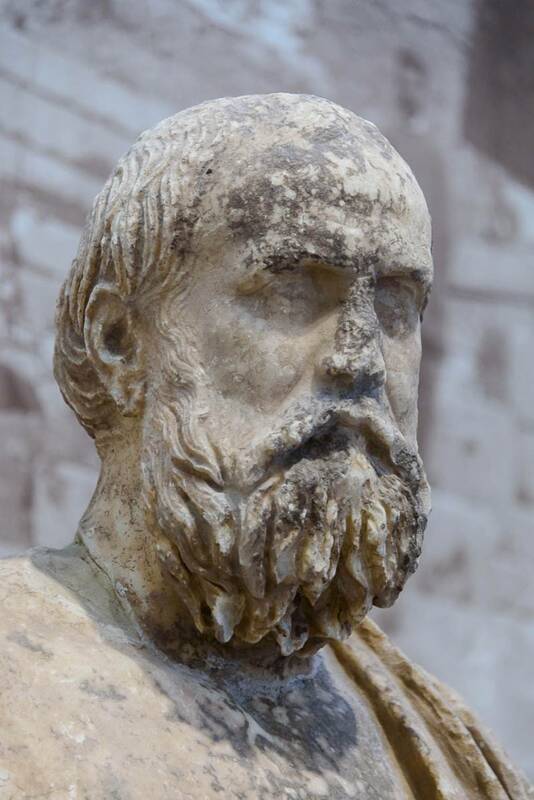 In 1960 an inscription was found which recorded the name Memmius in both Greek and Latin. 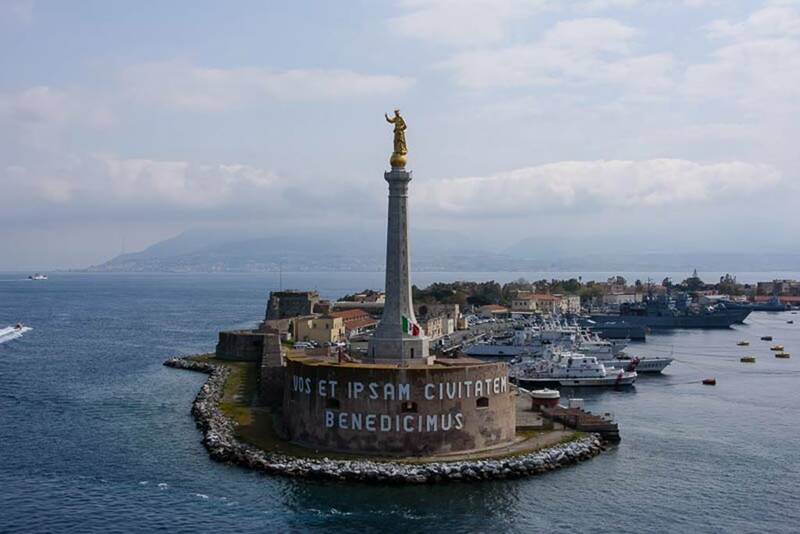 It was erected in honor of C. Memmius, the nephew of the Roman dictator Sulla, by Gaius Memmius, one of the prominent residents of the city. The virtues of the Mimmius family are depicted in a personalized manner. An early symbol of pharmacy. 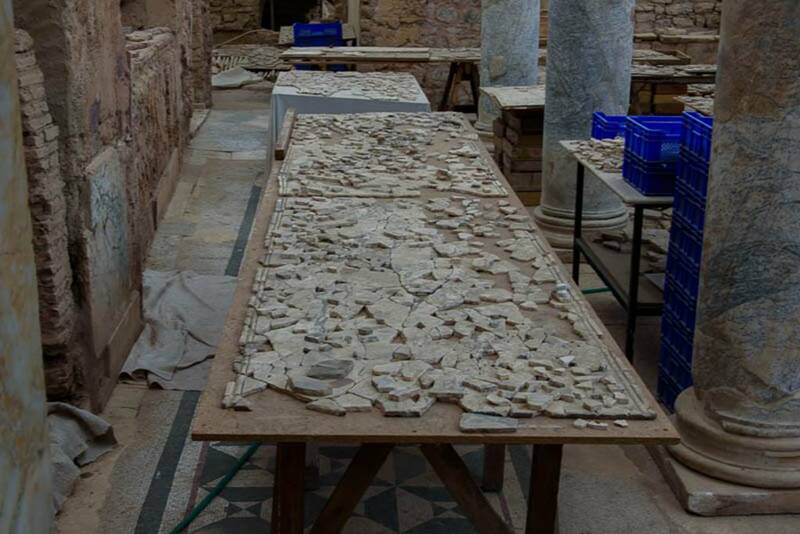 Only about 20% of the city has been recovered during excavations over the past 150 years. Another view of the Library. 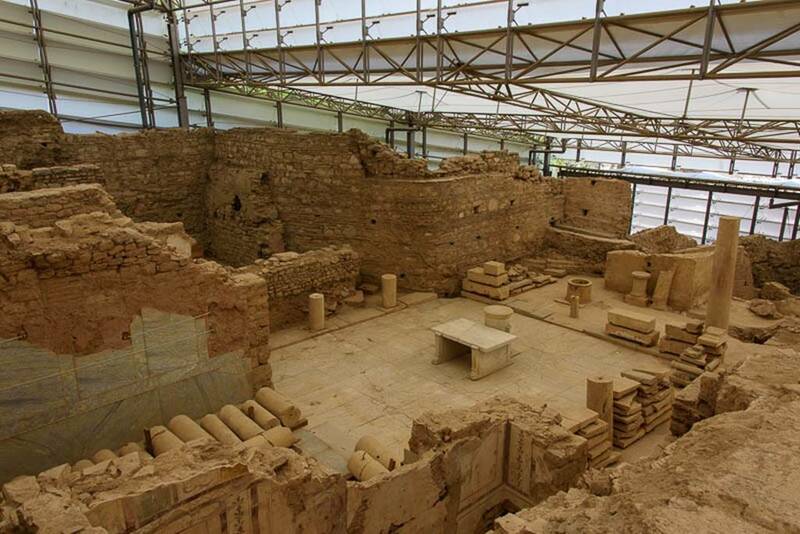 We visited the latest excavations to open, the Terrace Houses. 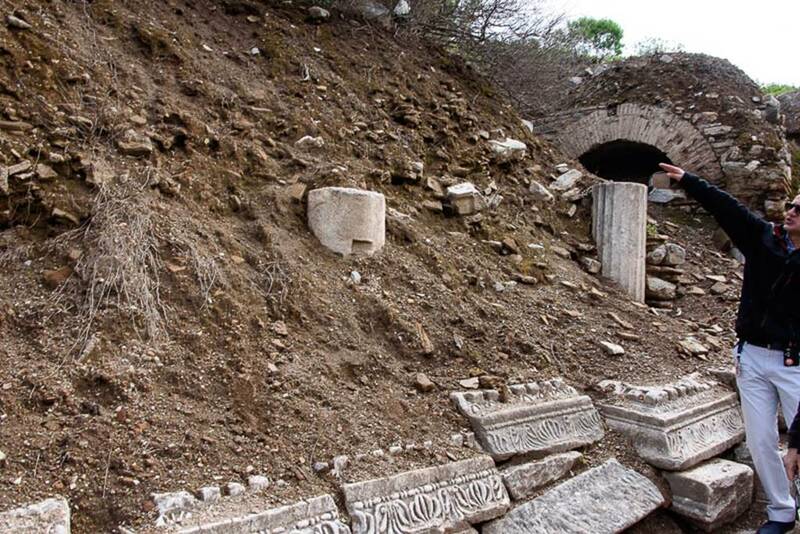 This is the first of the excavations of the hillside where most of the prominent families lived. 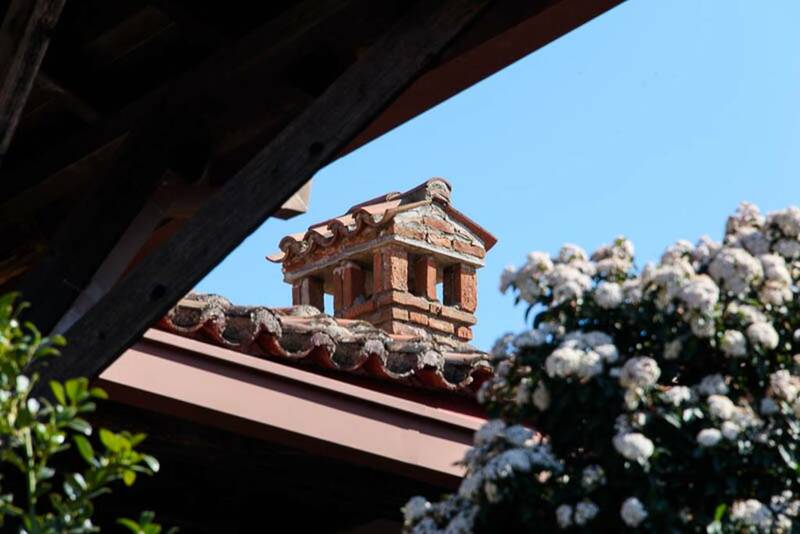 The area is enclosed by a roofed pavilion to protect the delicate mosaics from exposure. 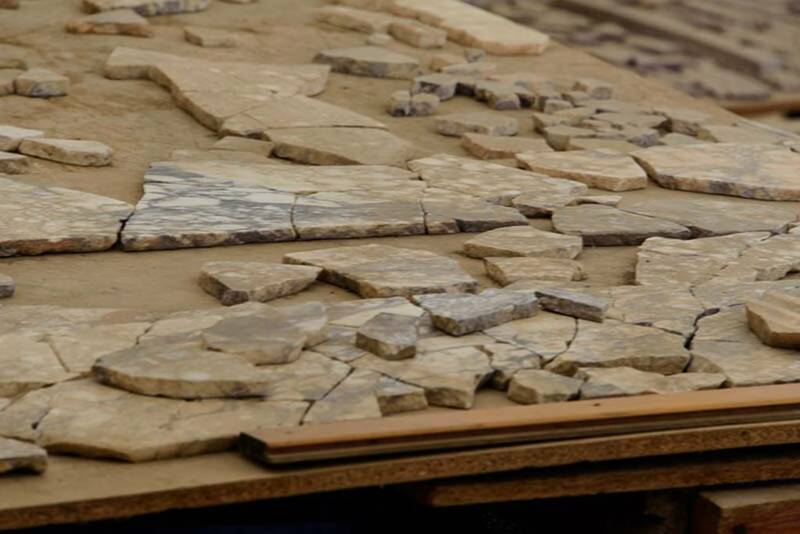 There were dozens of tables where fragments were laid out in an attempt to assemble this huge jigsaw puzzle. The largest house so far uncovered is about 3500 square feet in size. Our guide Oktay Elsever. 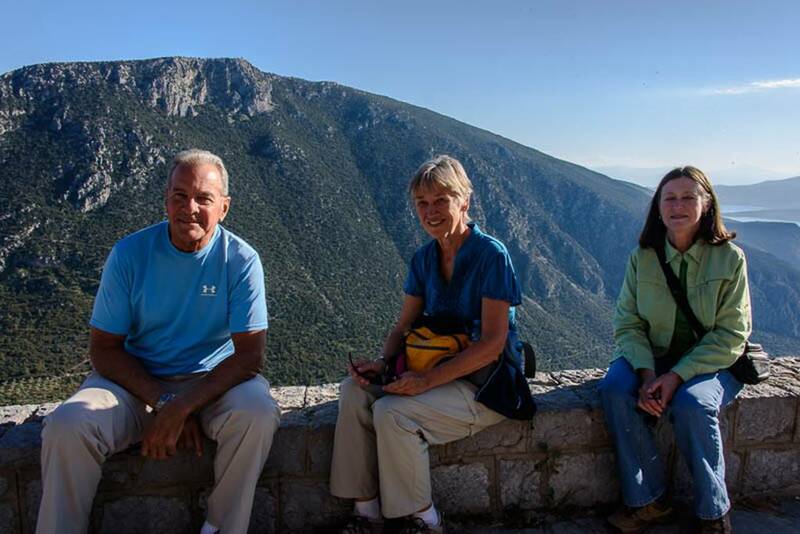 Oktay was one of the best guides we have had on this cruise. 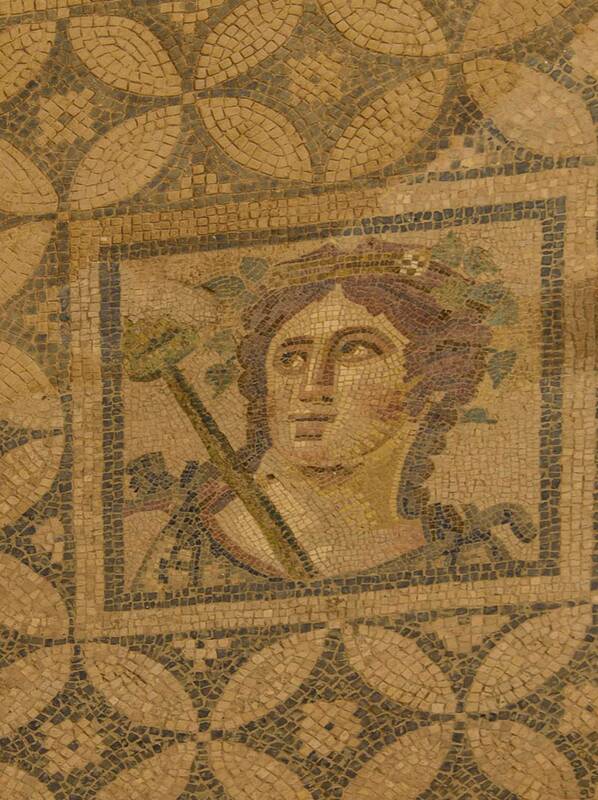 Some of the beautiful mosaics on the floor which date back 2000 years. This one was at the home entrance and was probably 15 feet long. 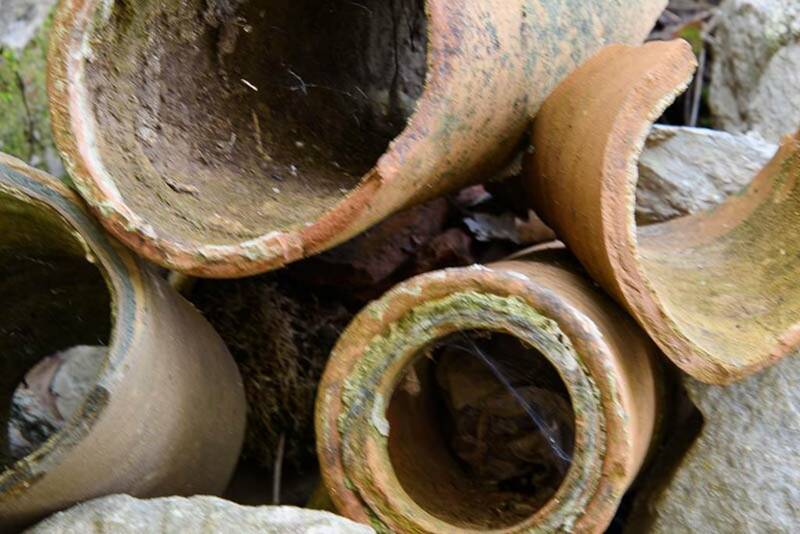 Some of the clay pipes used for the water system. Kay in front of the Library. I know there are a lot of photos of the library, but it was truly incredible. 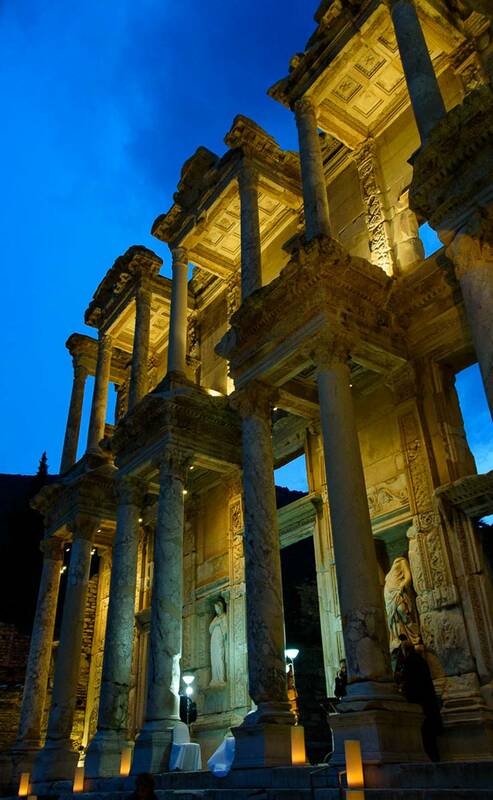 Known as the 3rd largest library in the Ancient World. In the private homes, the masters would have their salve sit on the cold marble to warm it for them! The Grand Theater which seats over 25,000 persons. 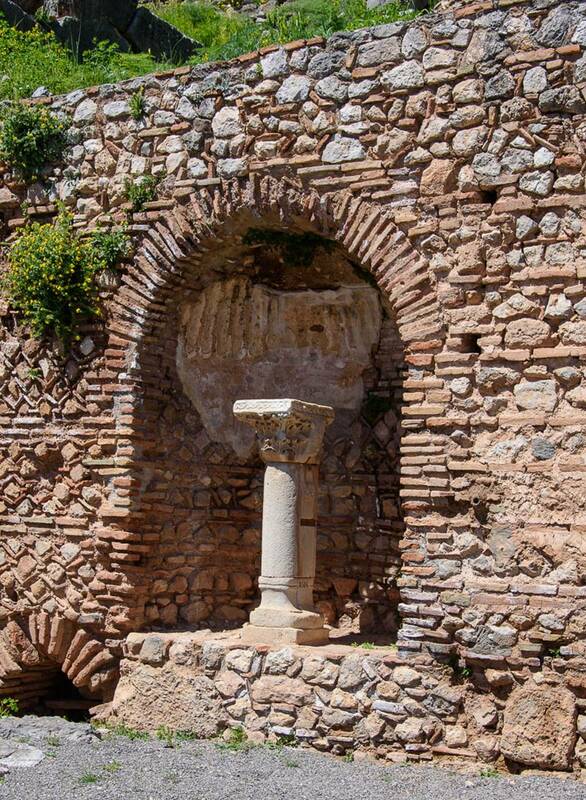 The exact date of construction is unknown, but from a small fountain located in the theater dates from around 100 B.C. 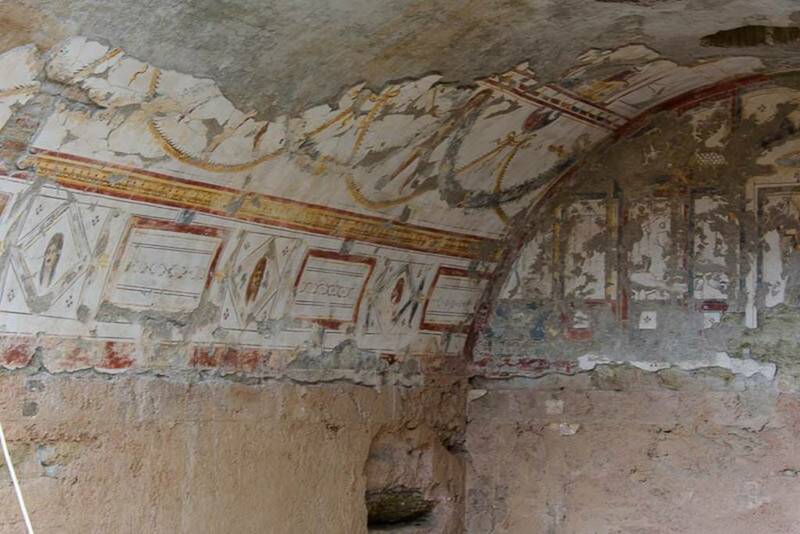 A decorated stage was added between 87 and 92 A.D. There are three sections with different slopes to accommodate the most people and afford good sound. There are inscriptions on the different levels which indicated where specific groups were to sit. As we left the site, there were many vendors. 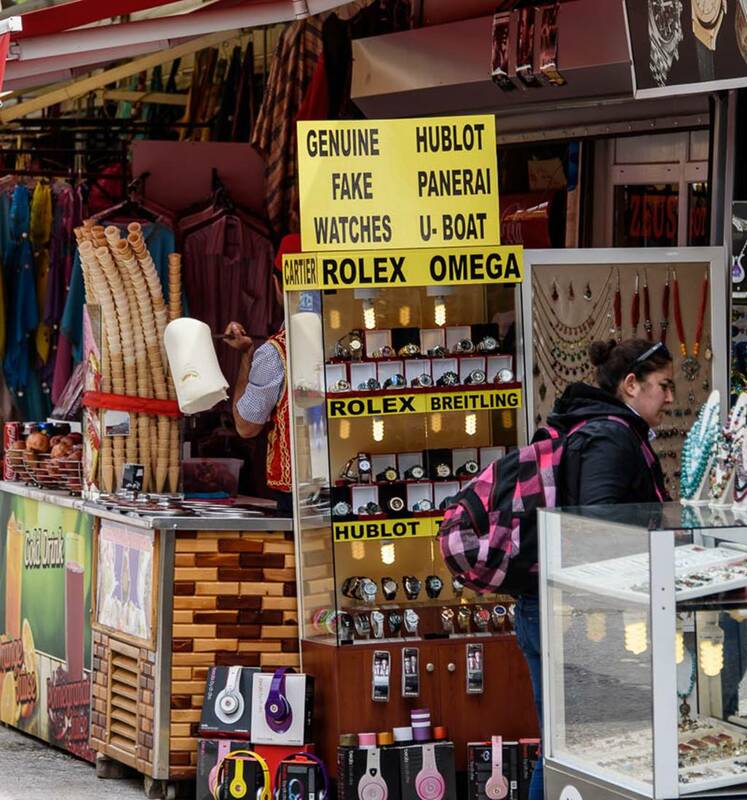 Even those who sold “Genuine Fake” watches. 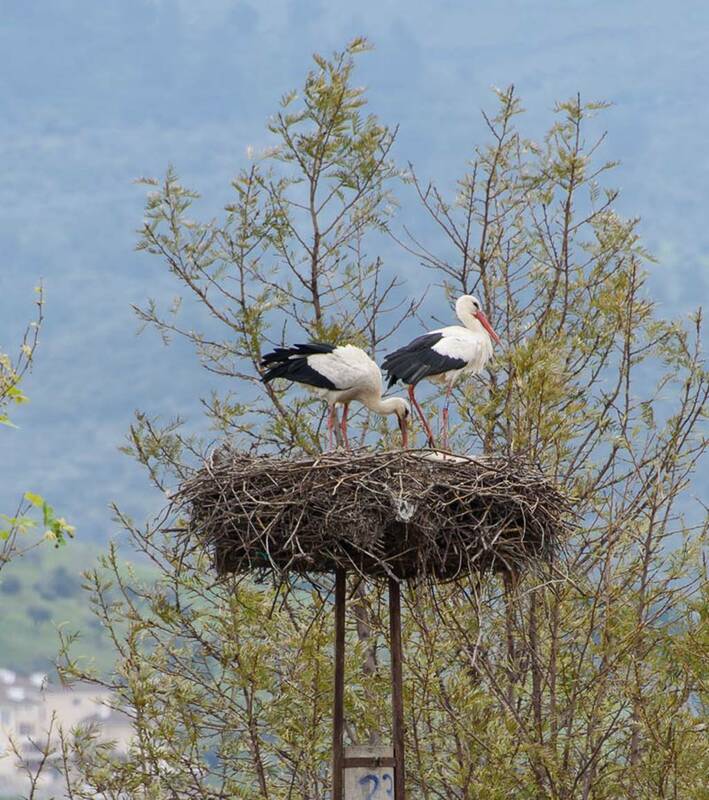 There were a lot of storks in the area. The city provides nesting supports atop the power poles. 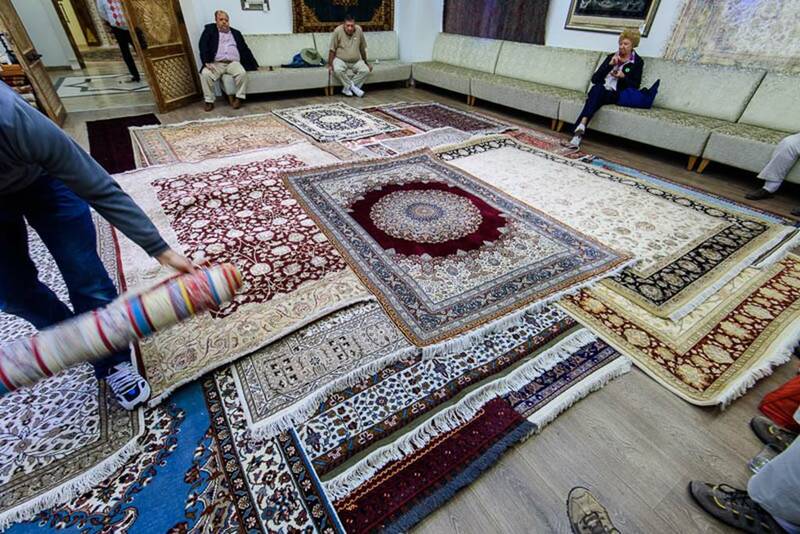 We stopped by the mandatory Turkish rug sales room. Seeing how the rugs are handmade in what is basically a cottage industry was fascinating. Some of the silk rugs were beautiful but expensive! 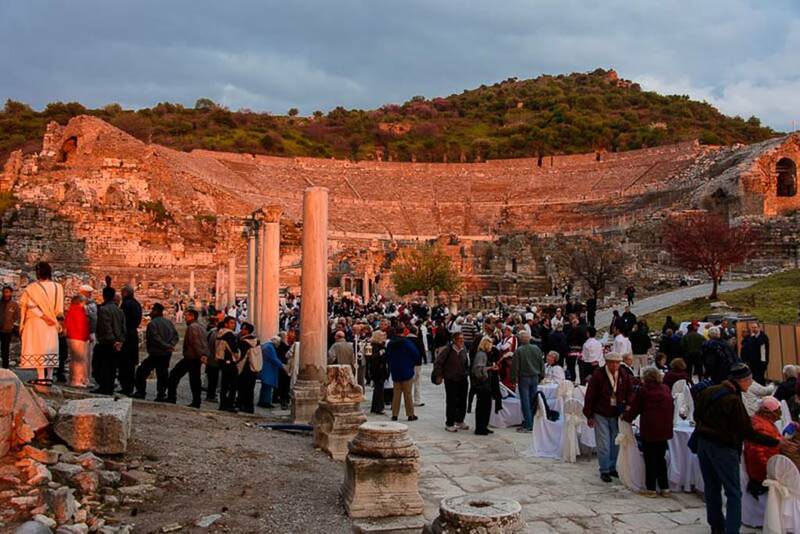 We make it back home around 3:00 PM and have to be ready to travel back to Ephesus at 6:00 PM for our corporate sponsored party and concert in the Great Theater. 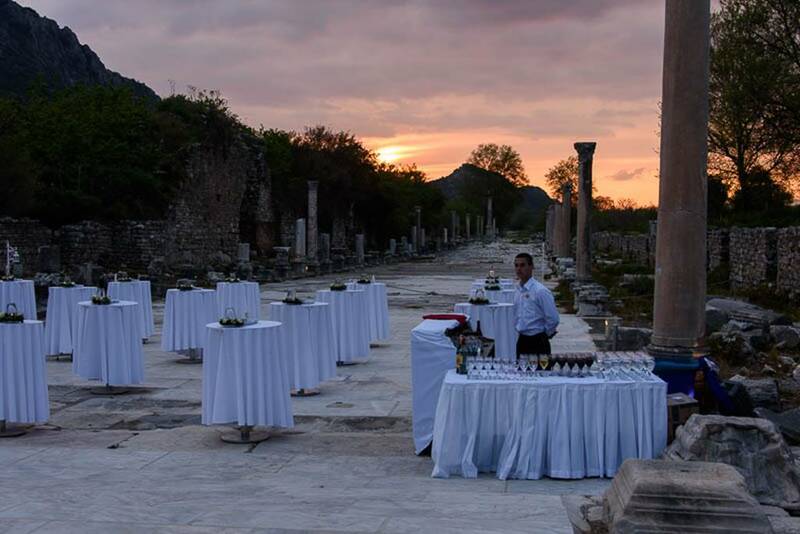 In just a few hours the site had been transformed into a beautiful party venue. This is only a fraction of the hundred tables set up along the old Harbor Road. Sunset on the theater was beautiful. 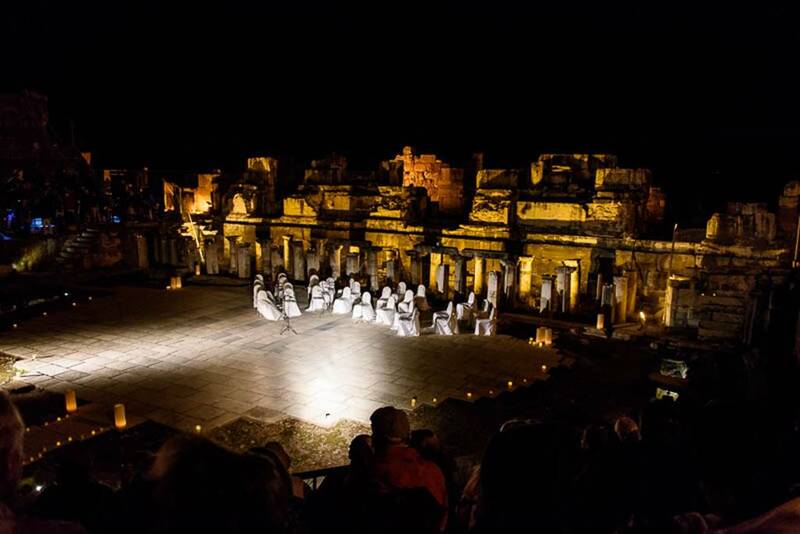 To see the ruins at night was truly special. 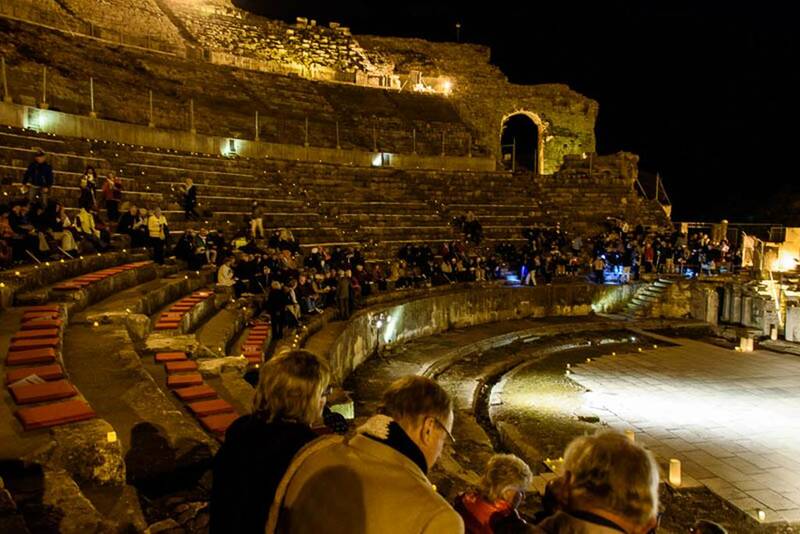 We learned that we were the first group to actually use the Great Theater for a concert in the past 10 years. 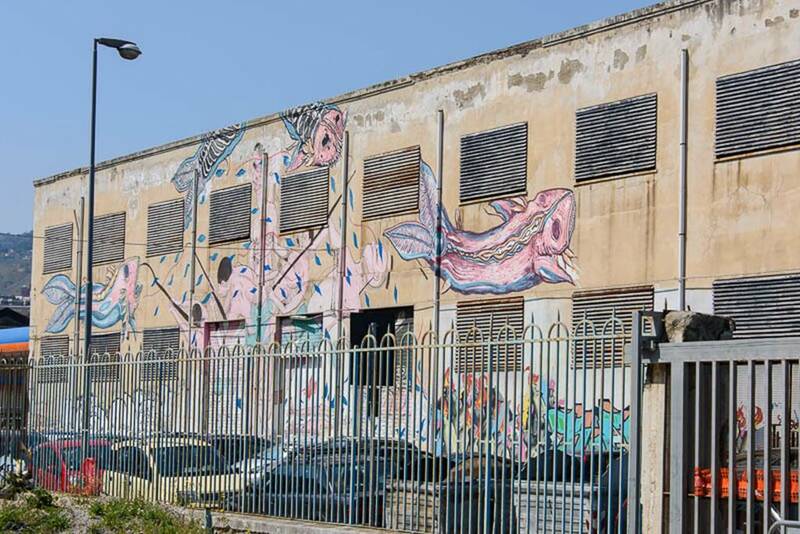 Previously it was a venue for many famous performers including Sir Elton John and even Sting. 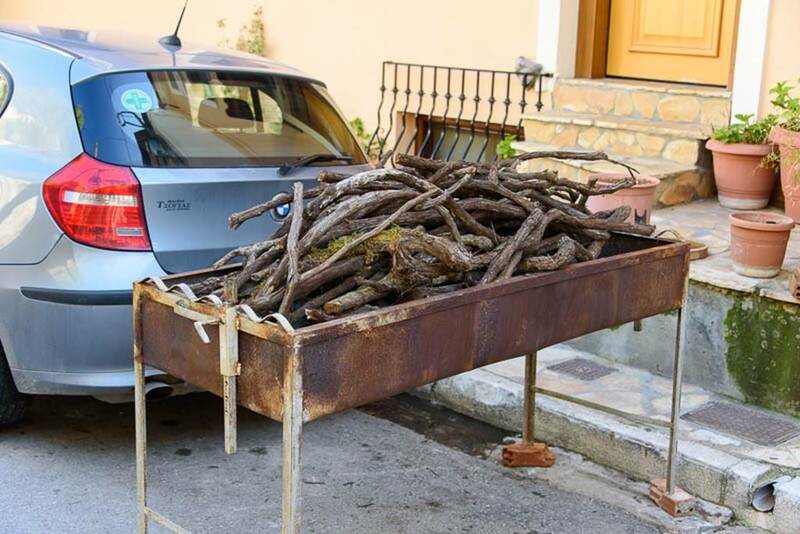 The authorities became concerned about possible damage caused by the amplified music. 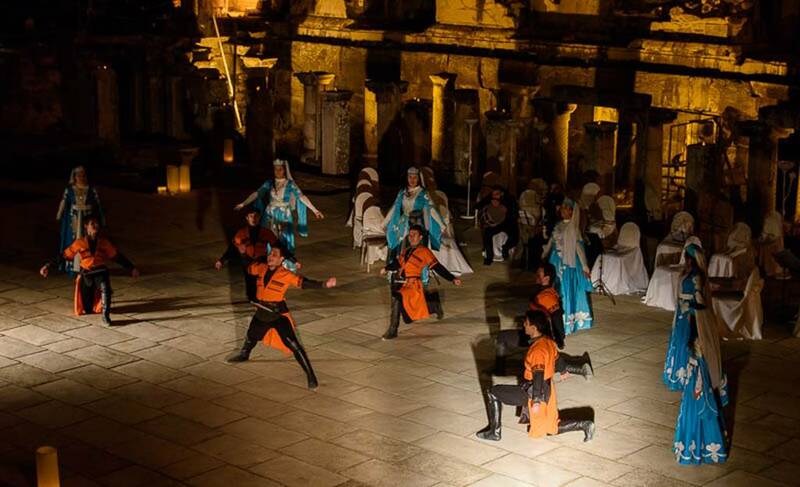 We had a performance of a traditional dance group. 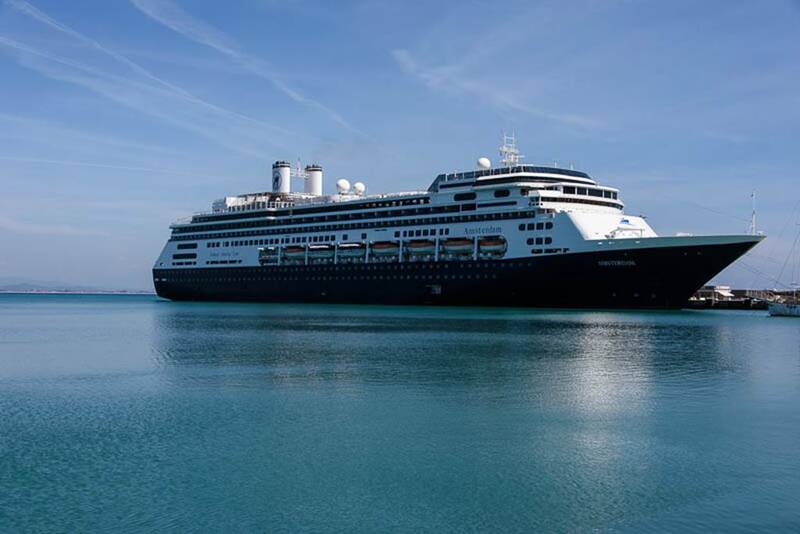 Then a few words from Holland America Lines, CEO Stein Kruse and President Orlando Ashford. 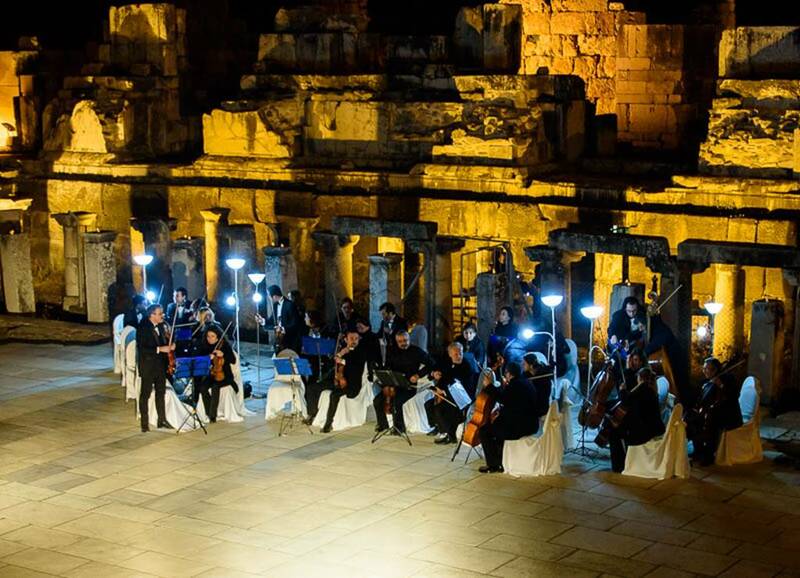 This was followed by a concert performed by the Aegean Chamber Orchestra. I must say that I truly enjoyed my day in Turkey. The western coast is beautiful, the people are warm, friendly and welcoming. 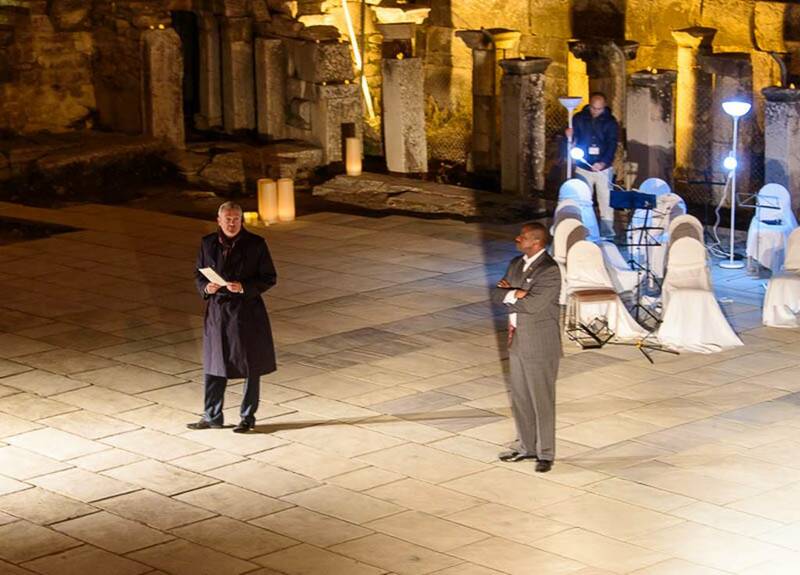 The visit to Ephesus was incredible and to be able to finish it off with a concert in the ancient Grand Theater where so many famous people have orated over 2000 years ago was really something special. 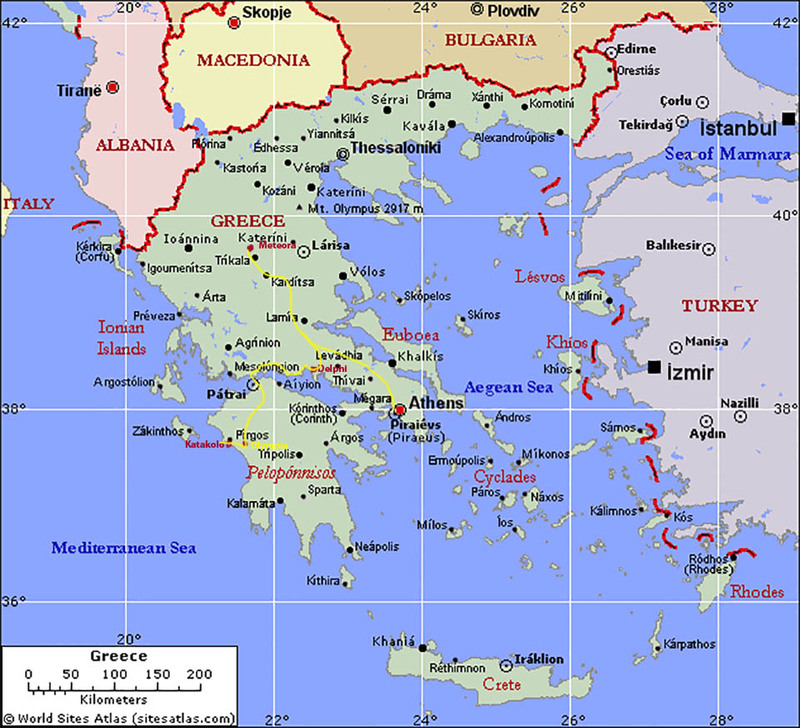 We rest tomorrow on Day 94 as we sail to Piraeus, Greece, the port city of Athens. 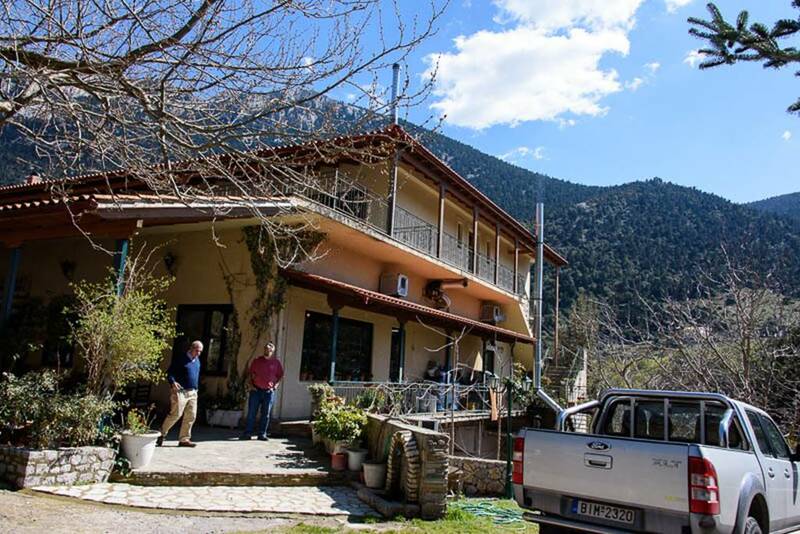 Here we will be debarking for a three day overland journey and rejoining the Amsterdam in Katakolon, Greece on Sunday the 12th. I am not sure when my next post will be. Today is Easter Monday of Passover week in Israel. We were out early again for an 8:00 AM tour which lasted 10 hours. 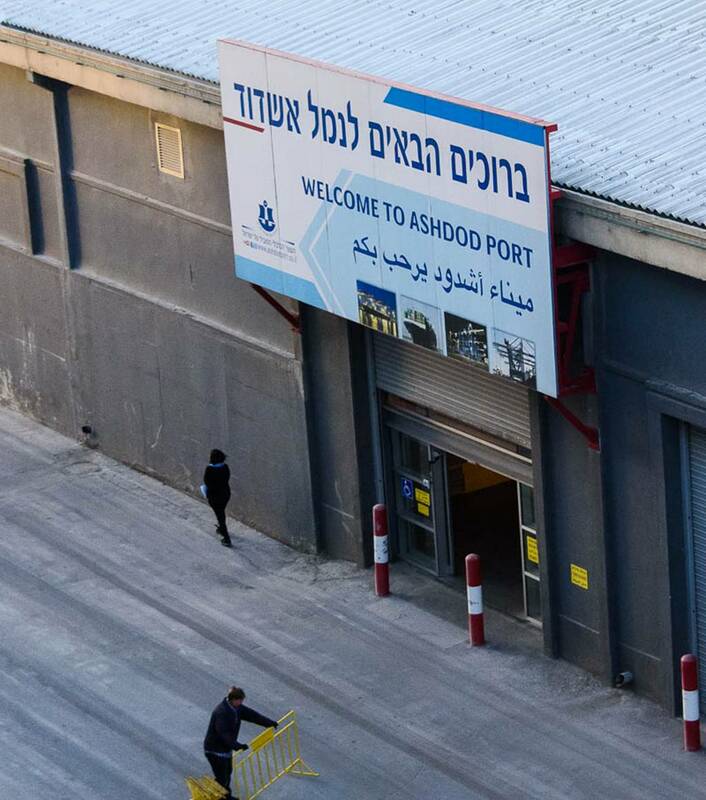 Since we have already gone through face to face with immigrations in Ashdod, the procedure was much easier and quicker in our second port of Israel. Our tour today was quite ambitious, and I am glad to say went much smoother than yesterday’s fiasco. 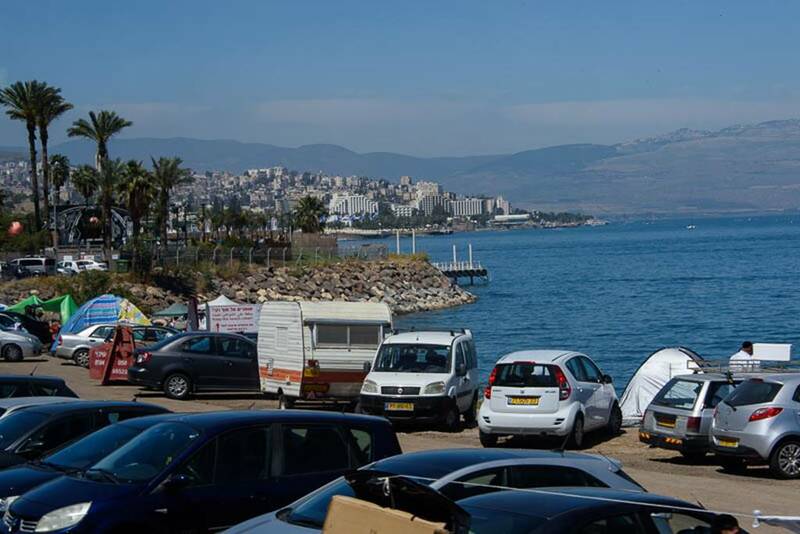 We departed the pier at Haifa for a one hour drive through the Jazre’el Valley to Nazareth, the childhood home of Jesus and the City of the Annunciation. 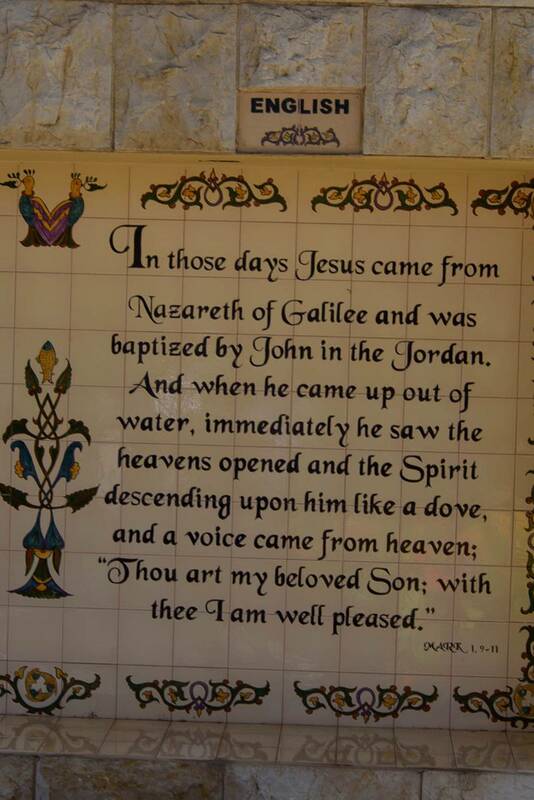 Nazareth is revered as the spot where the angel Gabriel appeared to Mary, telling her that she would bear the Son of God. 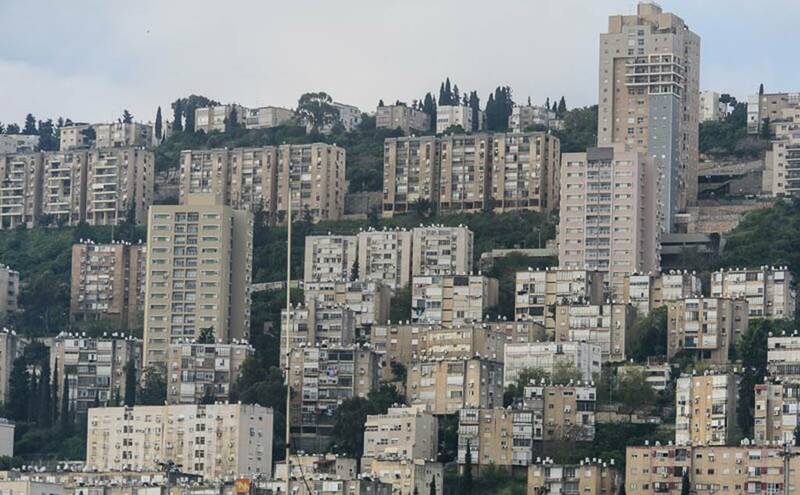 Haifa is a modern Israeli city which is built on the hilly coast. 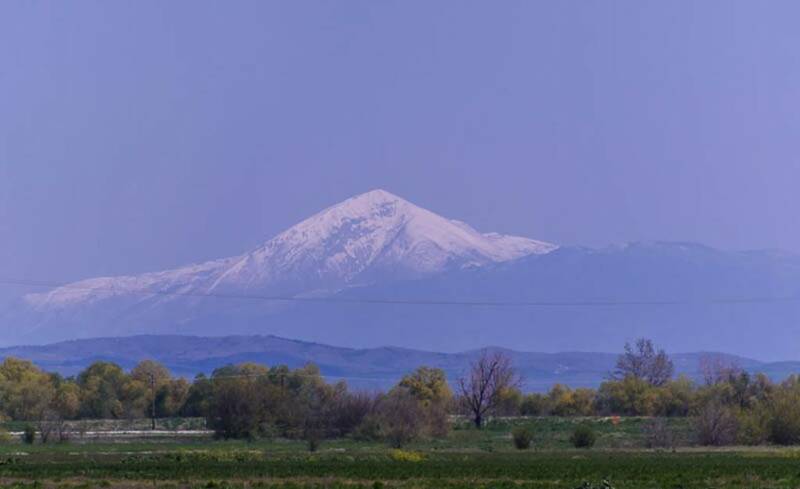 The most prominent of which is Mt. Carmel. Later there is a photo from the top of Mt. Carmel. 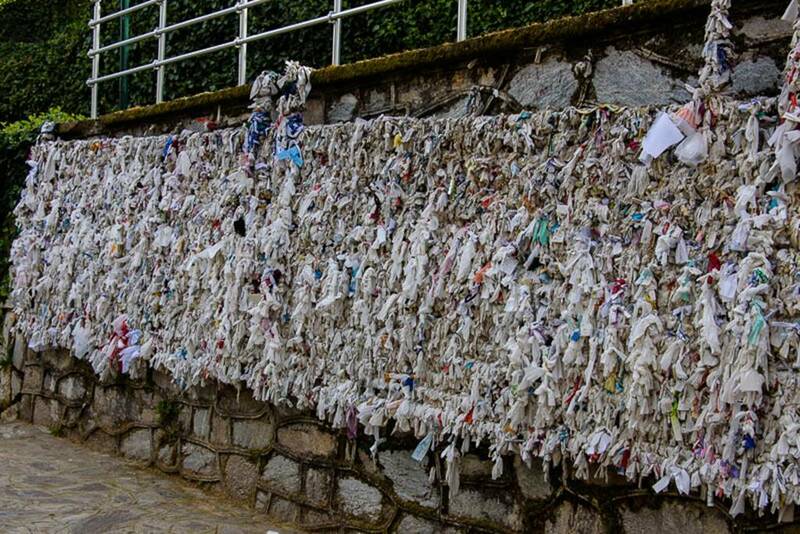 Like every tourist site, religious or not, the city has been commercialized to take advantage of the tourist and pilgrims. 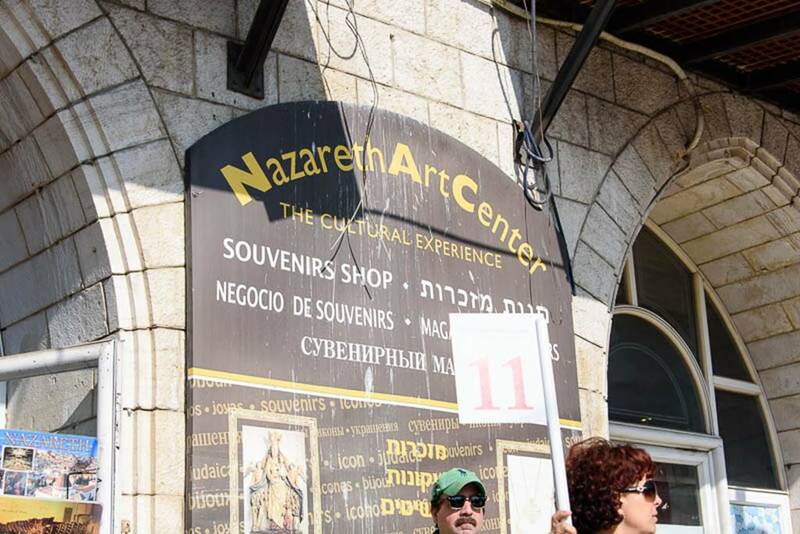 The city of Nazareth is no longer the quite sleepy village it was in Christ day. 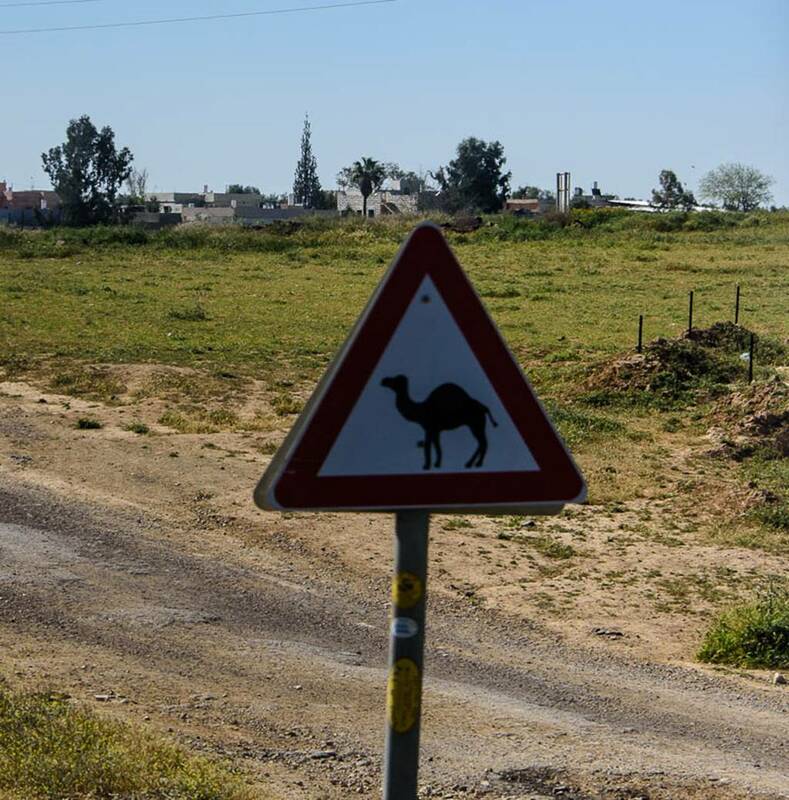 It is not a teeming city which is predominately Muslim as this sign and many similar attest to. 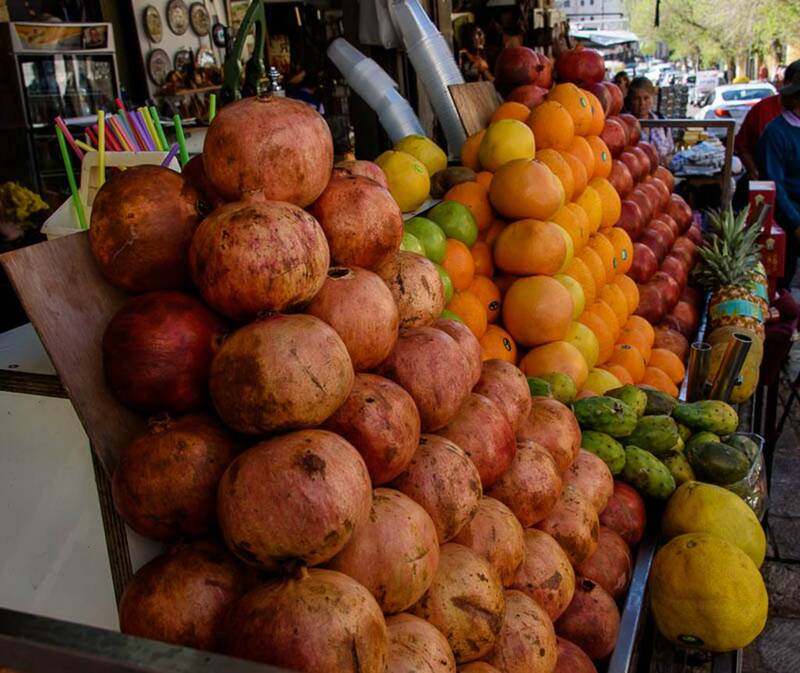 Pomegranates, in the foreground is a major product of this area. 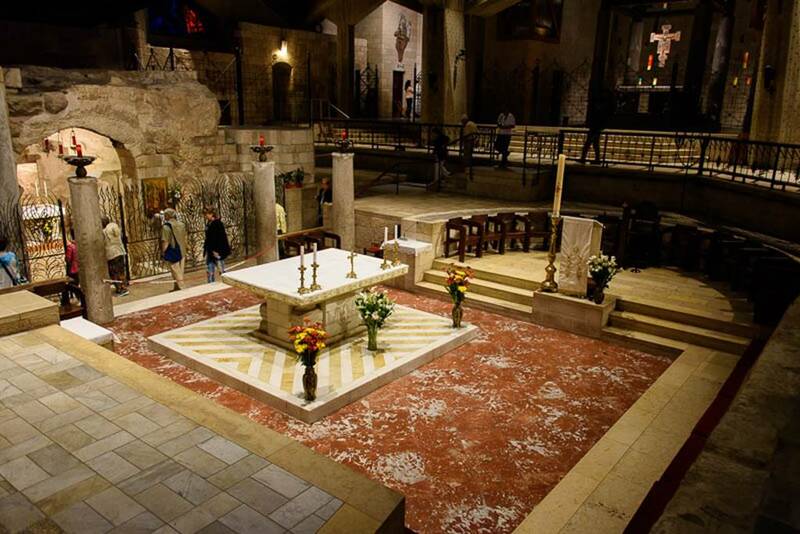 The Church of the Annunciation, built on (over) the site where Mary is said to have lived and where she received Gabriel’s message. Inside the church with what is thought to be Mary’s house in the enclosure to the left. 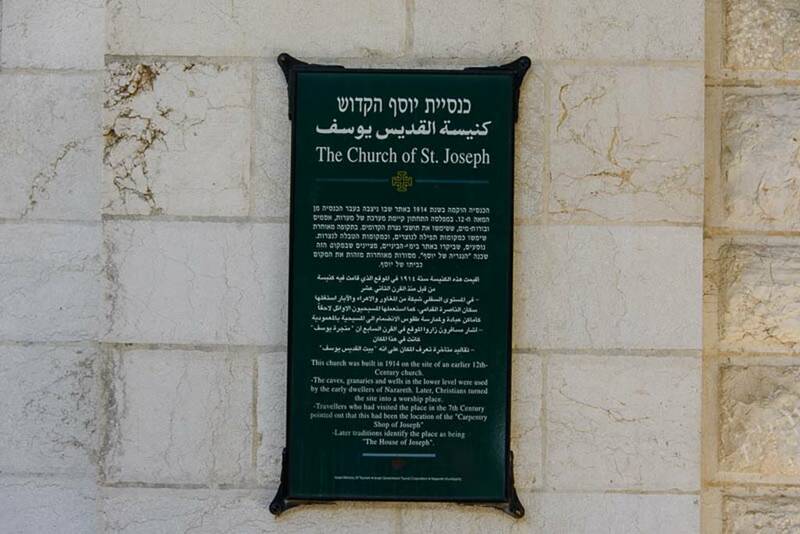 We then visited the Church of St. Joseph. 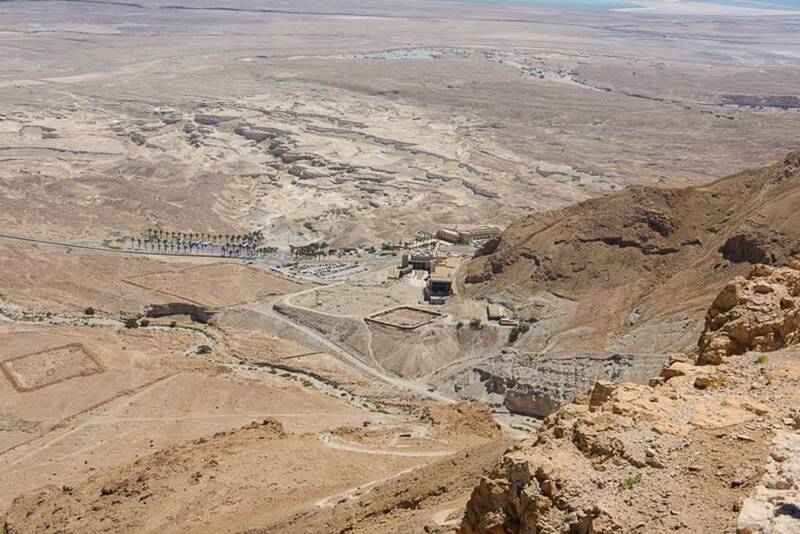 Supposedly the location of the workshop of Joseph. 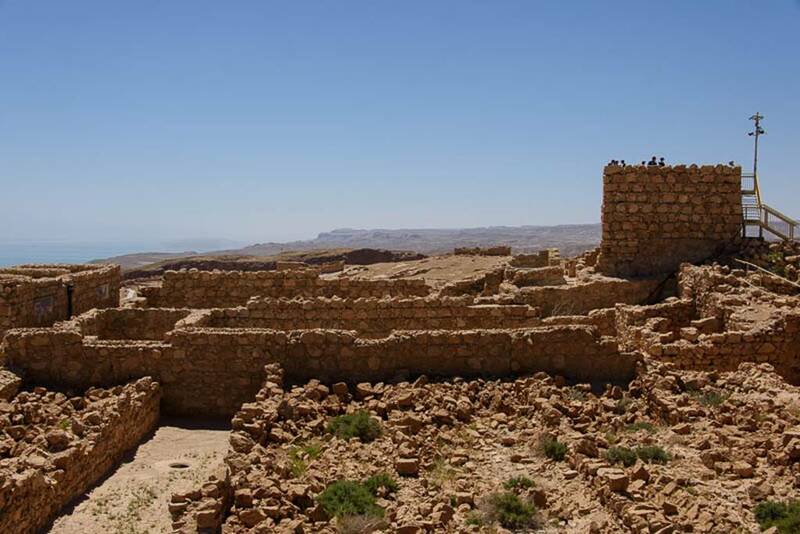 Personally, I have a really difficult time believing that anyone knows the exact location of many of these sacred sites, especially when the place is not “pointed out” until 700 years after the birth of Christ. 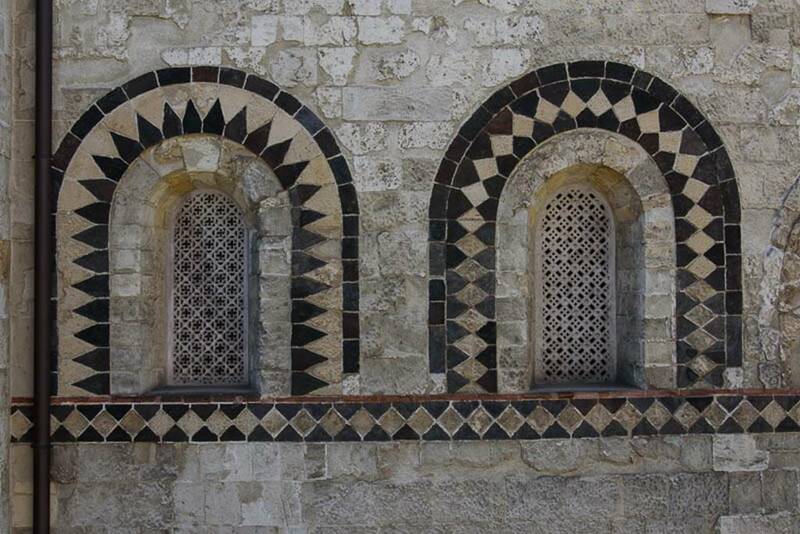 I have no doubt of that this is in the old part of the old city of Nazareth and it “could be” the exact location, but so could a number of other spots. I know I am a cynic, but it goes back to the “if you build it, people will come”. On the other hand, it really doesn’t take away from the wonderful experience of being around the location that these great saints lived. 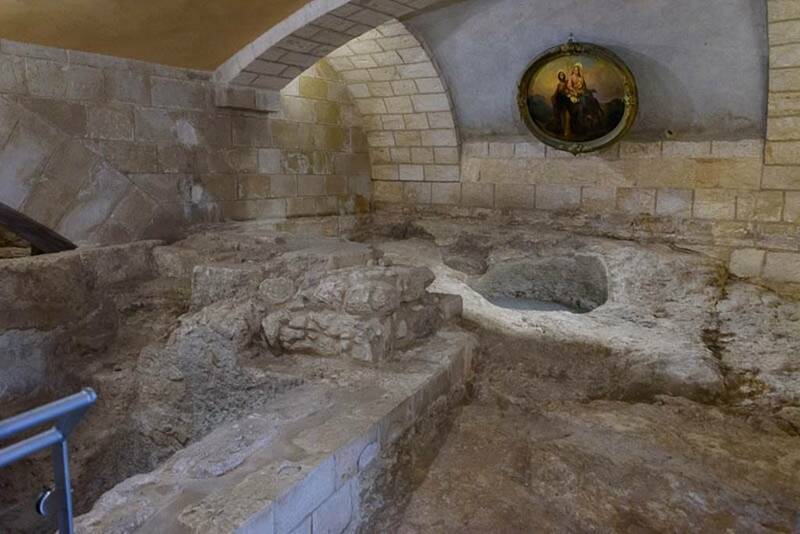 The bath house located under the Church of St. Joseph. 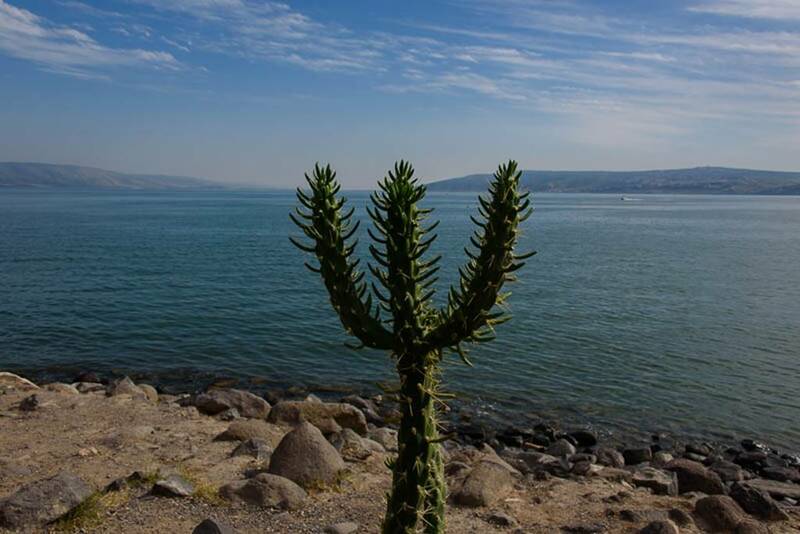 Our first glimpse of the Sea of Galilee. 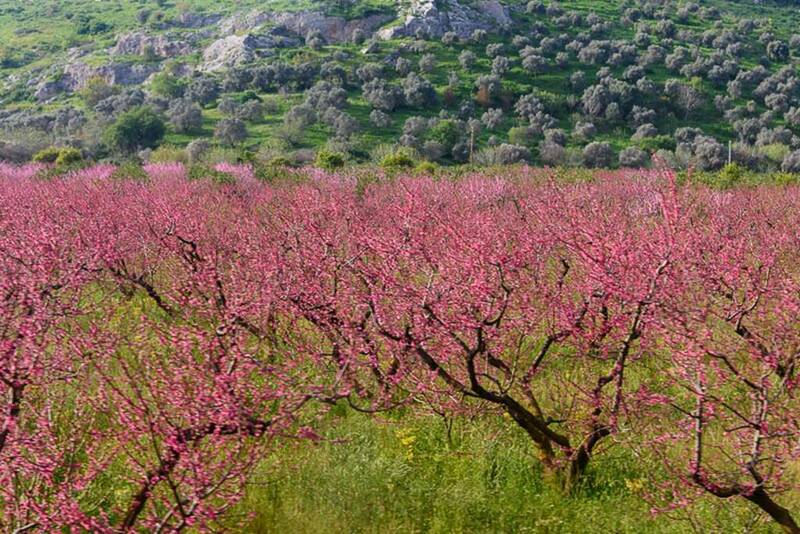 One of the hundreds of fertile orchards around this area. Many are operated by a Kinnerets, the particular Israeli communal farms. 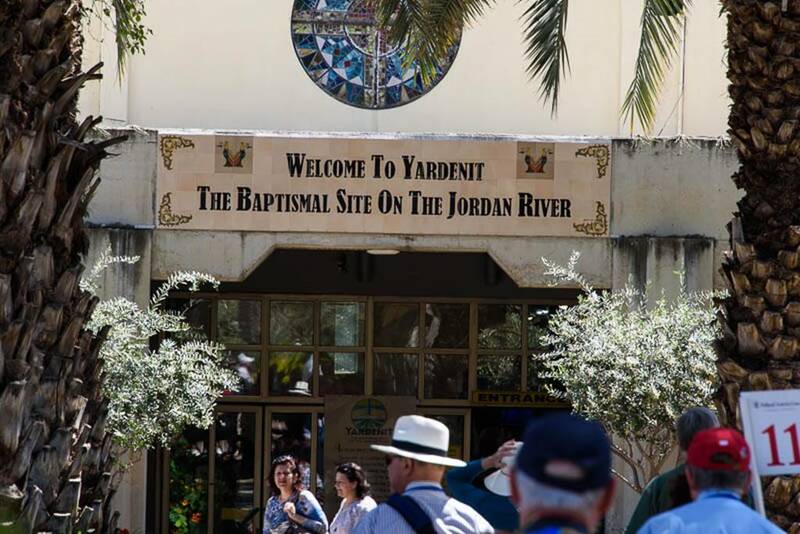 We then visited a baptismal site on the Jordan River operated by a Kinneret. 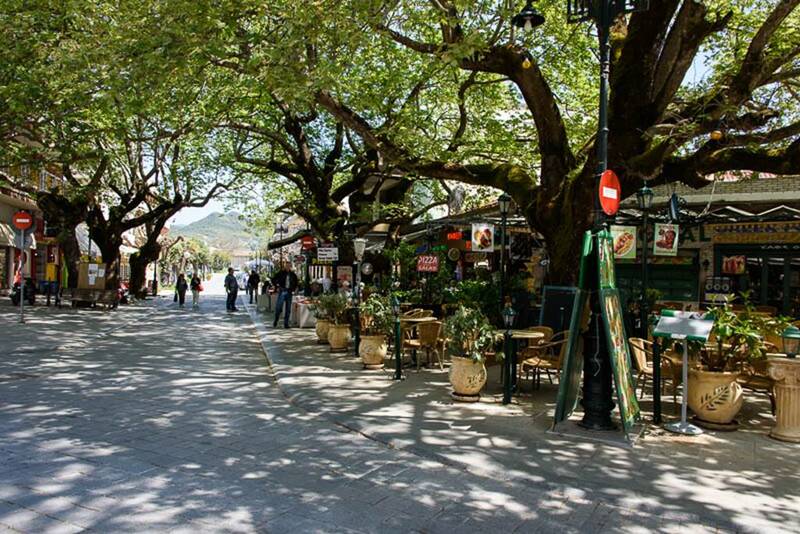 It was a very commercial establishment, but it was a lovely area along the Jordan. 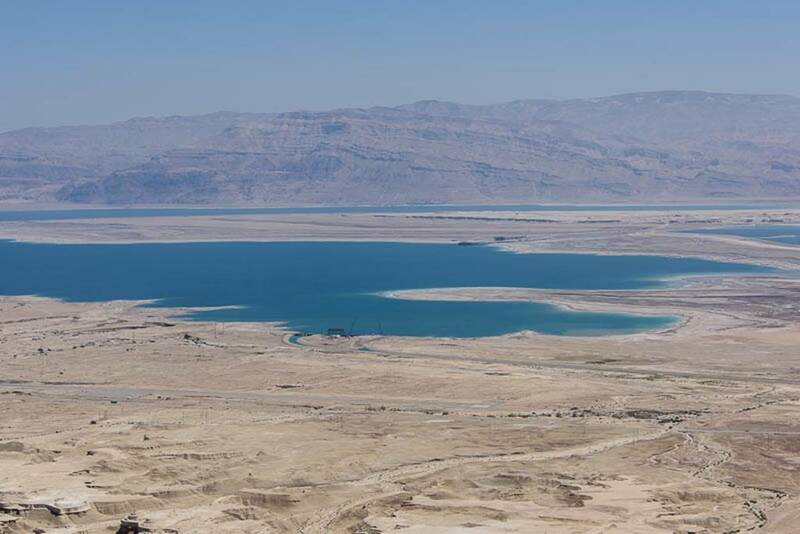 The Jordan’s flow is now controlled by a dam on the Sea of Galilee. As a result it is a small meandering stream. I would almost hesitate to call it a river. This is of course Easter Monday and a holiday. 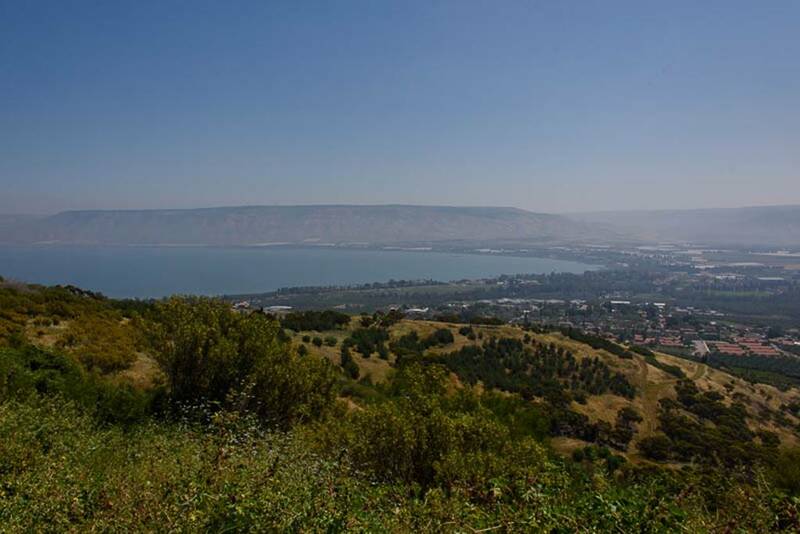 As a result the coast of the Sea of Galilee was covered by people on holiday. In camping areas almost every square foot of space was covered. 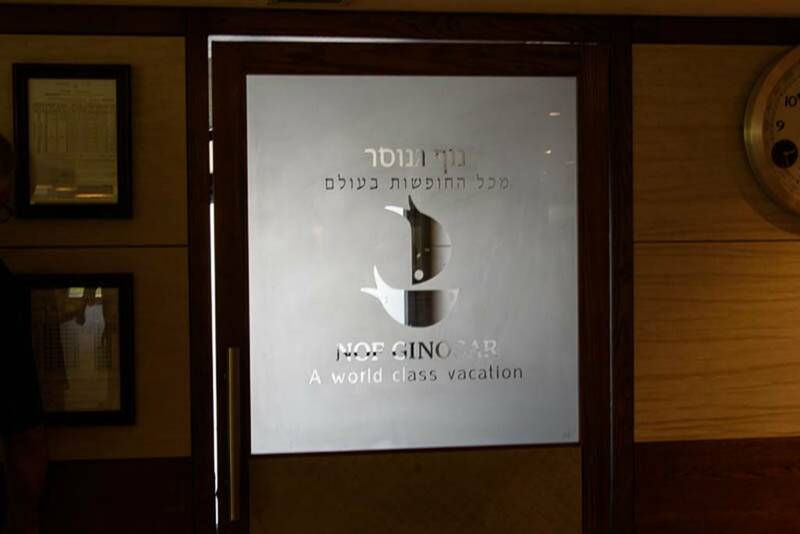 We had lunch at a Kinneret, the Nof Ginosar, a vacation resort. The food was excellent, but as was the case yesterday the wine was terrible (although it was unlimited). This sign was located over a urinal in the men’s bathroom. 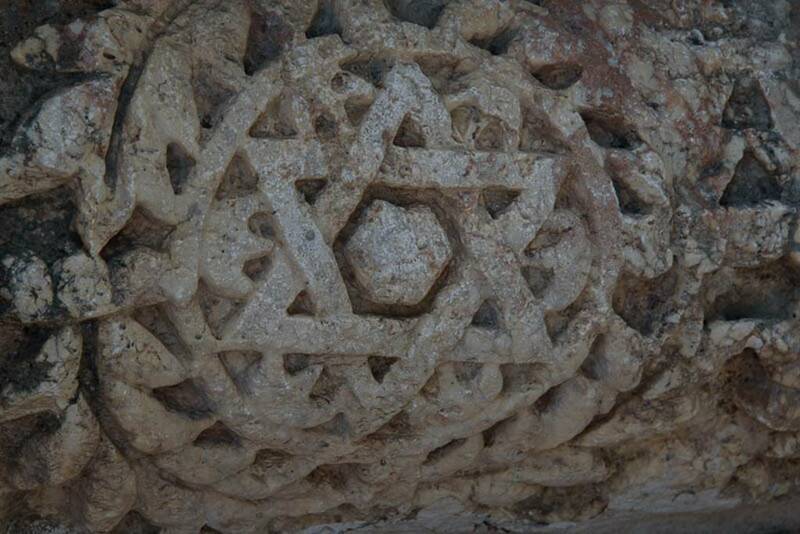 I had to ask our guide for an explanation and she couldn’t even interpret the meaning until she read the Hebrew. 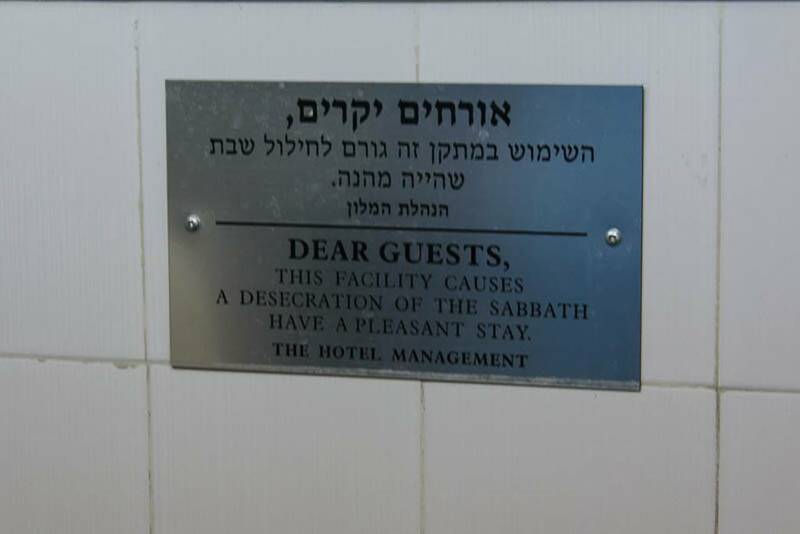 Basically, it means that if you are a strict observer of the Sabbath, the use of this facility would be improper because the flush mechanism is automatic (detected by a photocell) and would thus violate the Sabbath because it would be using electricity. 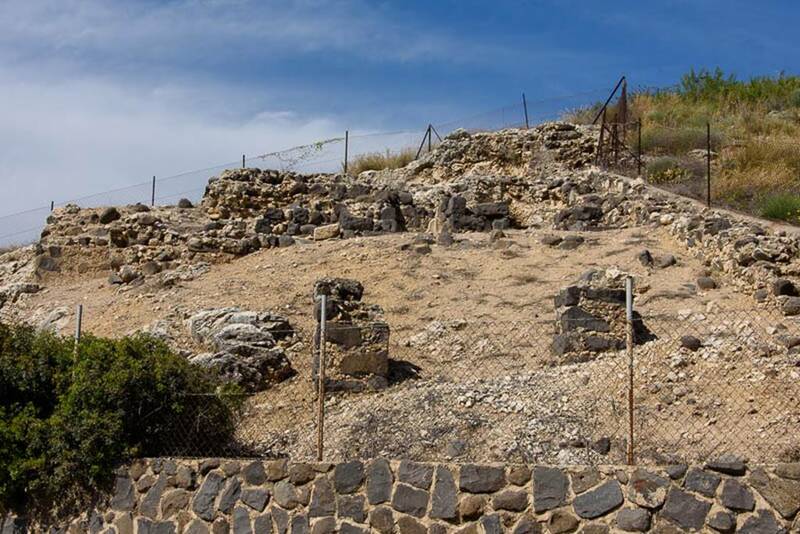 After lunch we proceeded along the western side of the Sea of Galilee, passing the village of Cana where Jesus performed his first miracle, turning water into wine at a wedding. 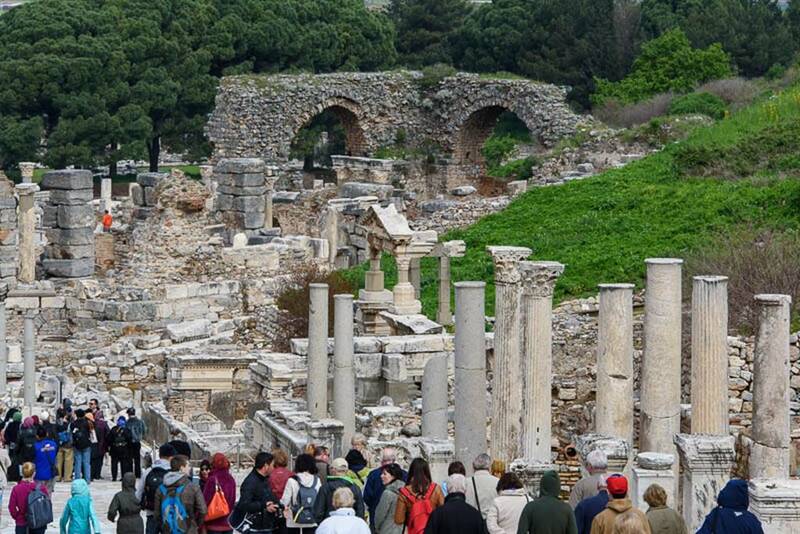 From there we trailed on to Tabgha to visit the church of Peter’s Primacy by the lake and Capernaum, St. Peter’s village. 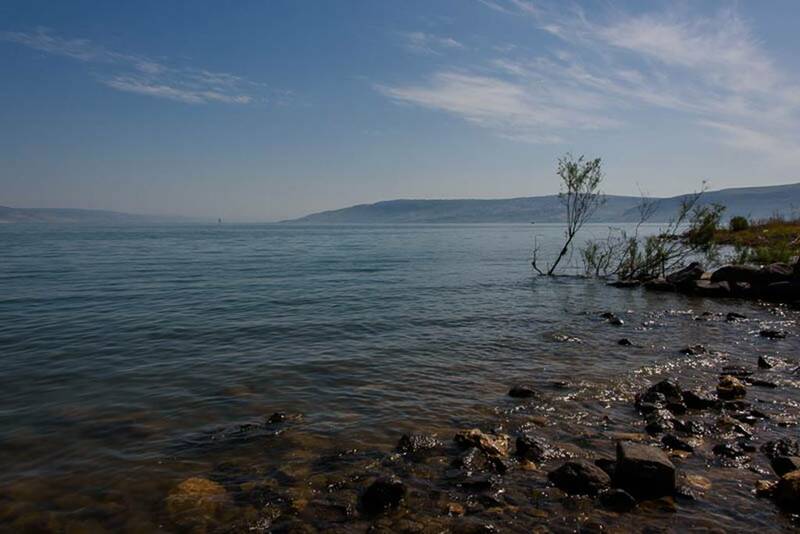 The sea of Galilee as seen from the shore near Capernaum. 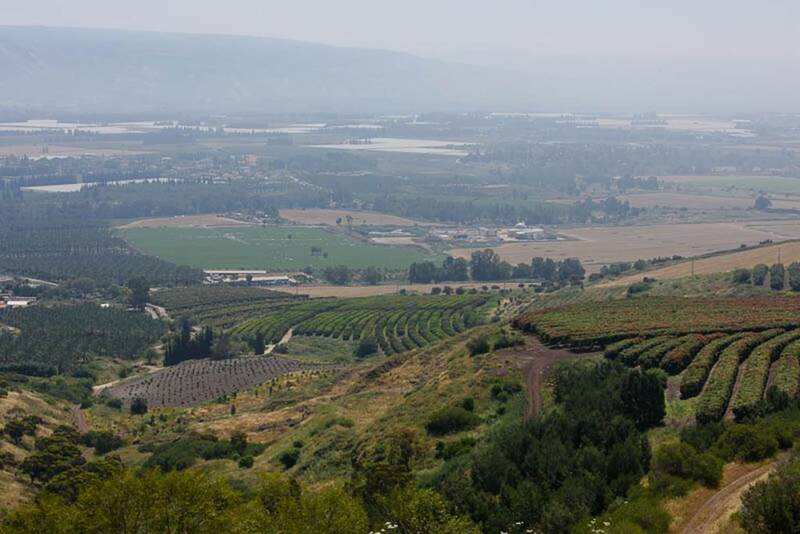 The Golan Heights may be seen in the background on the other side of the Sea. 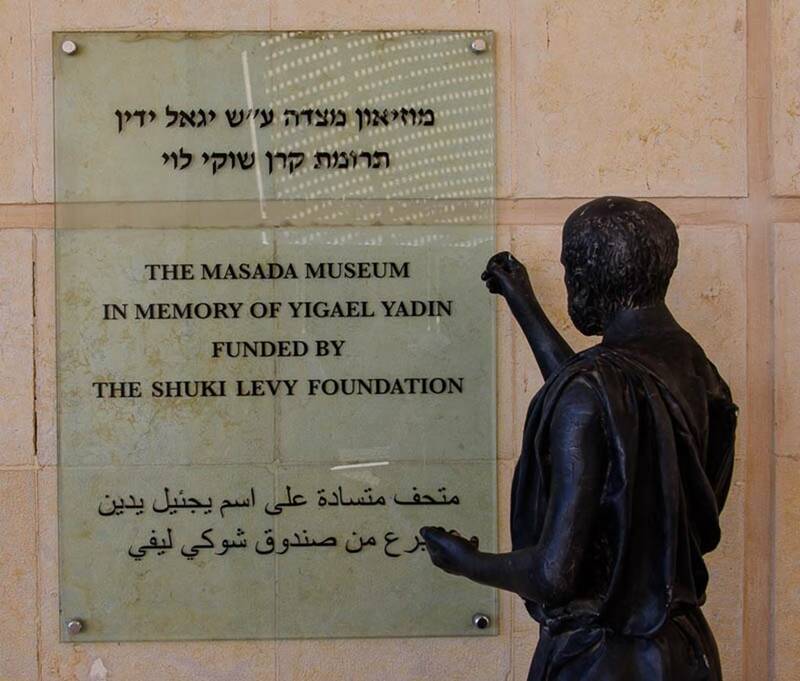 This is the Mount of the Beatitudes, site of the Sermon on the Mount. 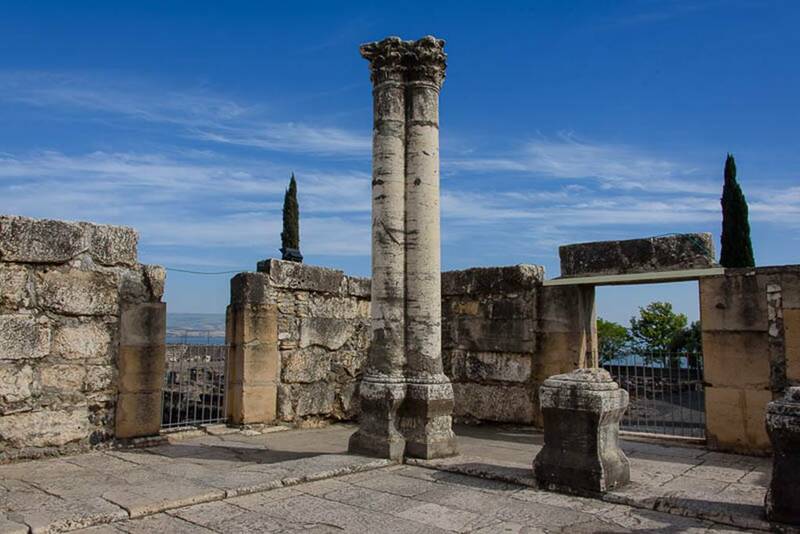 Capernaum is perhaps the most established and historically defined area in the region. 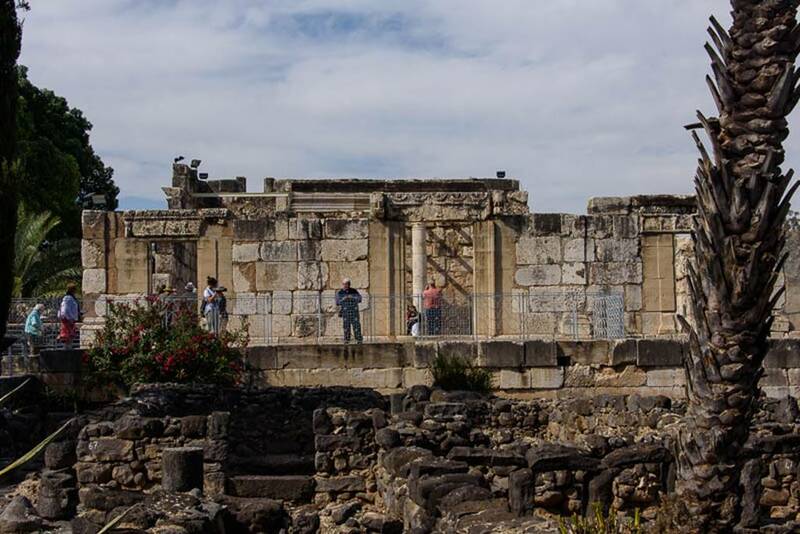 Above is the ancient Synagogue where Jesus taught. St. Peters house (actually St. Peters mother-in-law’s house is located only a few hundred feet away, and is now covered by a 20th century constructed church. 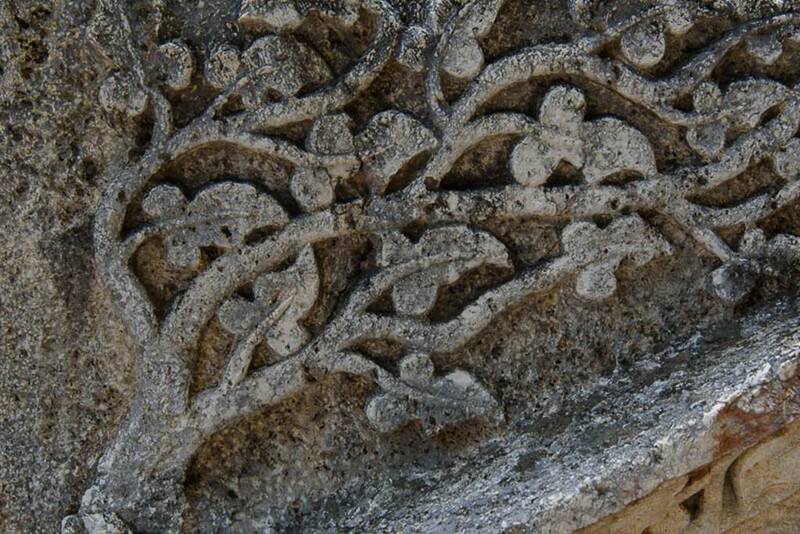 Some of the beautiful stonework. 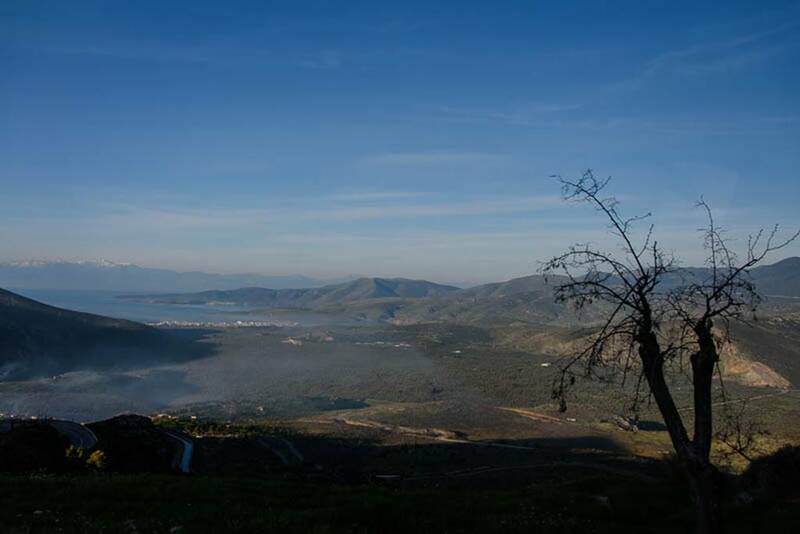 The Sea of Galilee as seen from Capernaum. 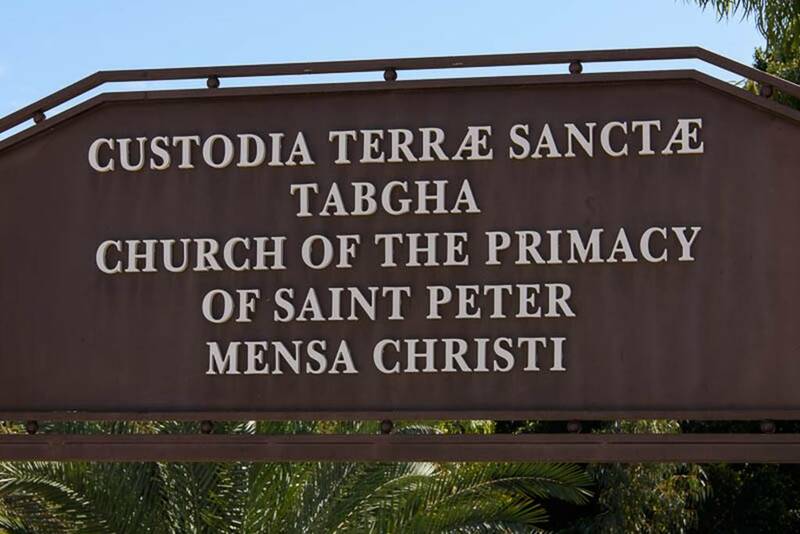 Only a short distance from the Mount of Beatitudes. 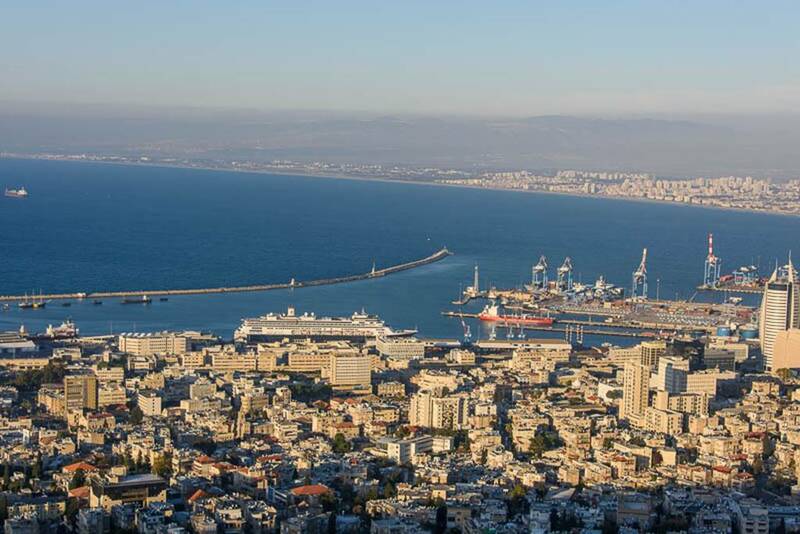 After arriving back in Haifa, we ascended to the top of Mount Carmel which gives a grand view of the city and the harbor. It was a long day, the tour lasted about 10 ½ hours, but was really enjoyable. Day 92 is a recovery day at sea. Holland America CEO, Mr. Stein Krouse, and Holland America Line president, Orlando Ashford joined the ship yesterday in Haifa. Tonight we had a Mariner Appreciation Cocktail Party followed by dinner where we received complimentary wine. 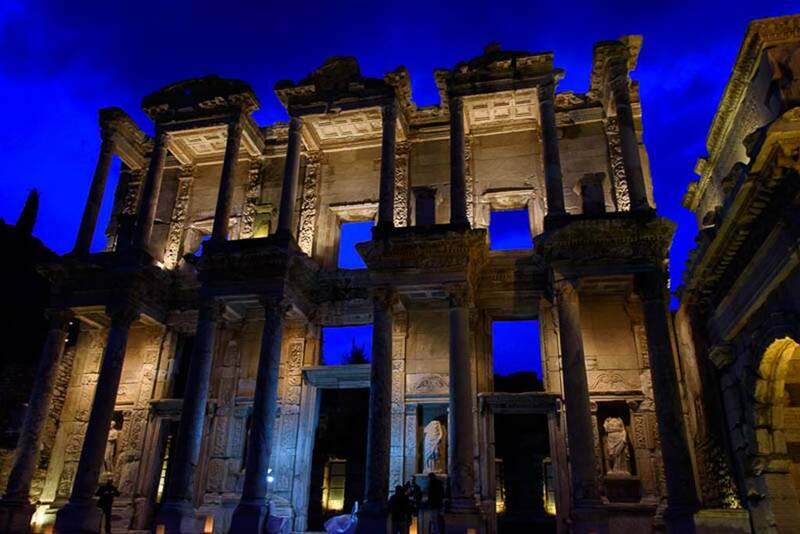 Tomorrow we have an excursion to Ephesus which will last about 7 hours. We will be returning to the ship around 3:30. 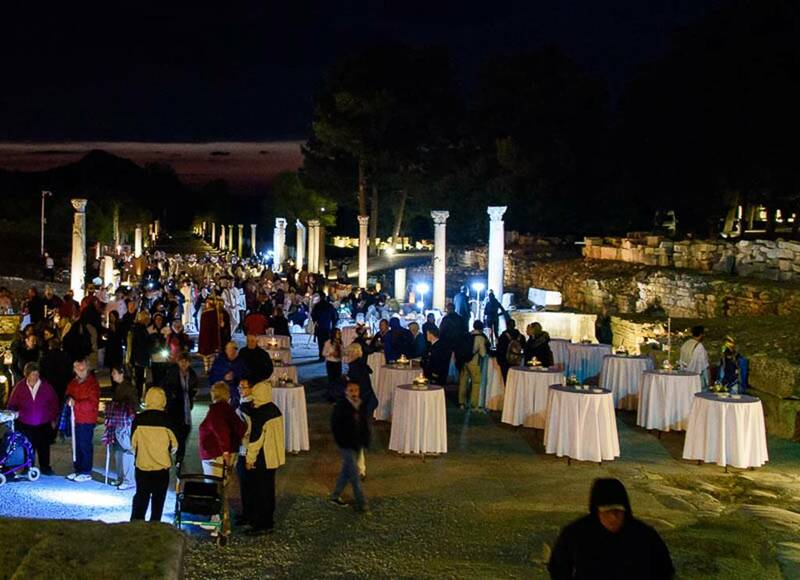 We will then be leaving again for Ephesus around 6:00 PM to attend a concert held at the coliseum at Ephesus featuring the Aegean Chamber Orchestra. This is really exciting to be able to actually attend a concert here since only one or two events are allowed here each year. 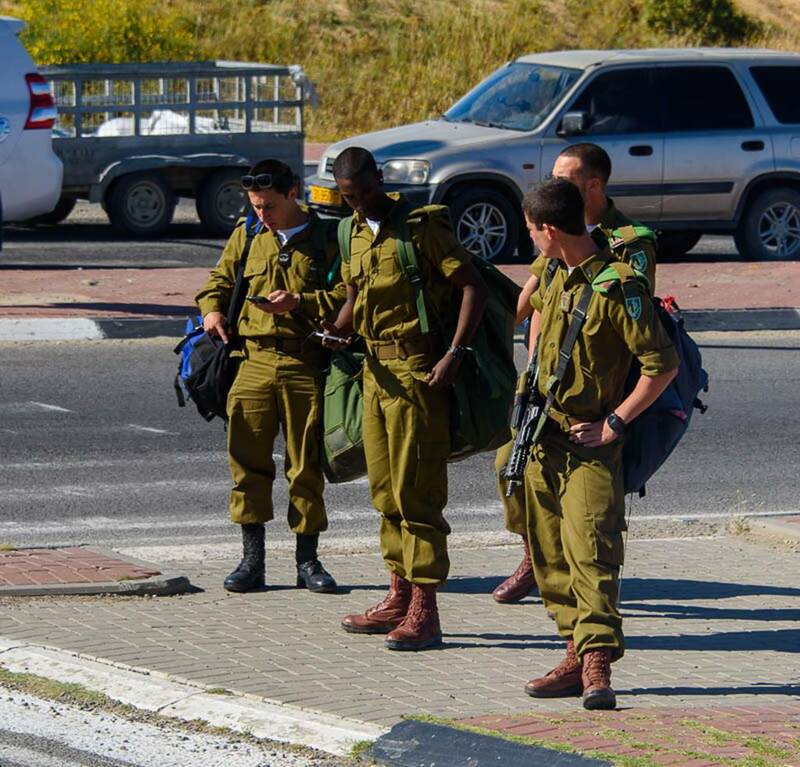 We arrived is Ashdod Port before dawn and the Israeli face to face immigration went smoothly. 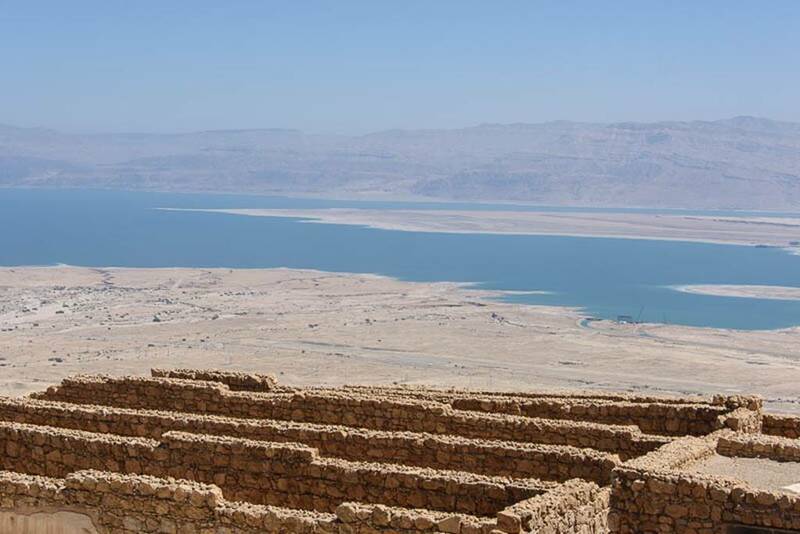 We had a Holland America tour to the famous mountain Fortress Masada on the Dead Sea. We went to our meeting area in the Queen’s Lounge almost 10 minutes BEFORE the indicated time on our tickets only to find that the buses were almost already loaded. Being almost the last passengers on left us with poor seats for the 2.5 hours each way journey. The tour was not getting off to a good start. And so it continued. 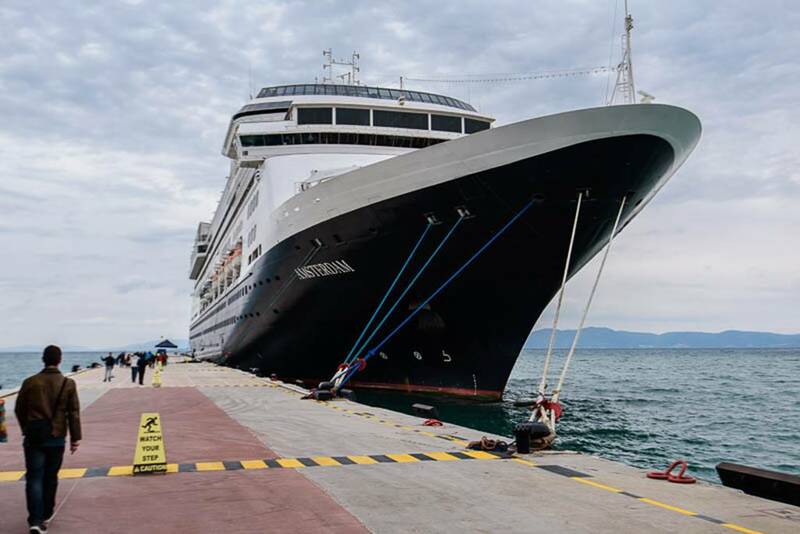 This was absolutely the worst tour I have ever taken, not because the potential wasn’t there but because of poor planning on Holland America’s part and poor leadership by our guide and 40 minute bathroom breaks and the fellow passengers who simply were not physically able to make a trip like this. We wasted at total of at least 2.5 hours WAITING. People were late boarding at every stop. 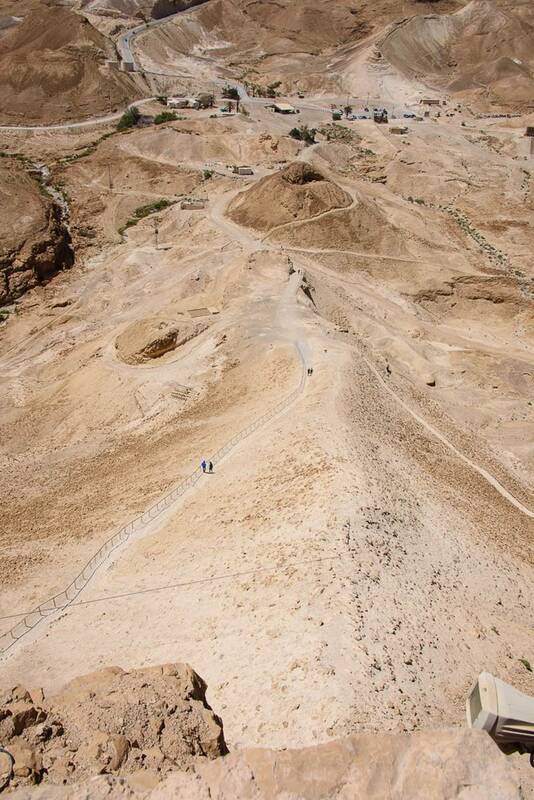 One person left her bag at the top of Masada with her passport, this entailed and extra 30 minute delay of everyone waiting for the guide to find and retrieve the bag. I became so frustrated, I ceased to even take photos during the second half of the tour. 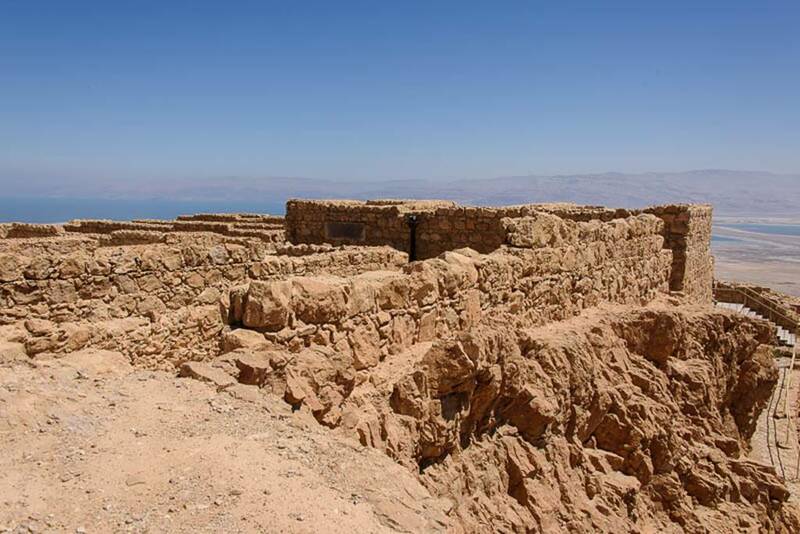 Masada was a very impressive place which unfortunately I was only able to see a small portion because of our tour structure, the slowness of our group and our leader’s unwillingness to allow faster individuals to move at their own pace. If I seem a bit bitter in this post, it is because I am. I hesitated to even post, but I thought I would include a few photos. Unfortunately photos do not do the great fort justice. 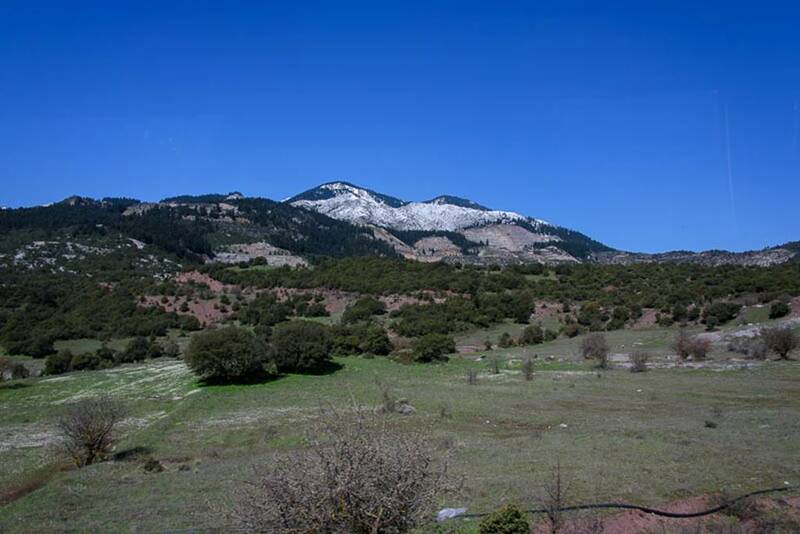 There is just no way to get the feel for the scale of the mountain where this famous battle was fought. 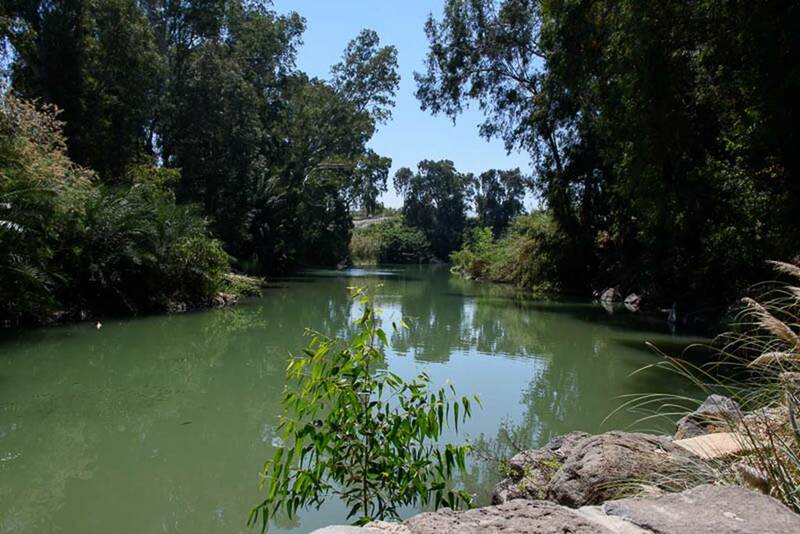 We arrive in Haifa today and have another full day tour of Nazareth and the sea of Galilee. I hope it is better.